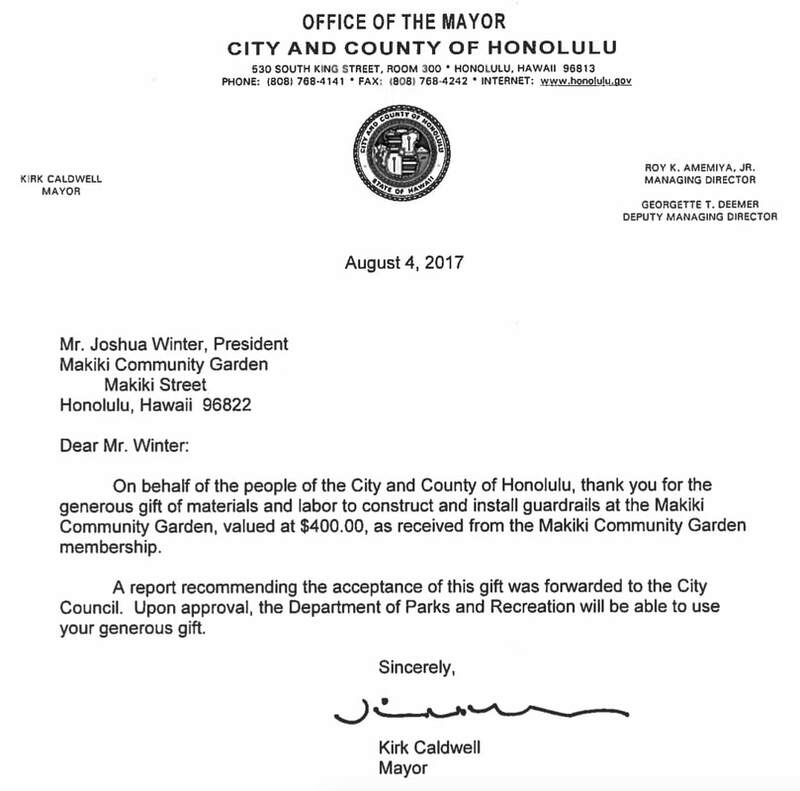 Mahalo to all those who have donated to the project. 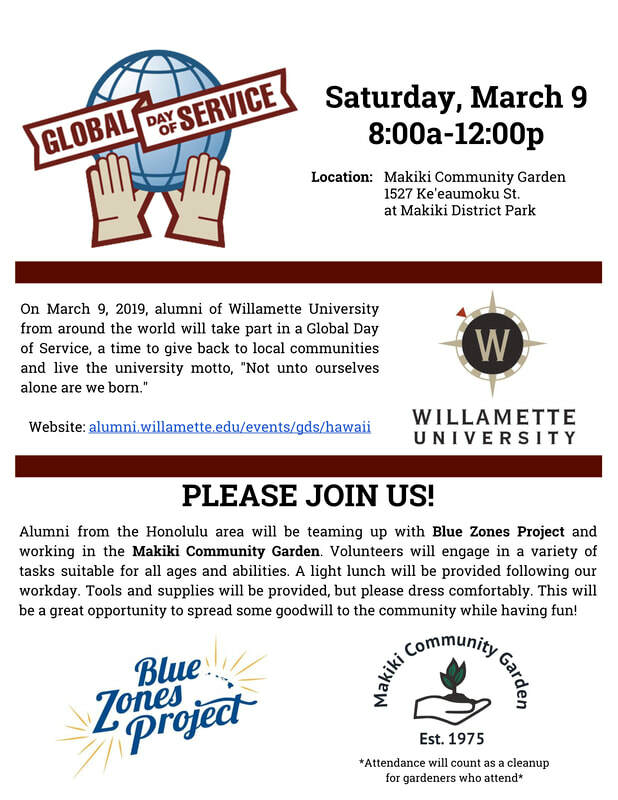 3/9/19 - Mahalo to the local Willamette University Alumni and Blue Zones Project Hawaiʻi for all their support today! 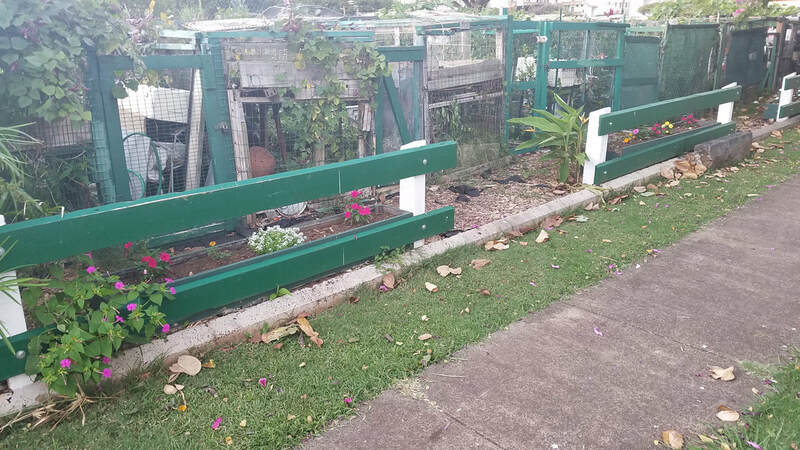 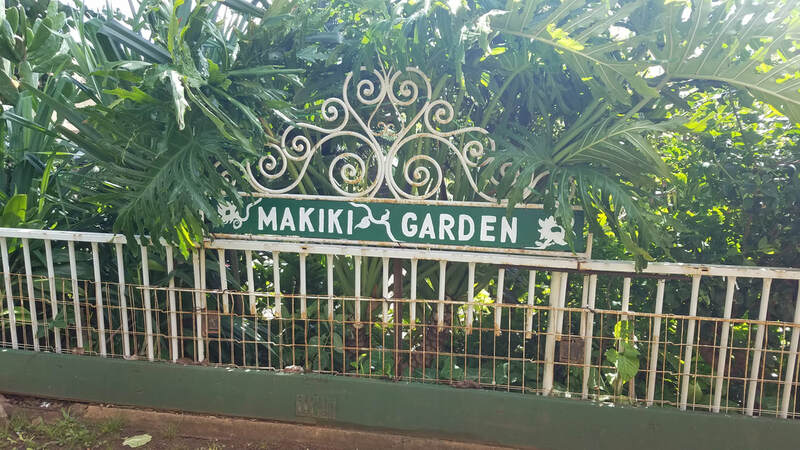 Please ask a garden officer for the location and combination. 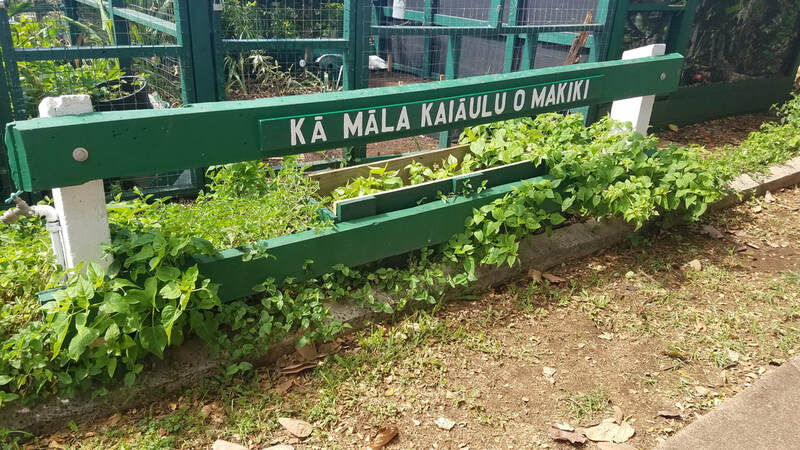 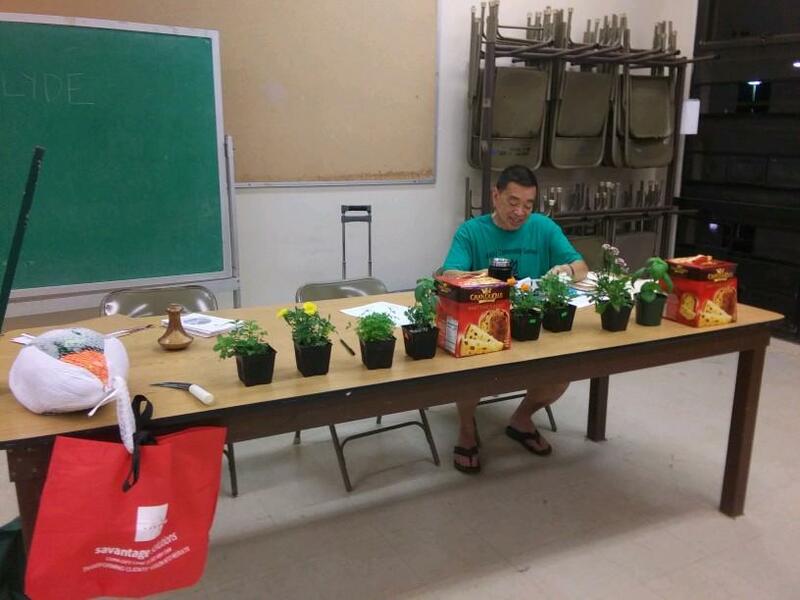 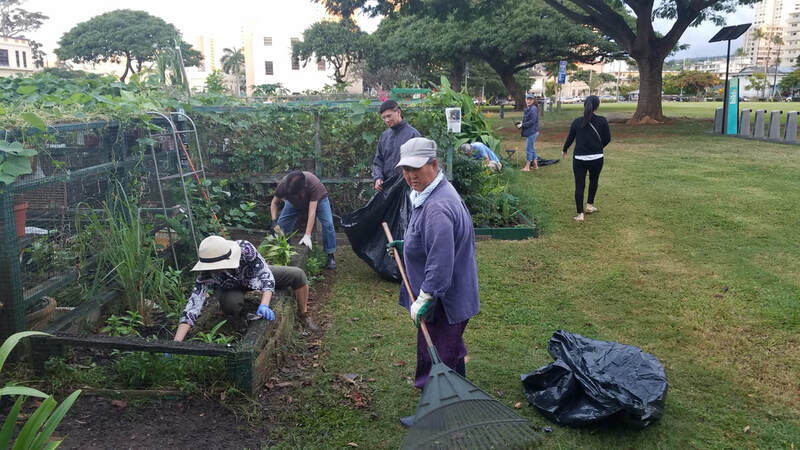 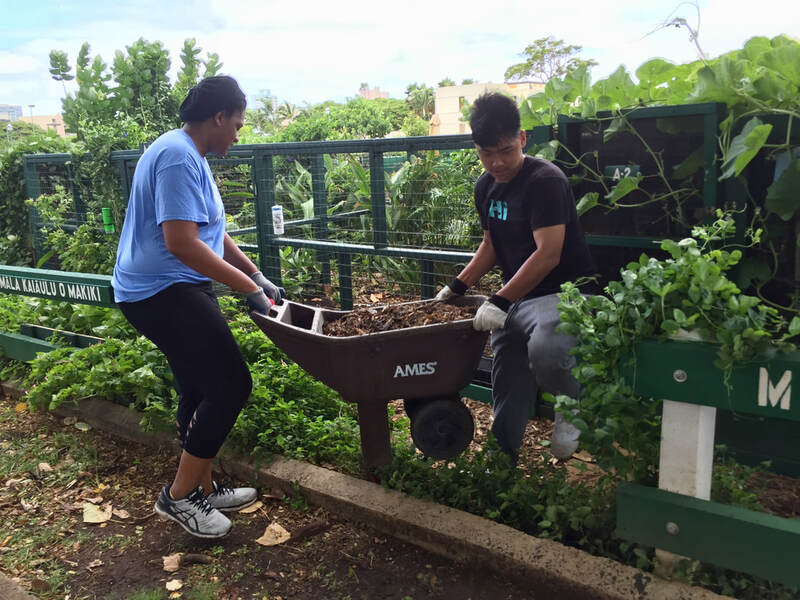 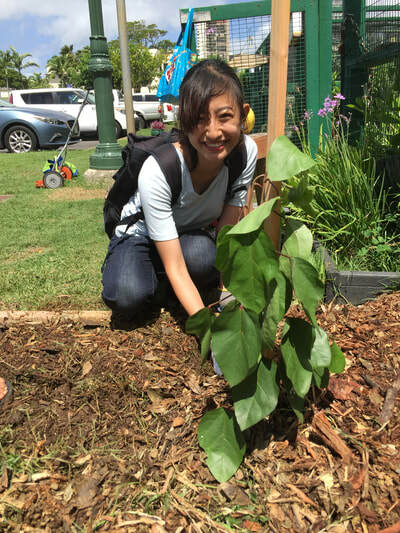 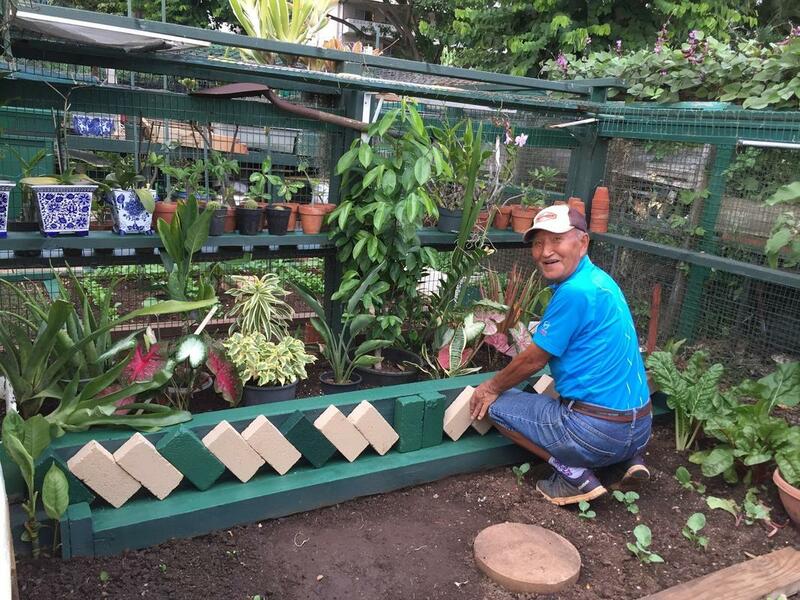 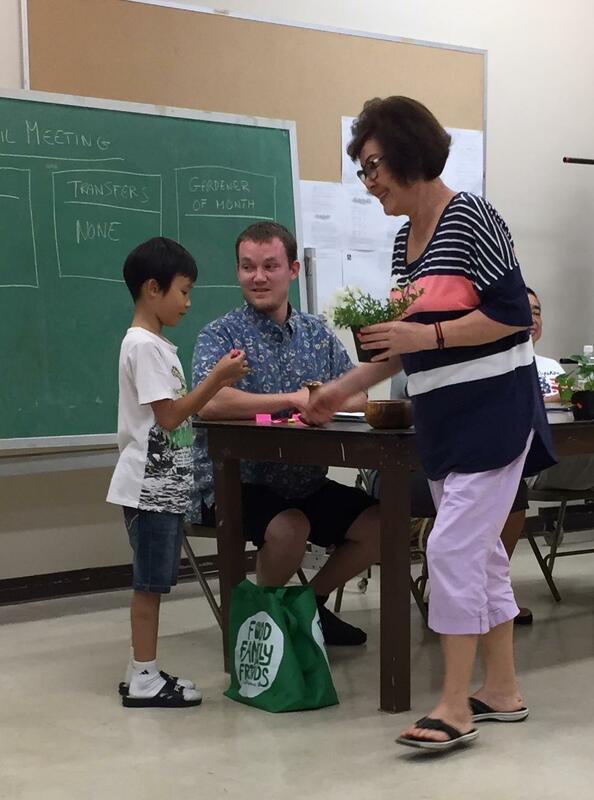 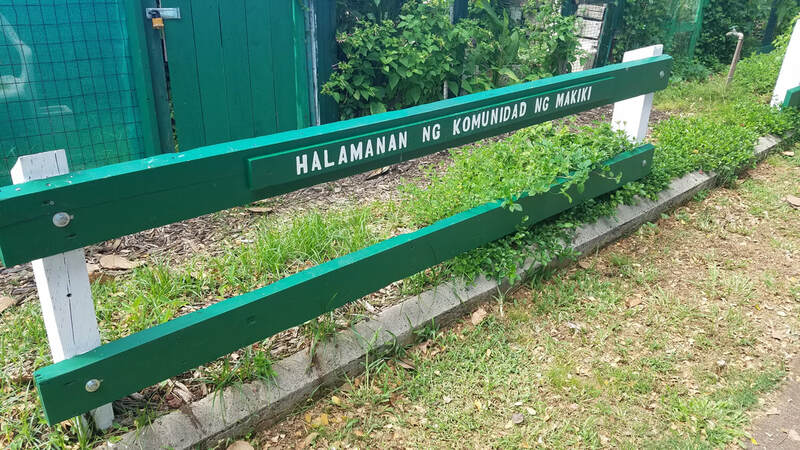 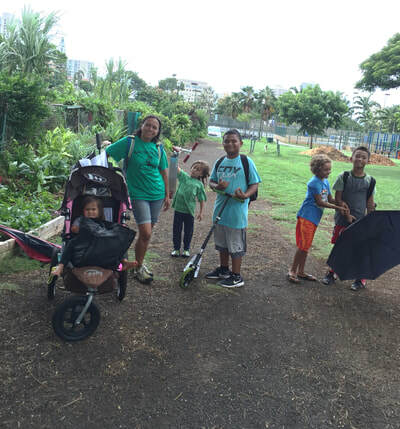 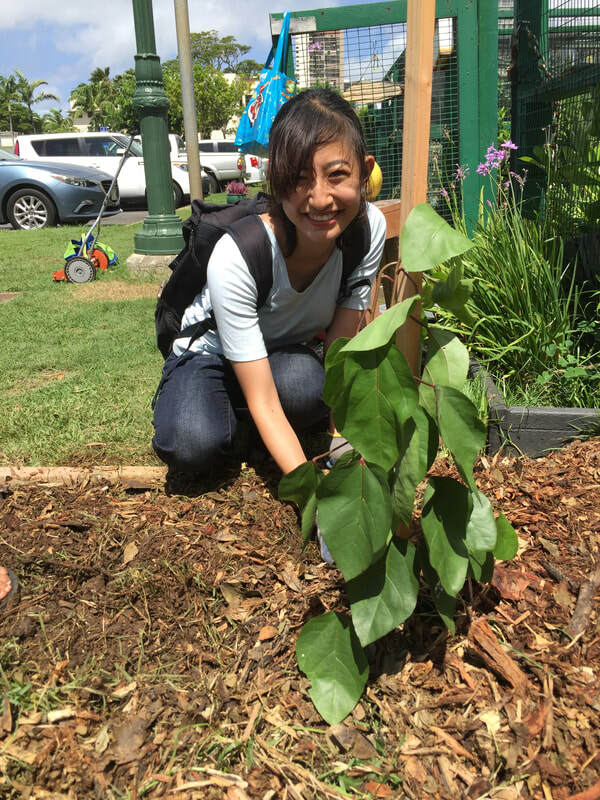 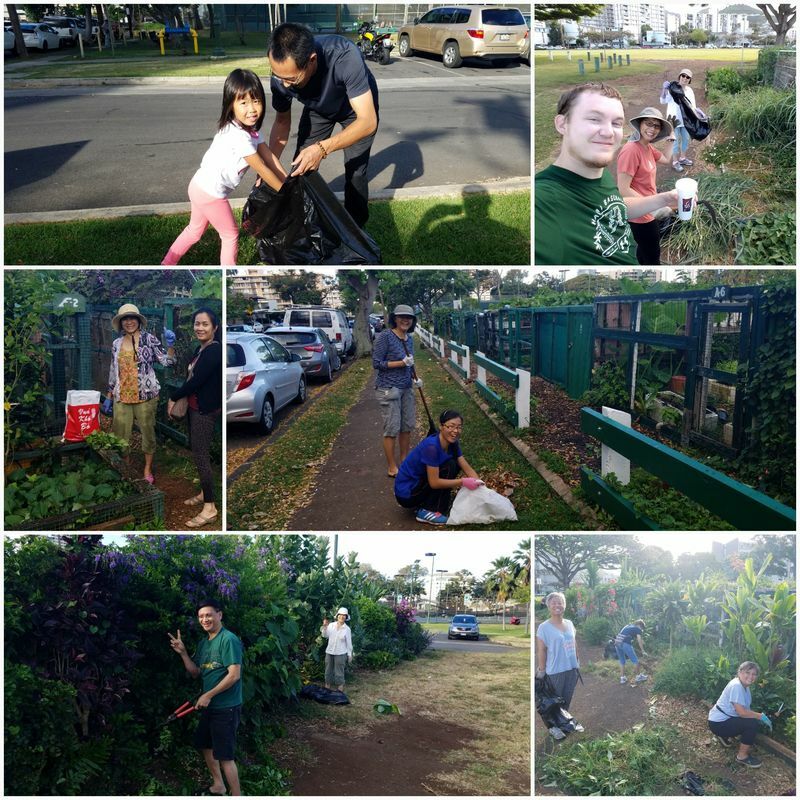 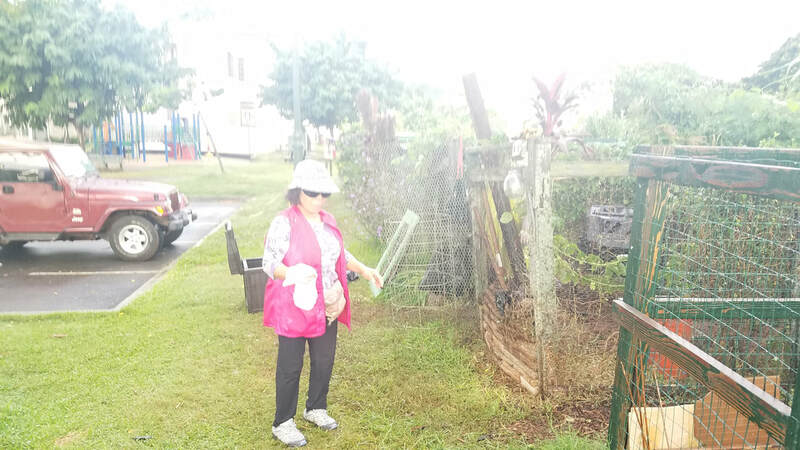 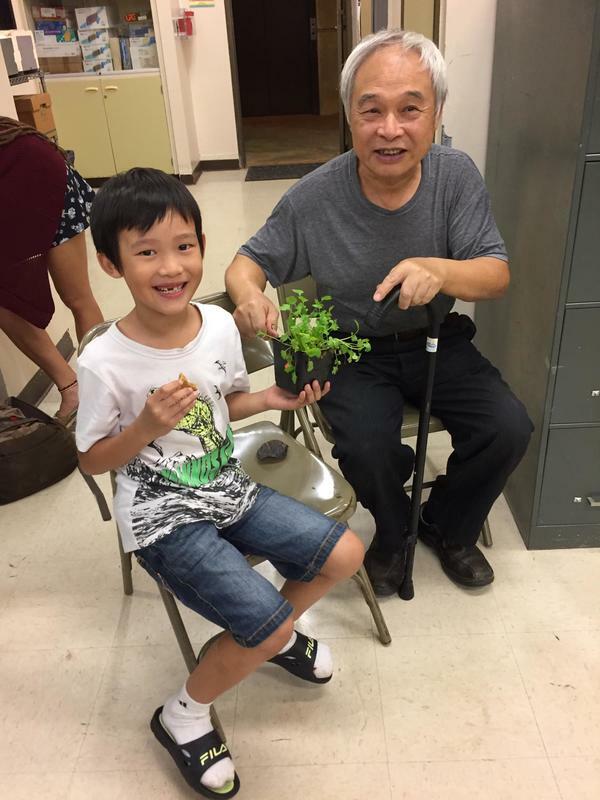 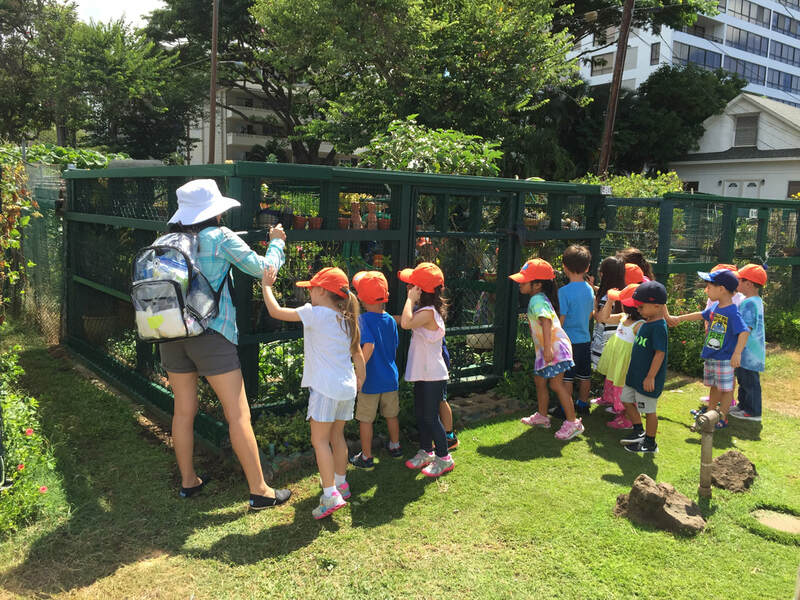 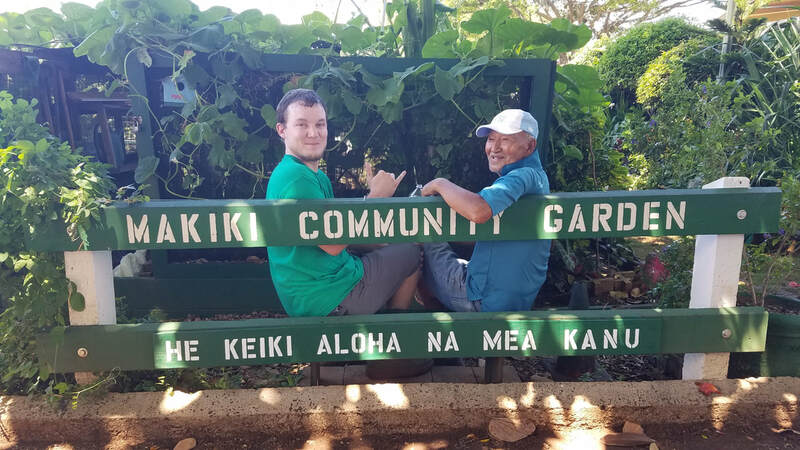 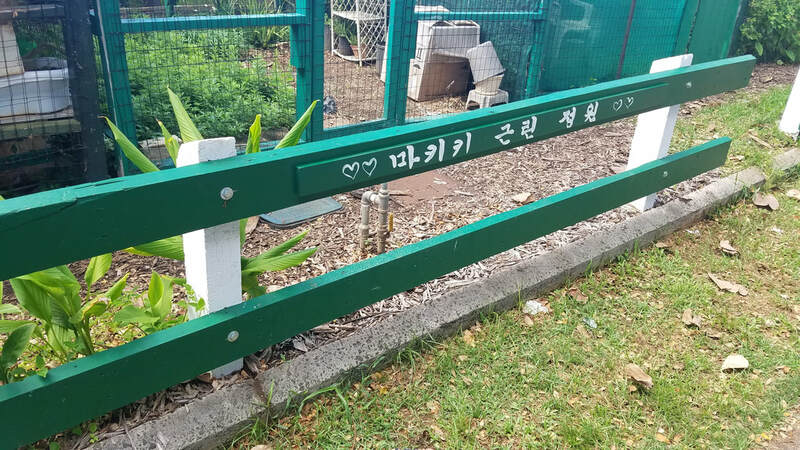 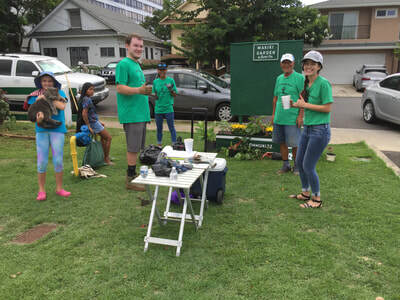 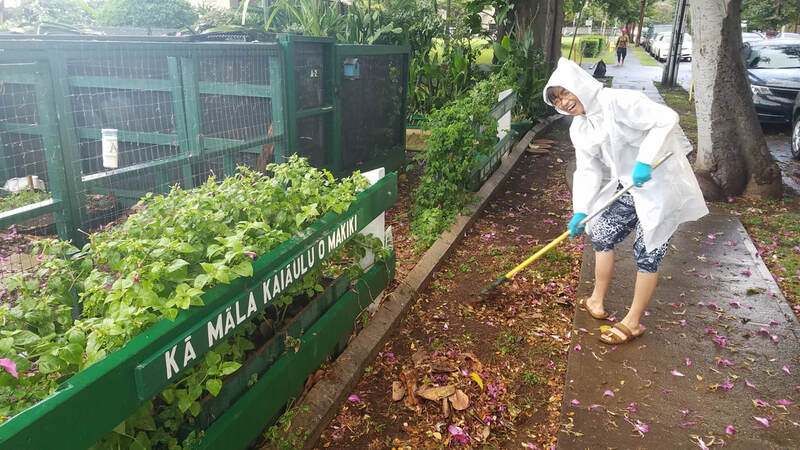 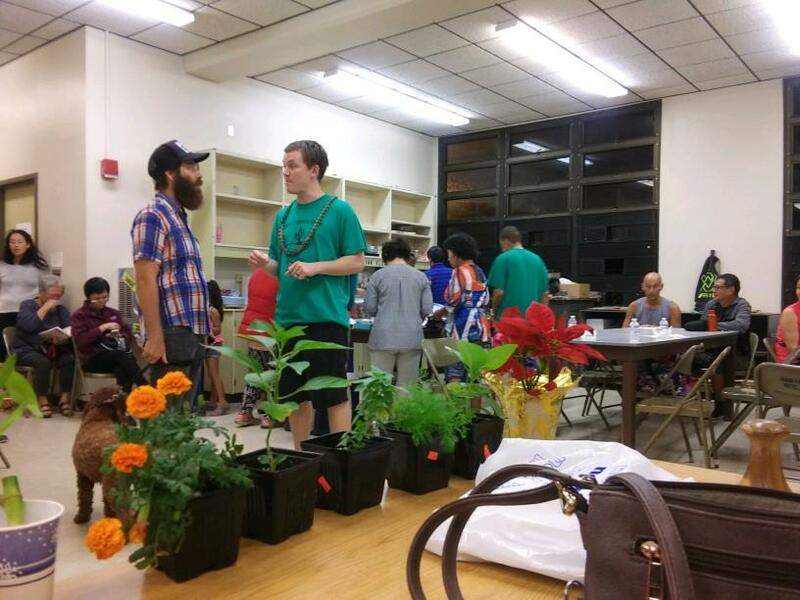 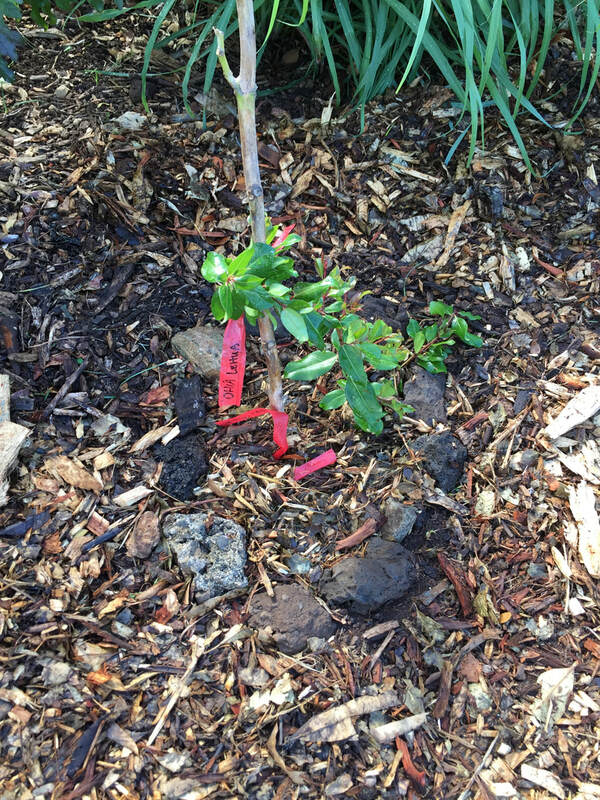 Mahalo to those gardeners who have already made signs in ʻŌlelo Hawaiʻi, Chinese, Japanese, Korean, and Tagalog. 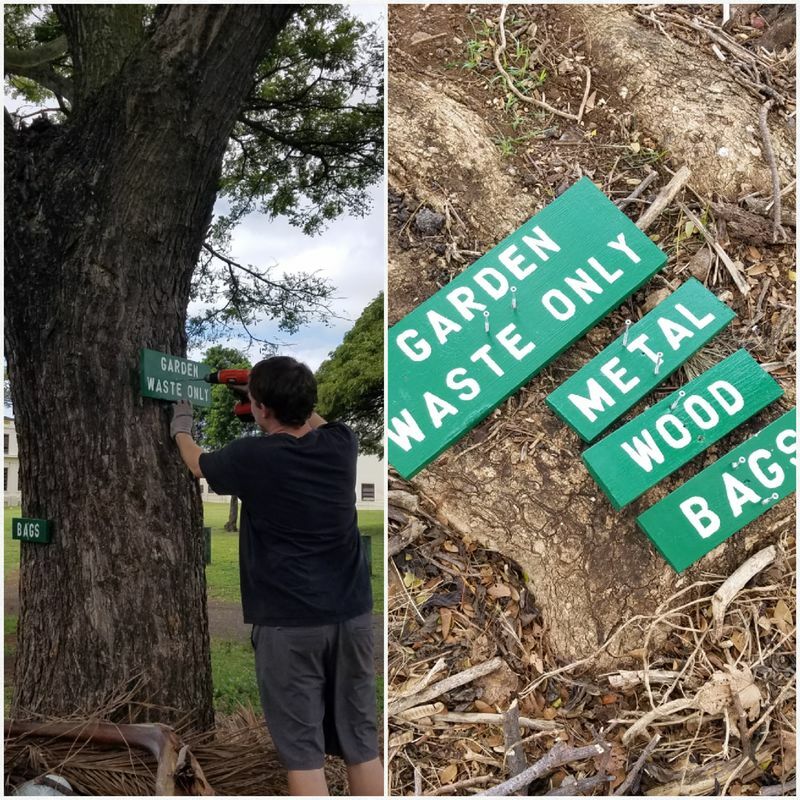 Please let a garden officer know if you are willing and able to make a sign. 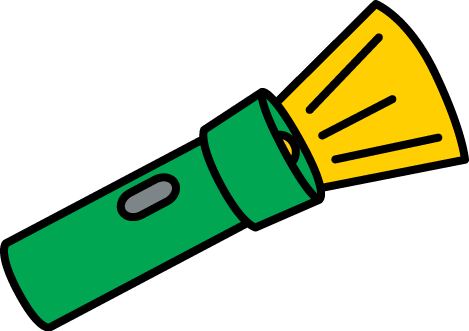 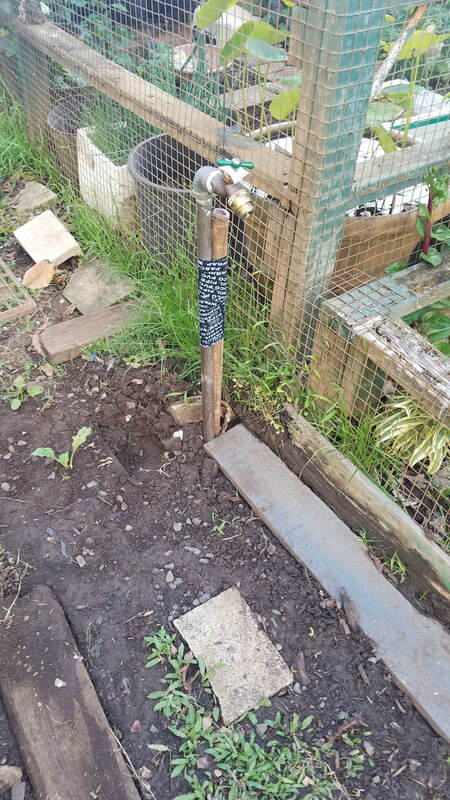 2/12/19 - Did you lose a flashlight in the garden? 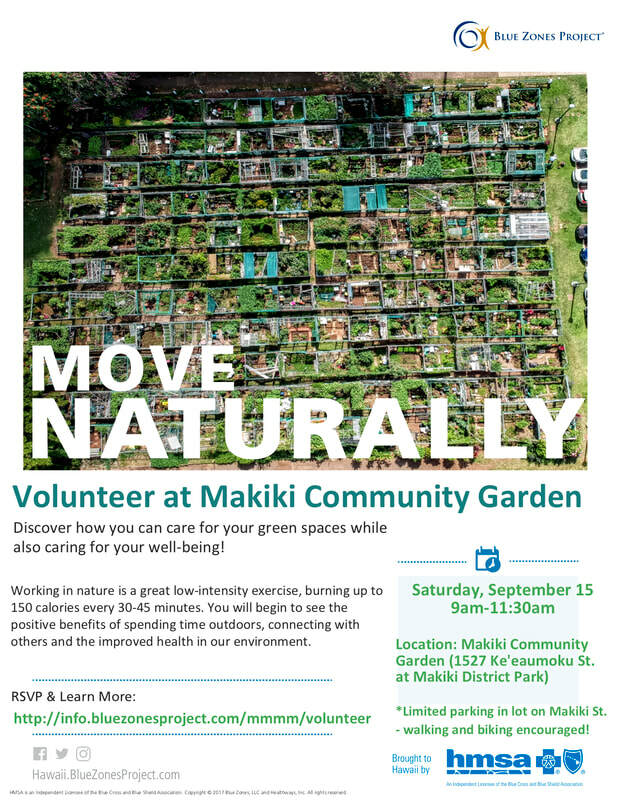 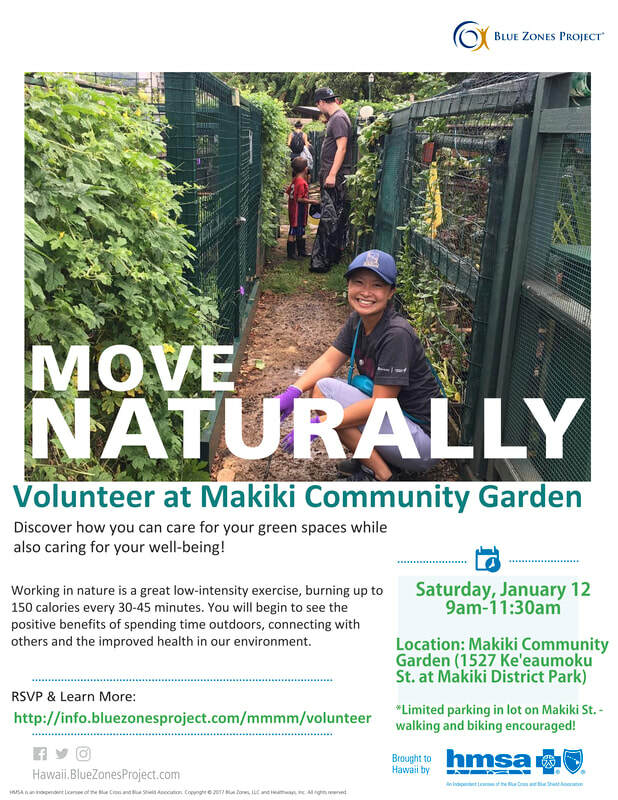 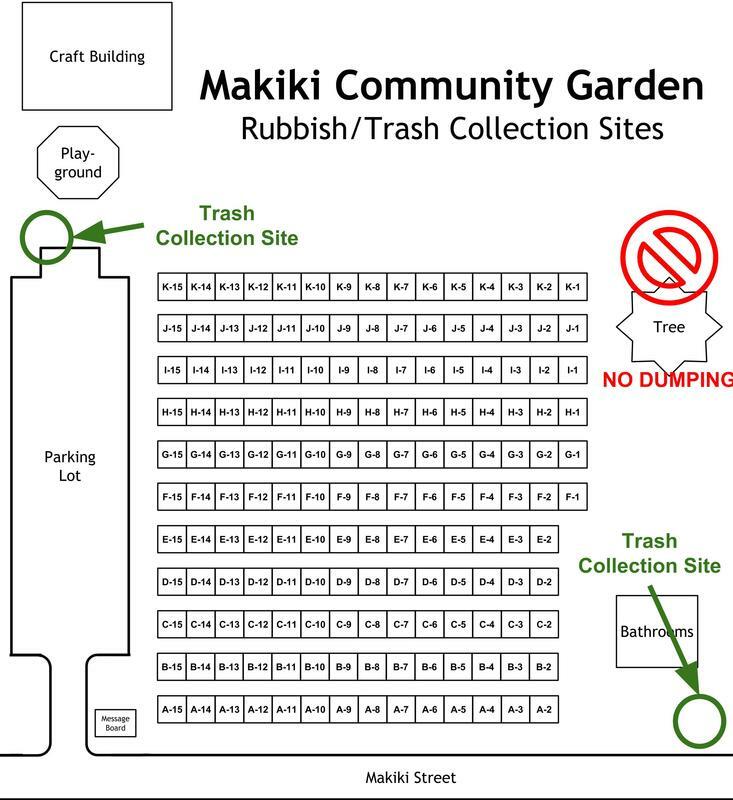 Please contact us at makikicommunitygarden@gmail.com with a description. 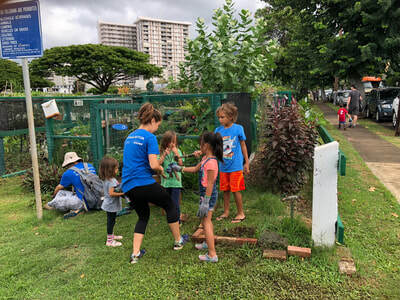 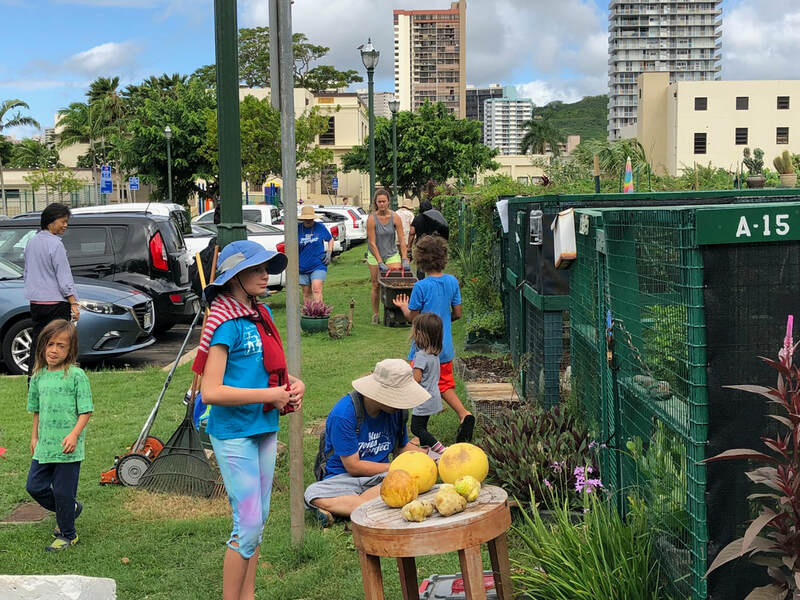 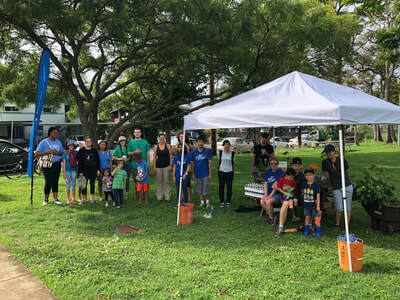 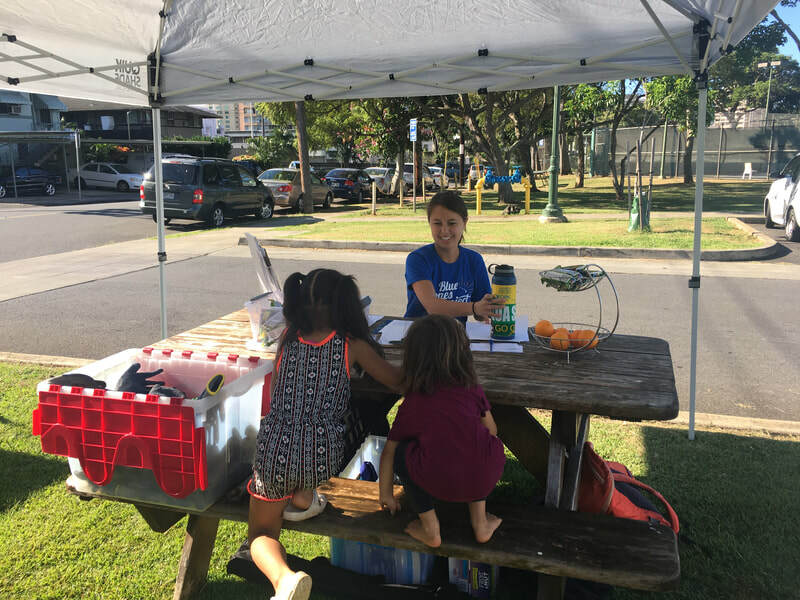 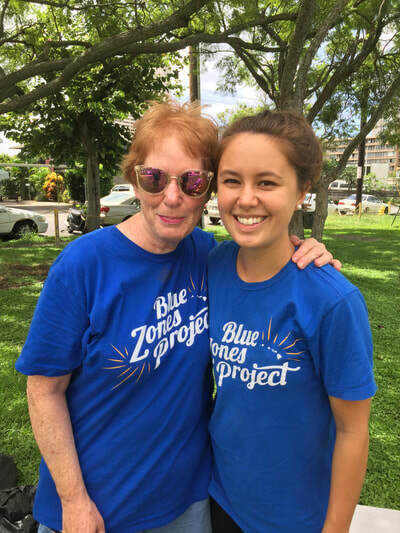 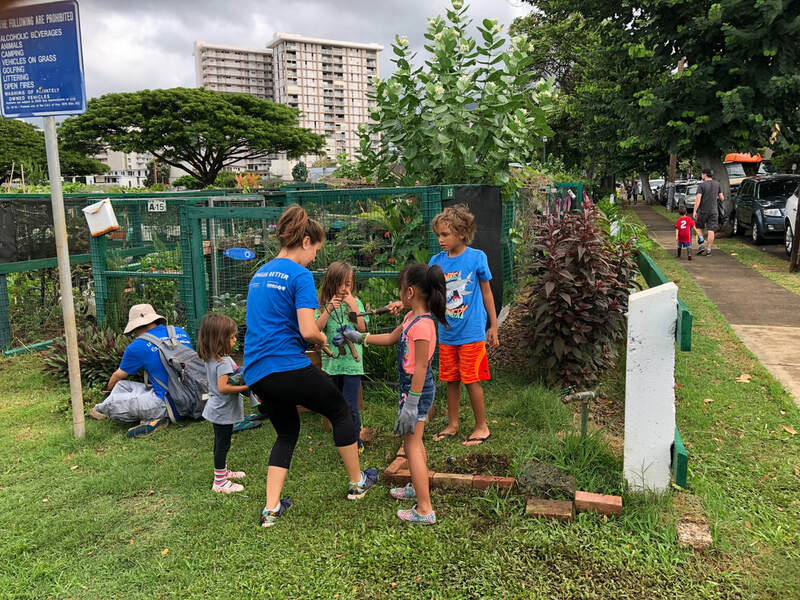 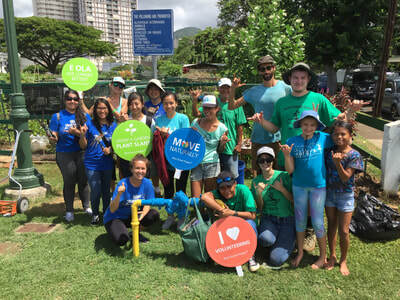 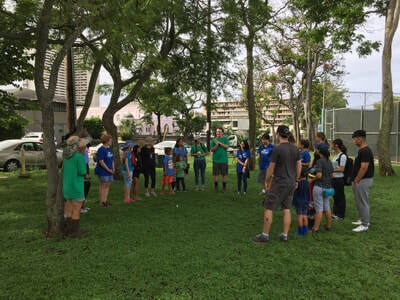 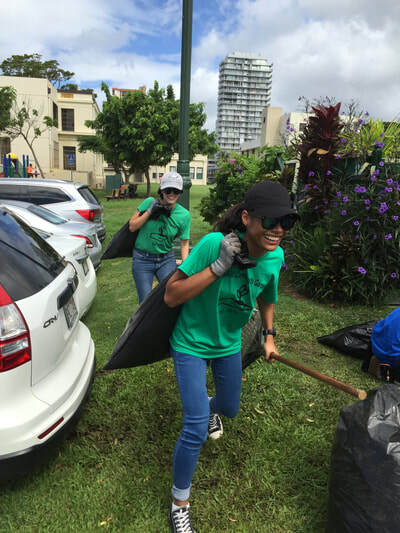 1/12/19 - Mahalo to Blue Zones Project Hawaiʻi for all their support today! 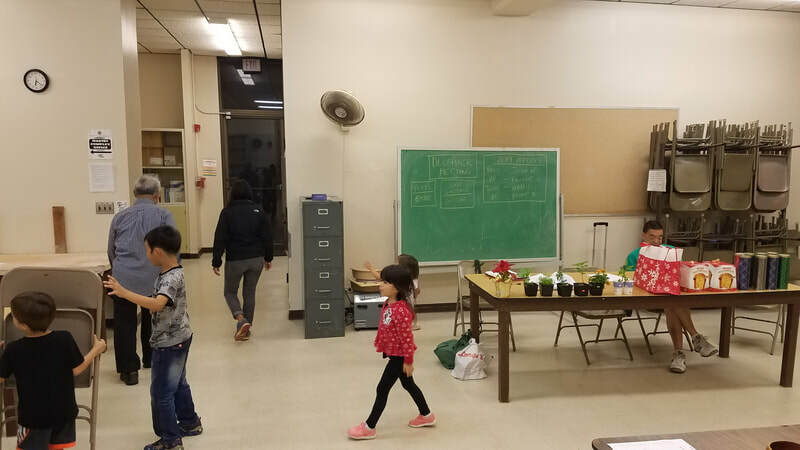 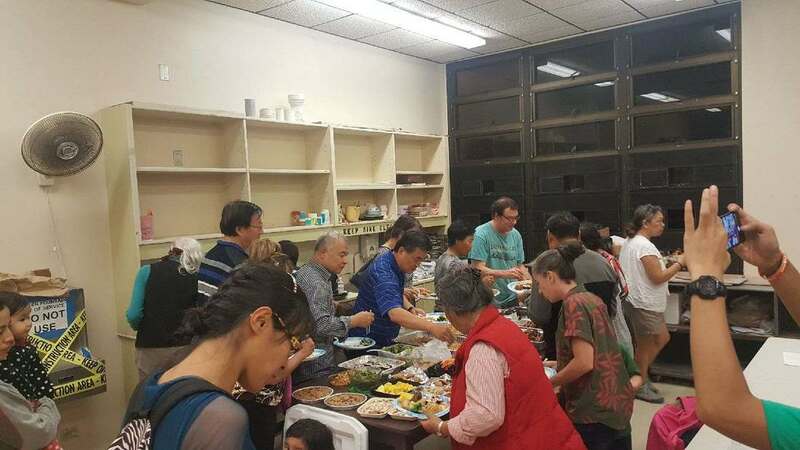 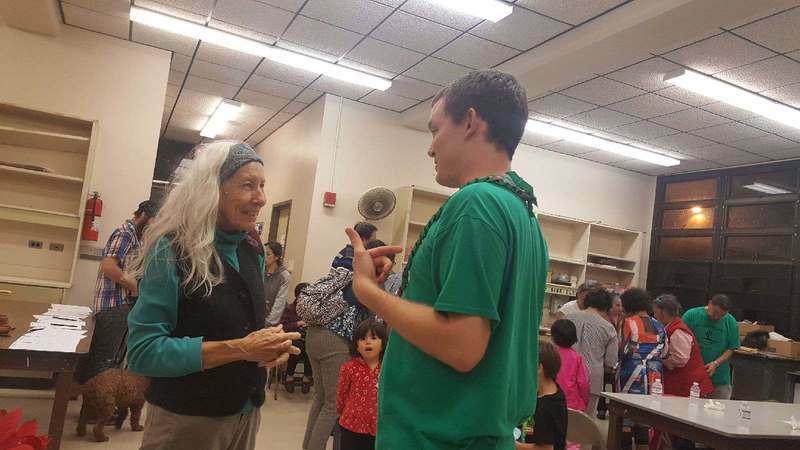 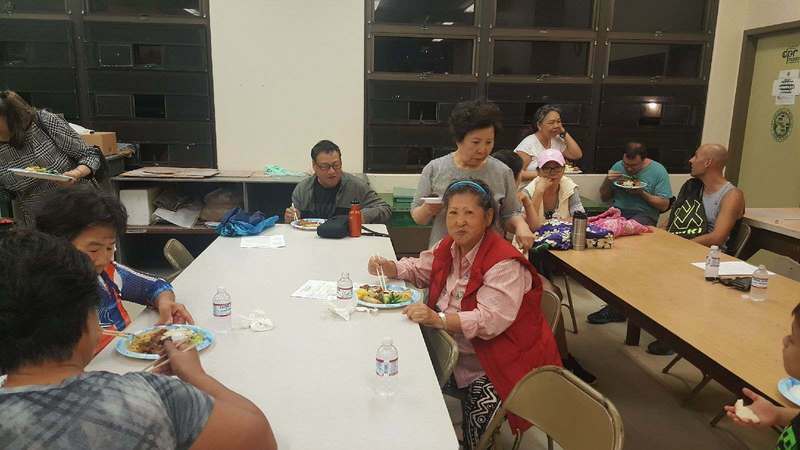 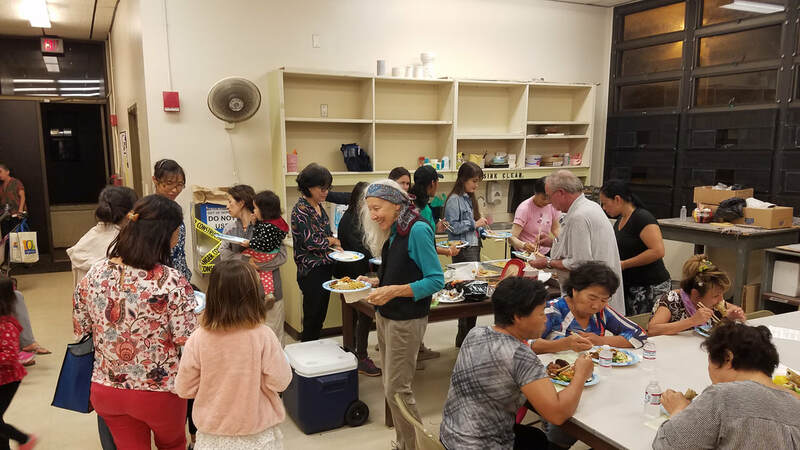 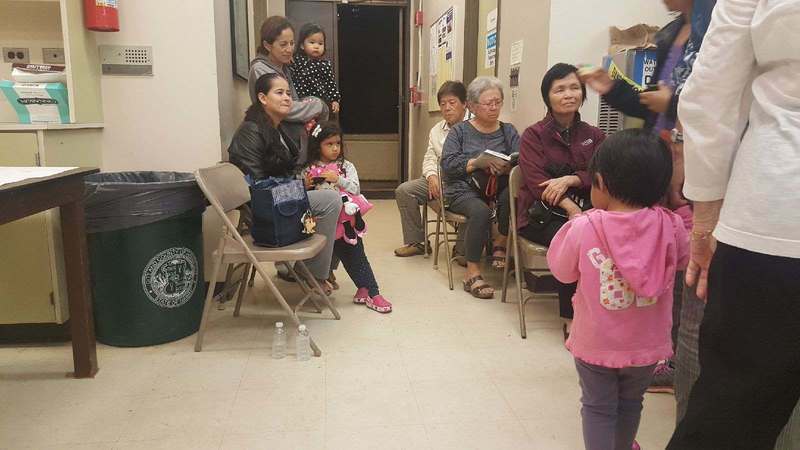 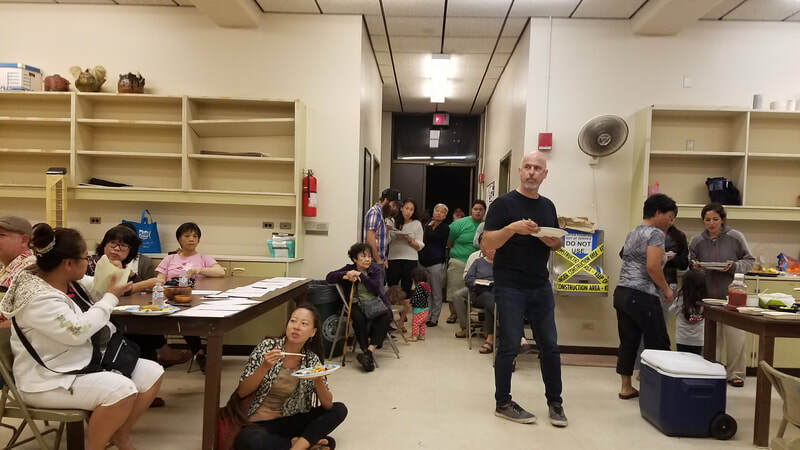 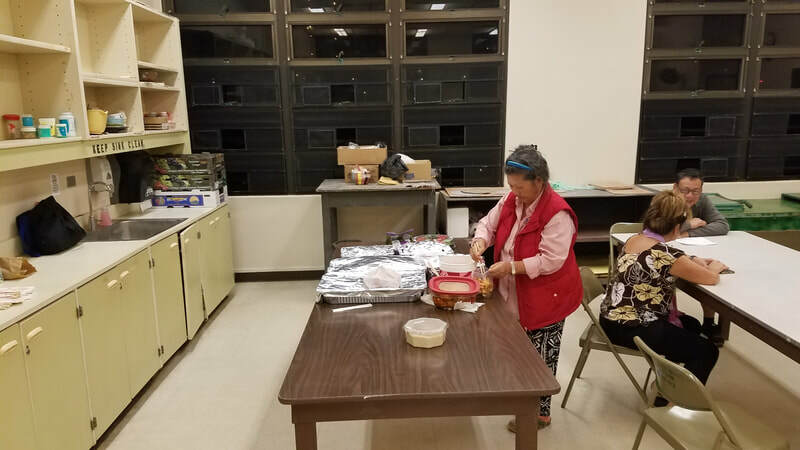 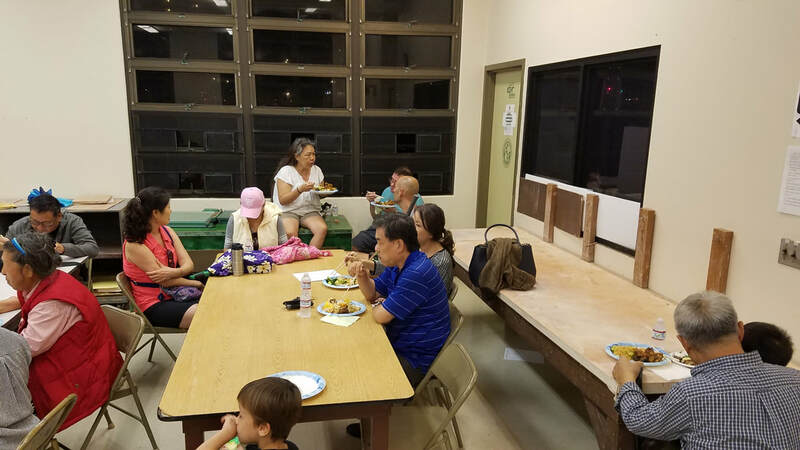 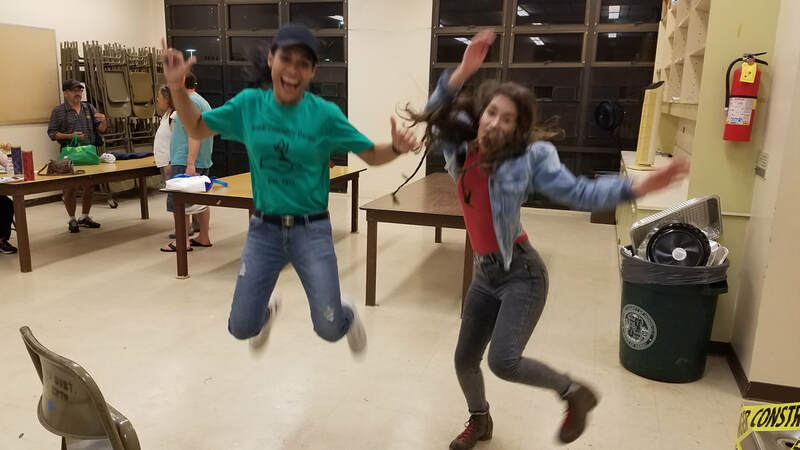 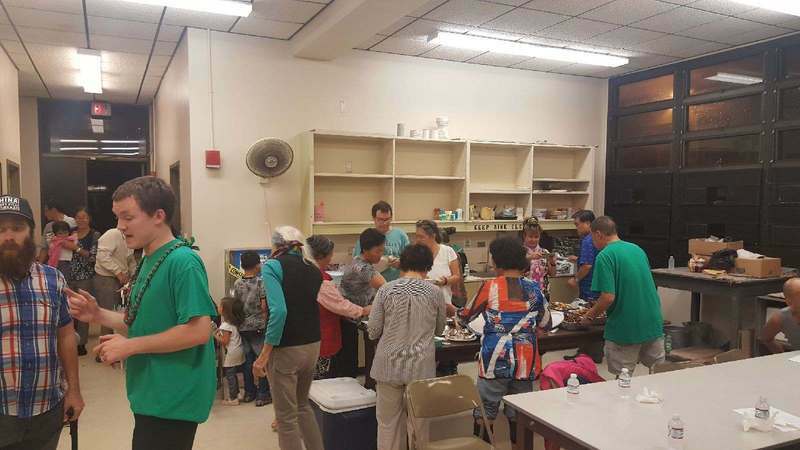 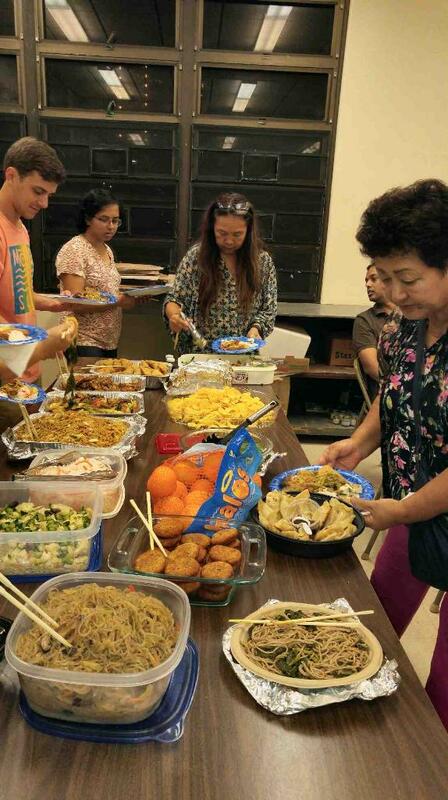 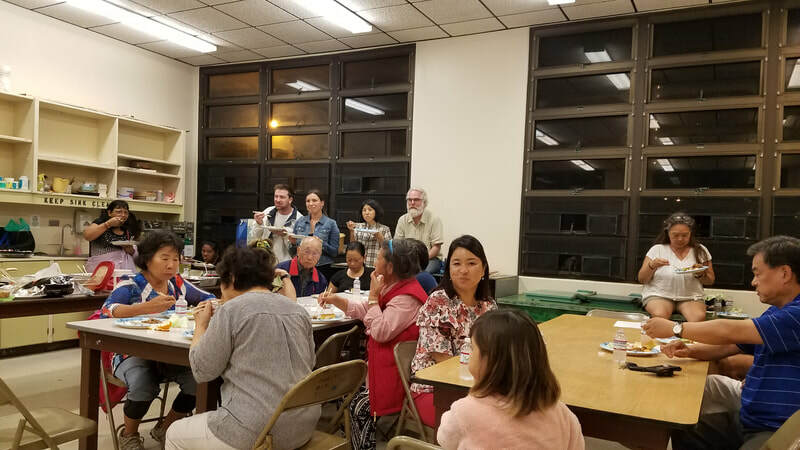 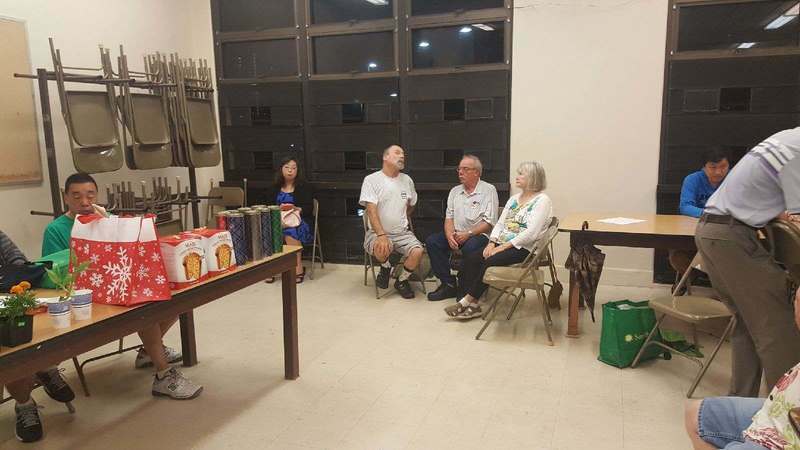 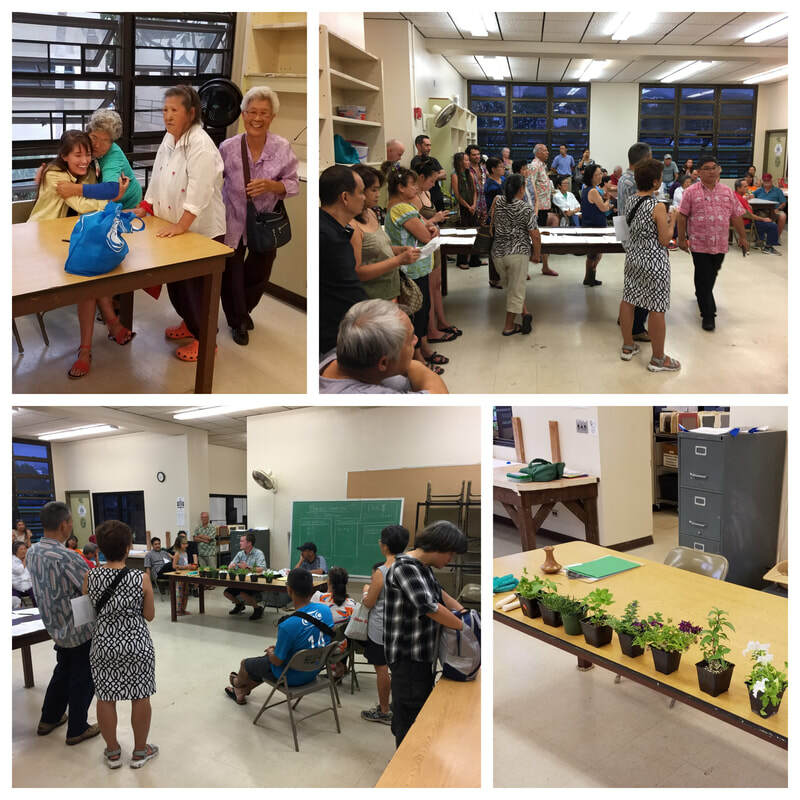 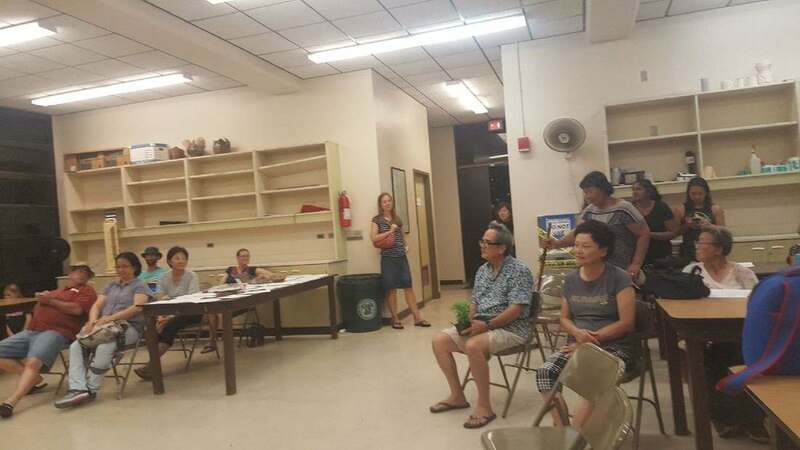 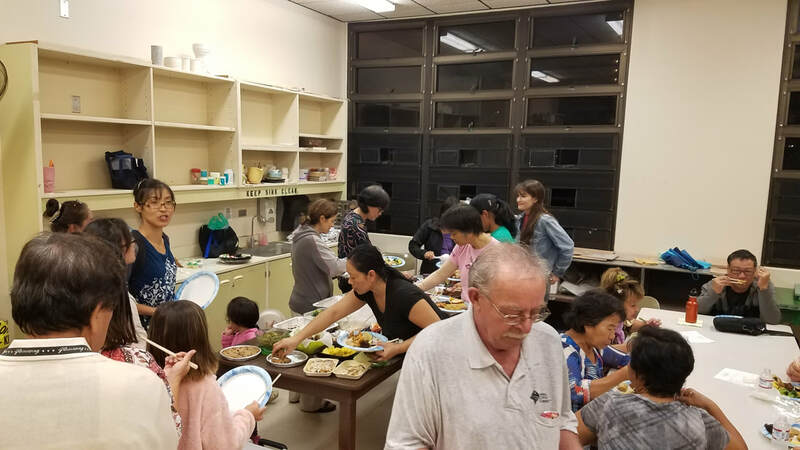 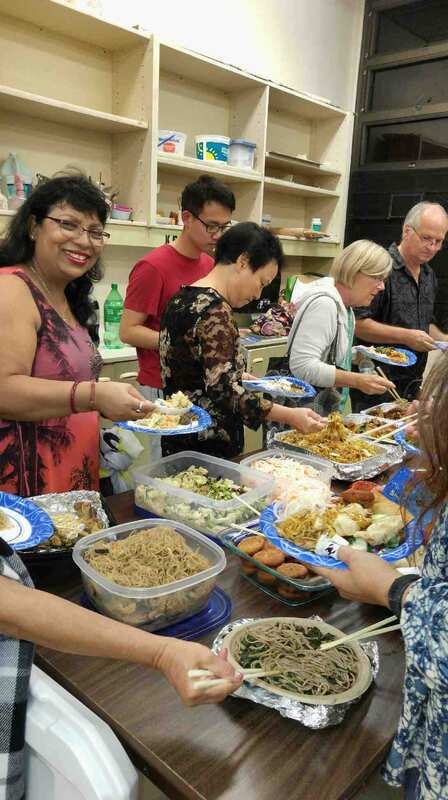 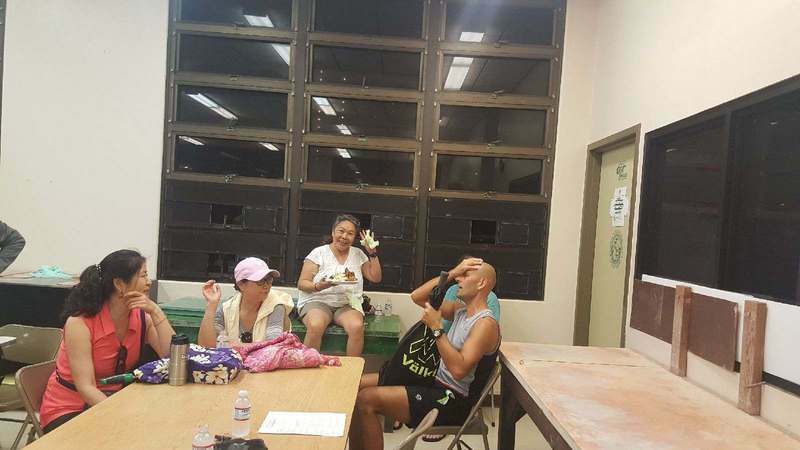 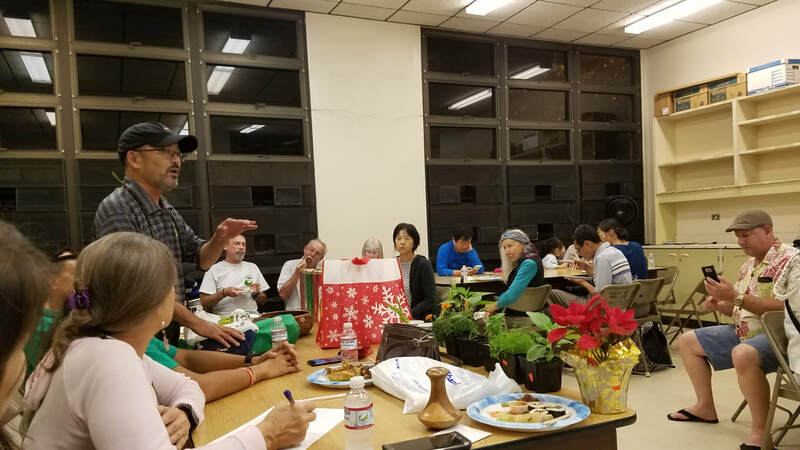 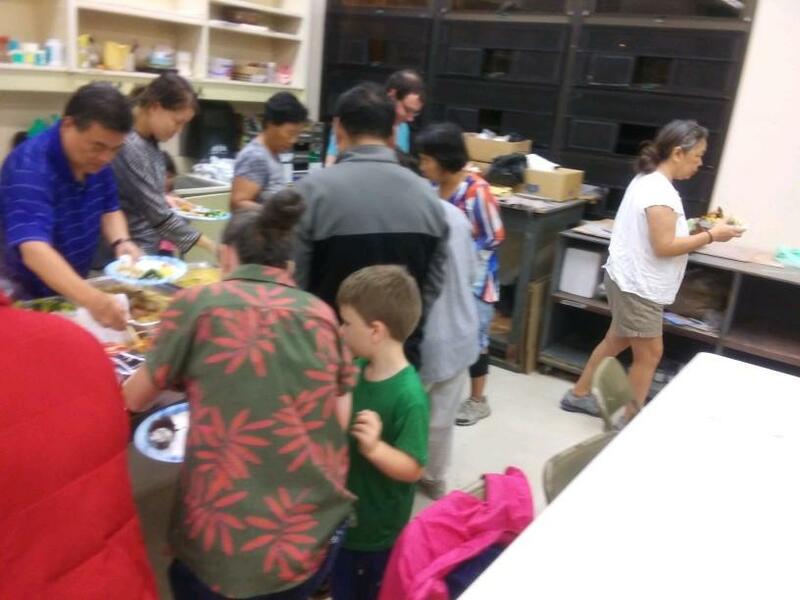 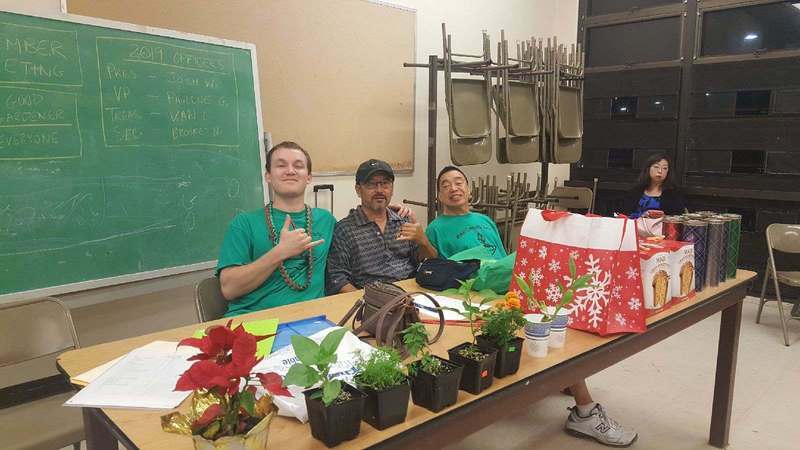 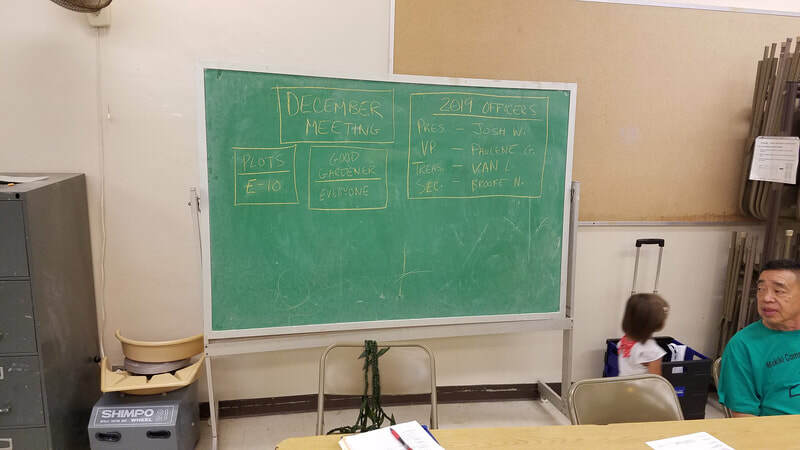 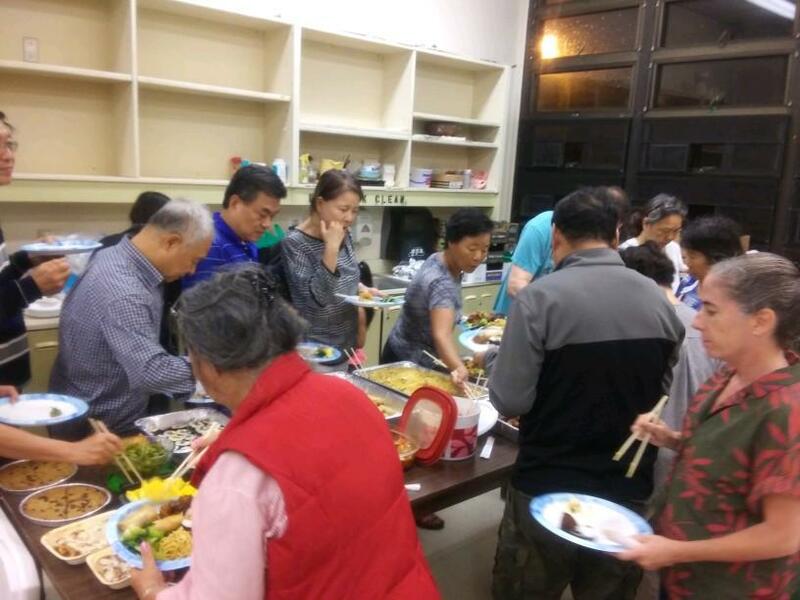 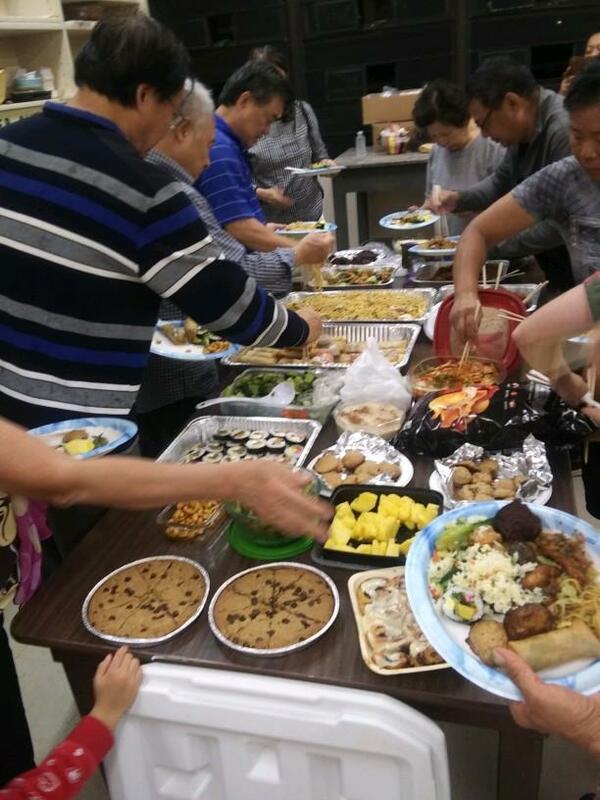 12/11/18 - Mahalo to all those who attended our Holiday Potluck! 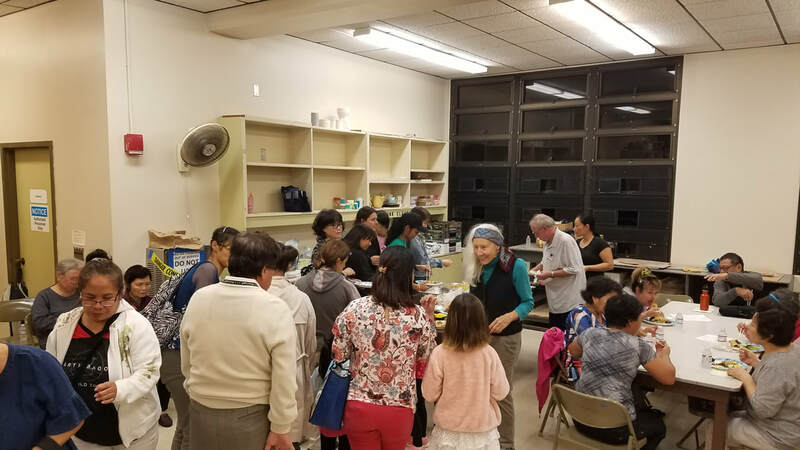 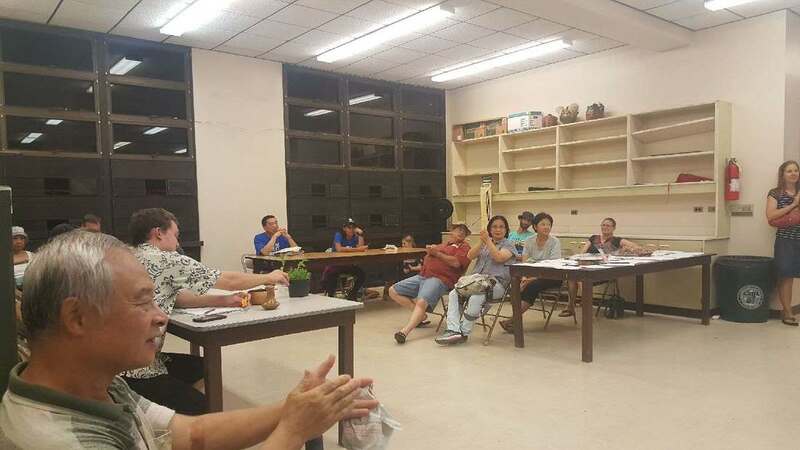 11/28/18 - Big mahalo to Biki for finally coming to Makiki! 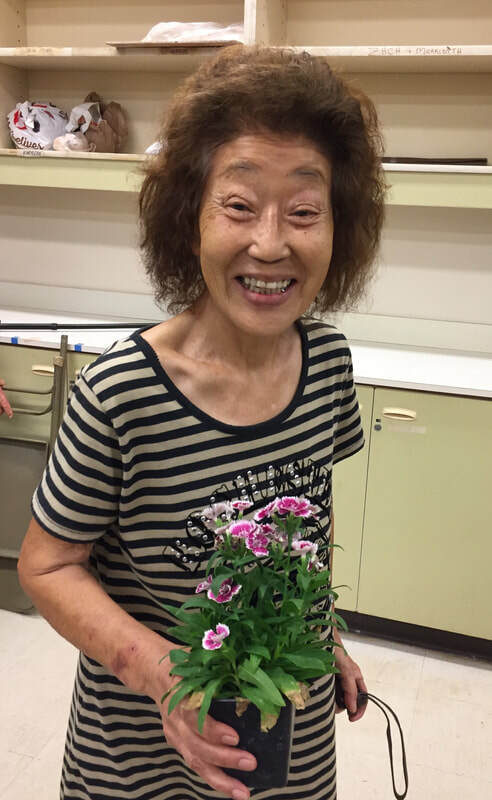 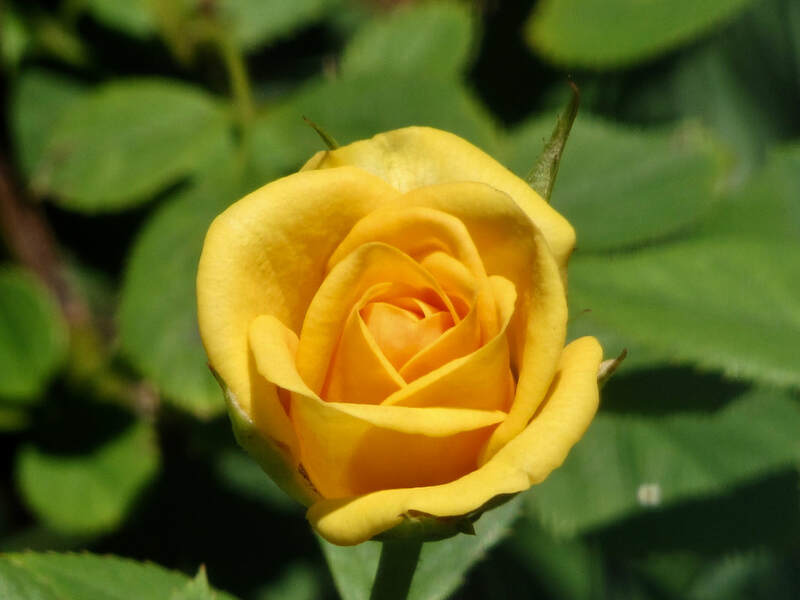 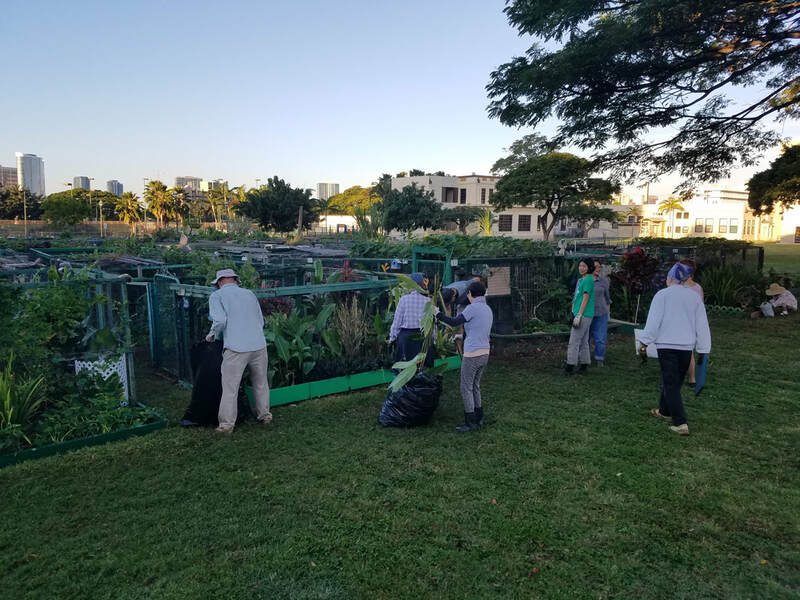 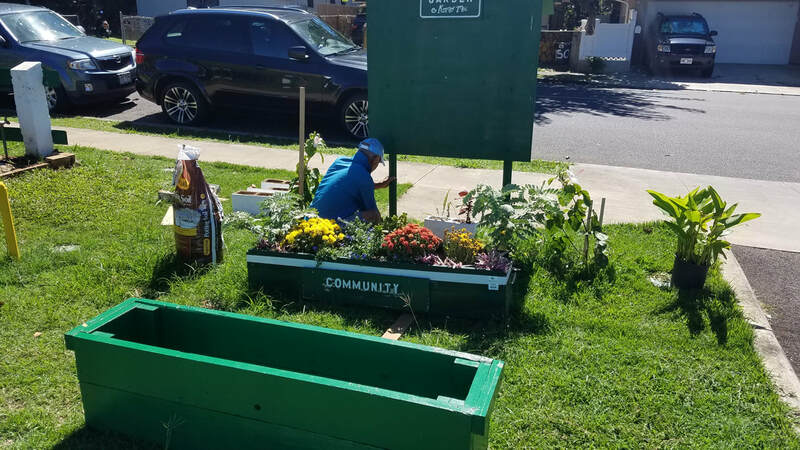 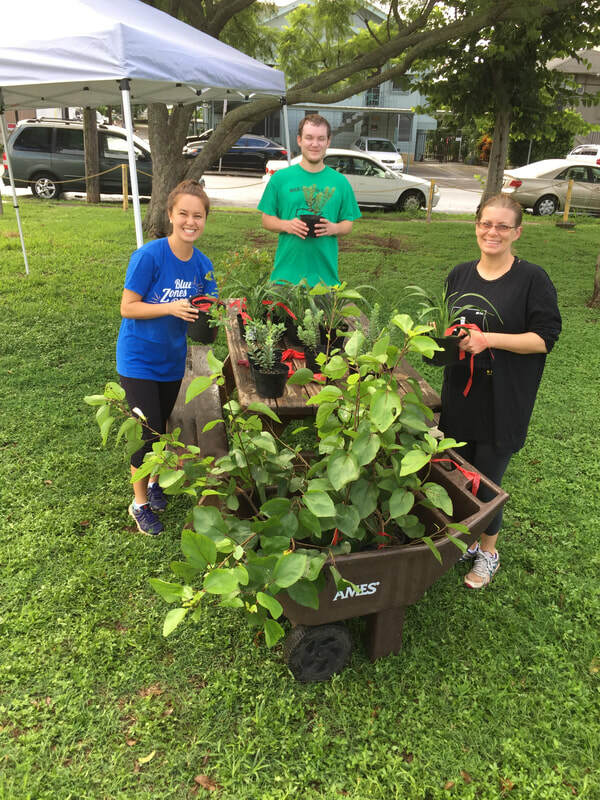 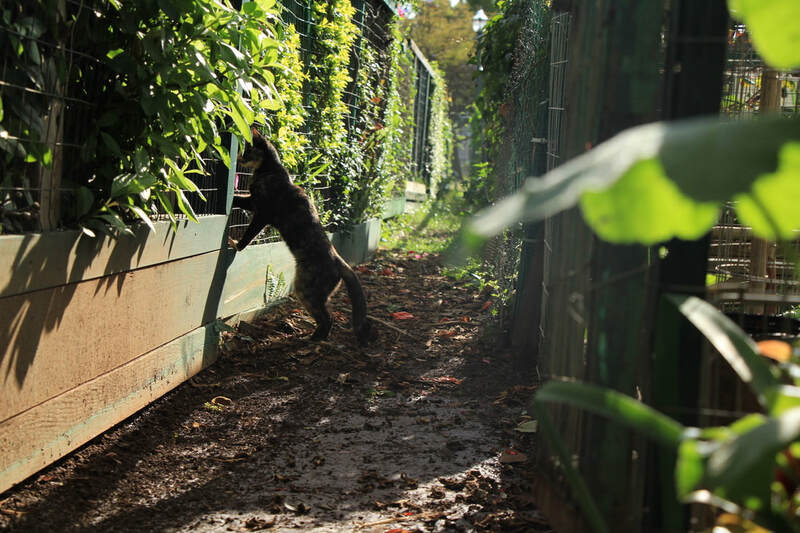 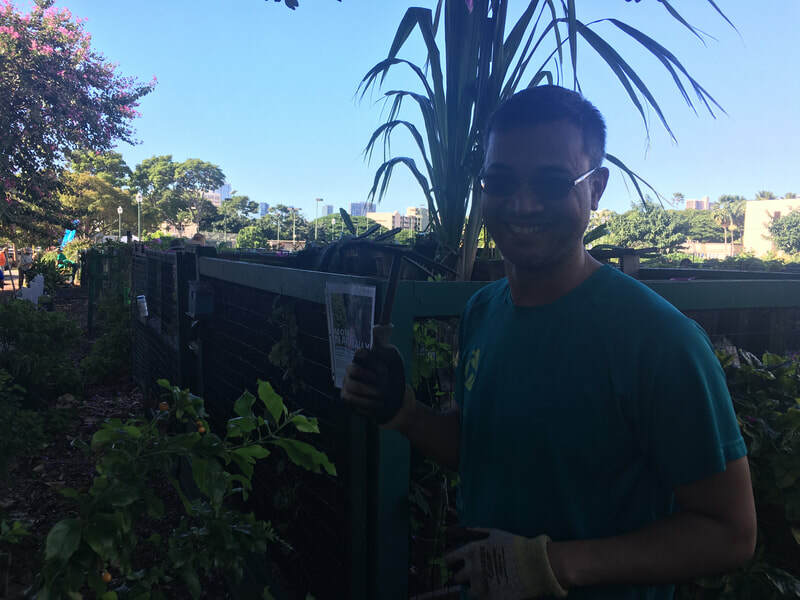 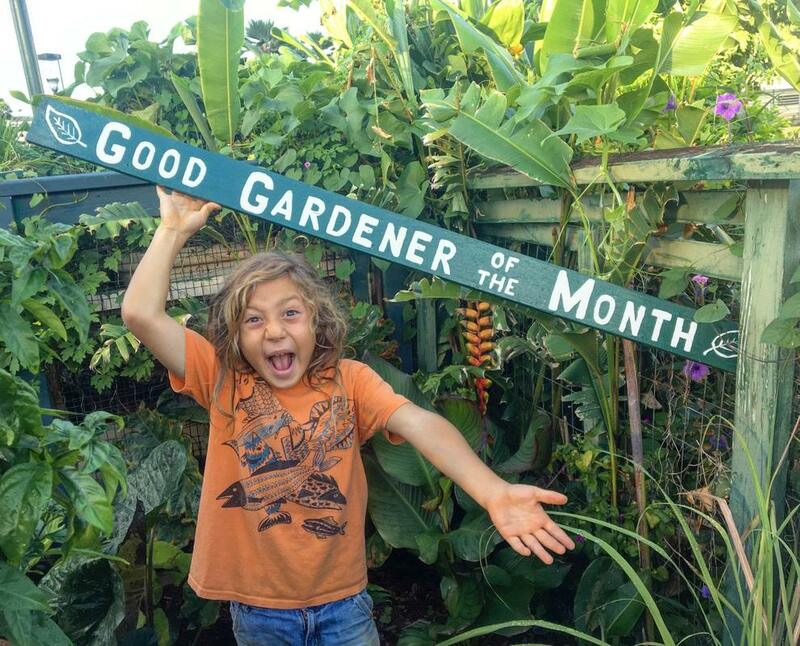 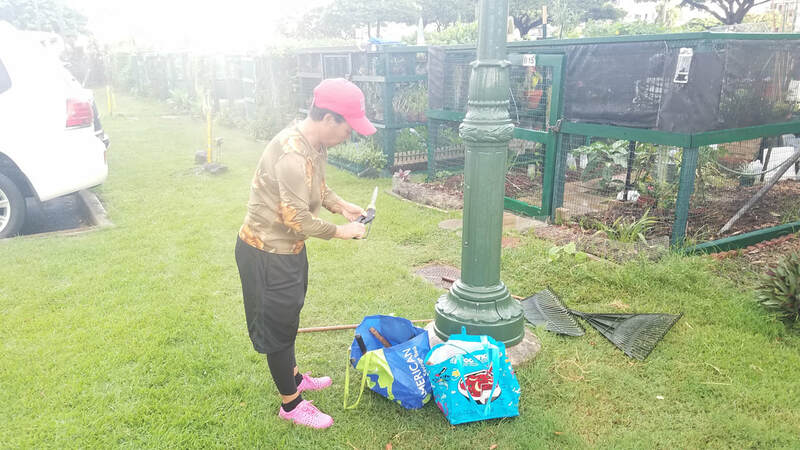 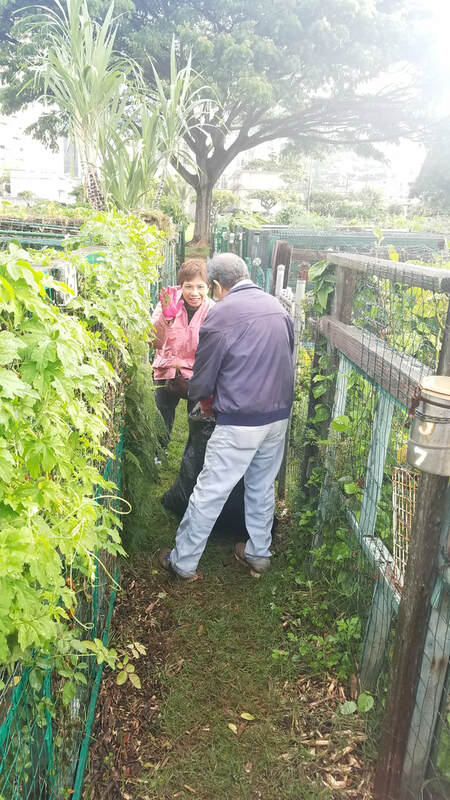 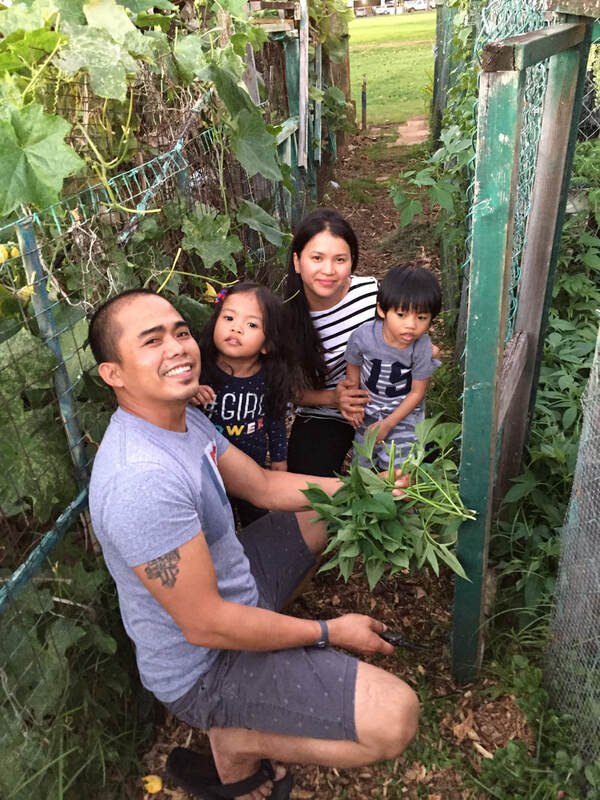 10/14/18 - Congrats again to our October Good Gardener of the Month! 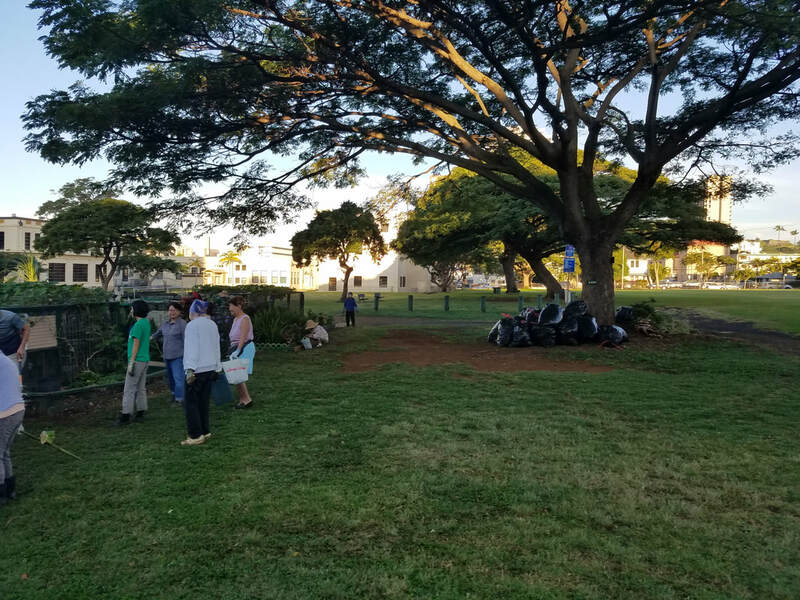 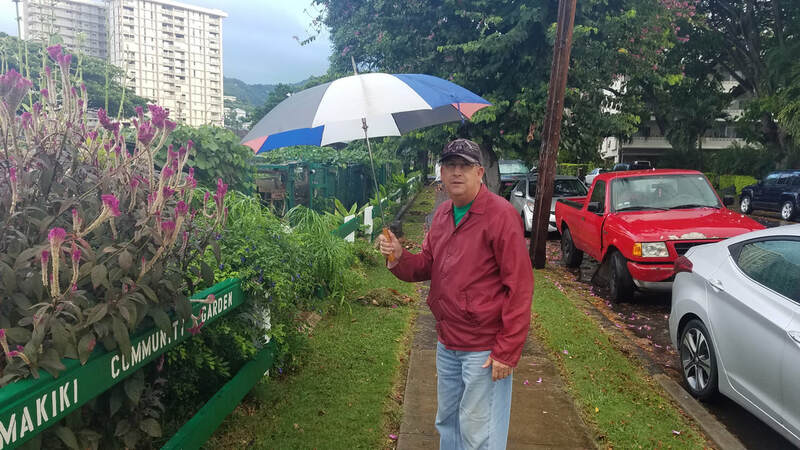 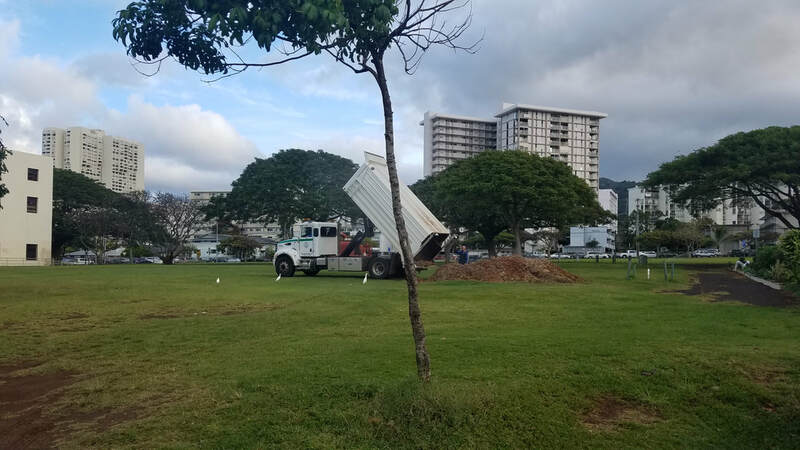 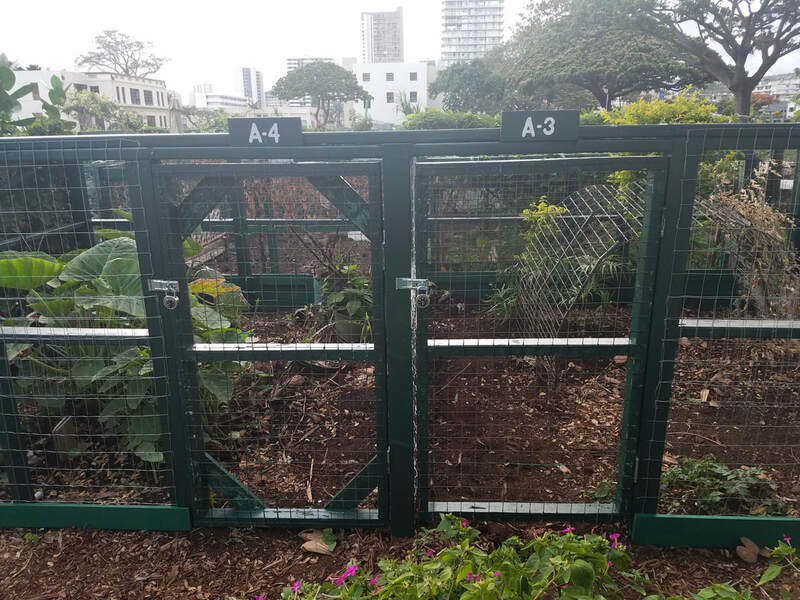 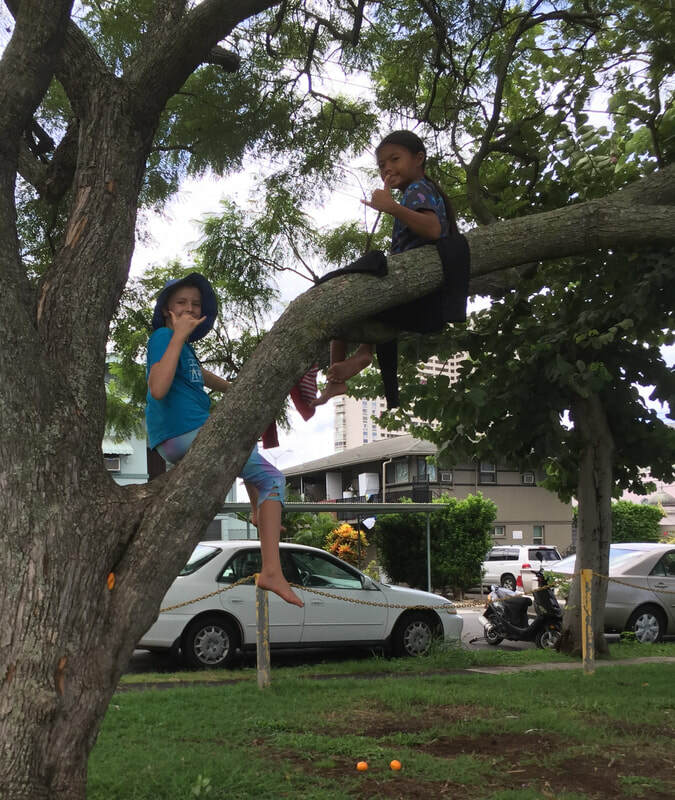 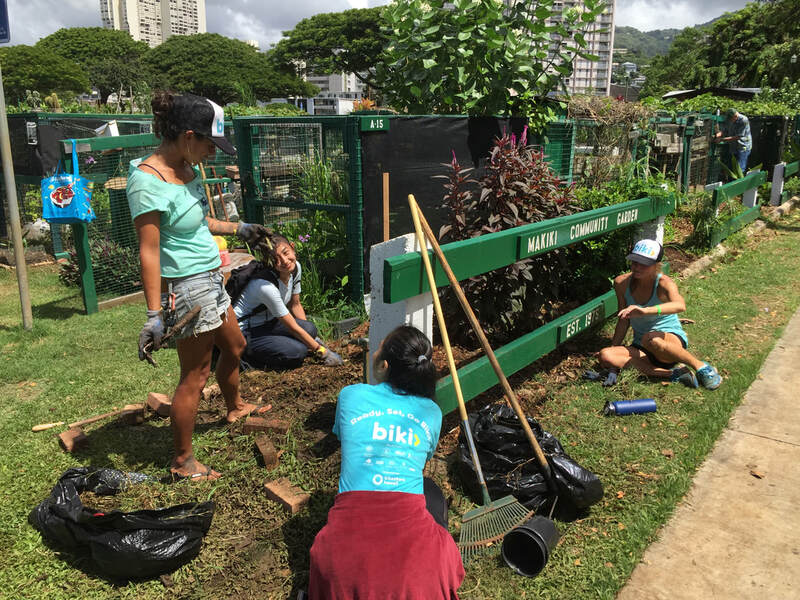 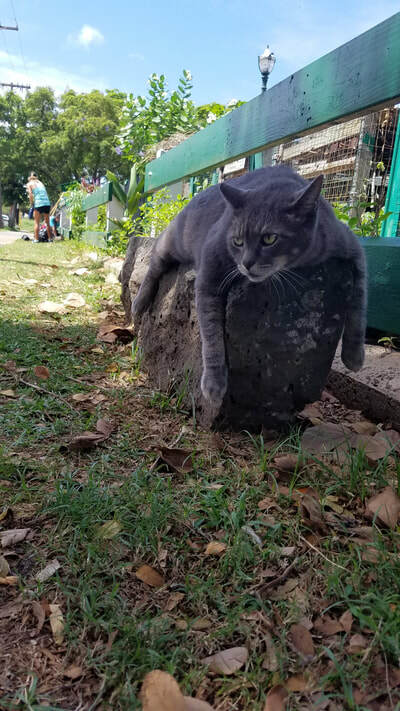 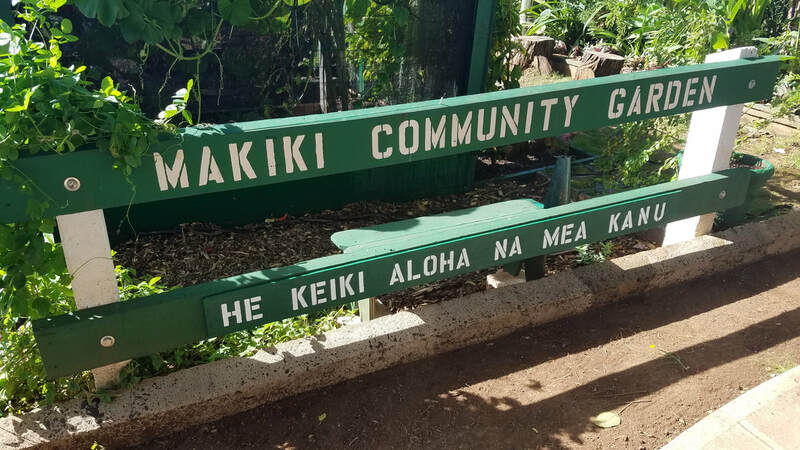 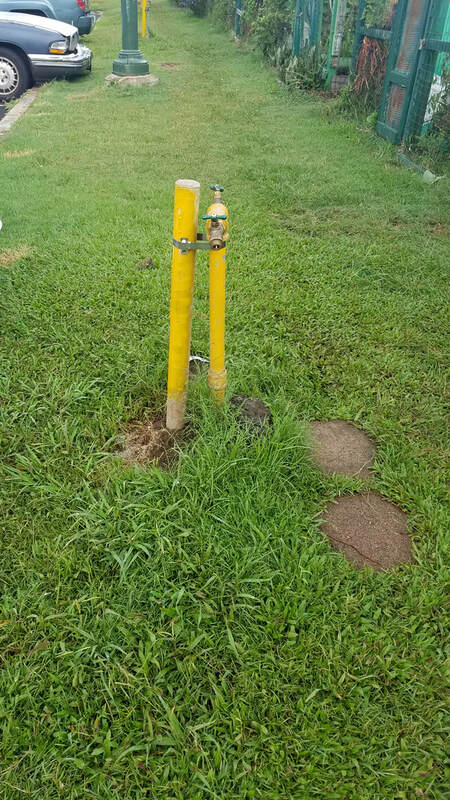 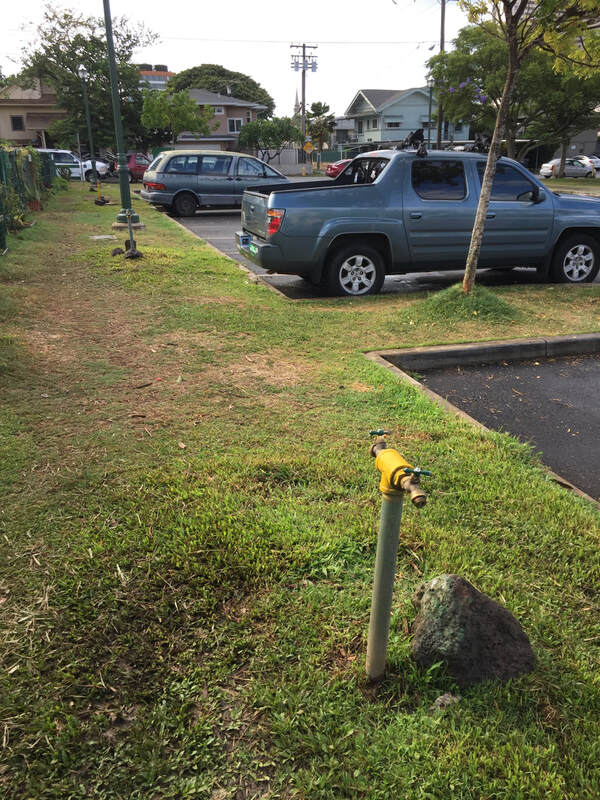 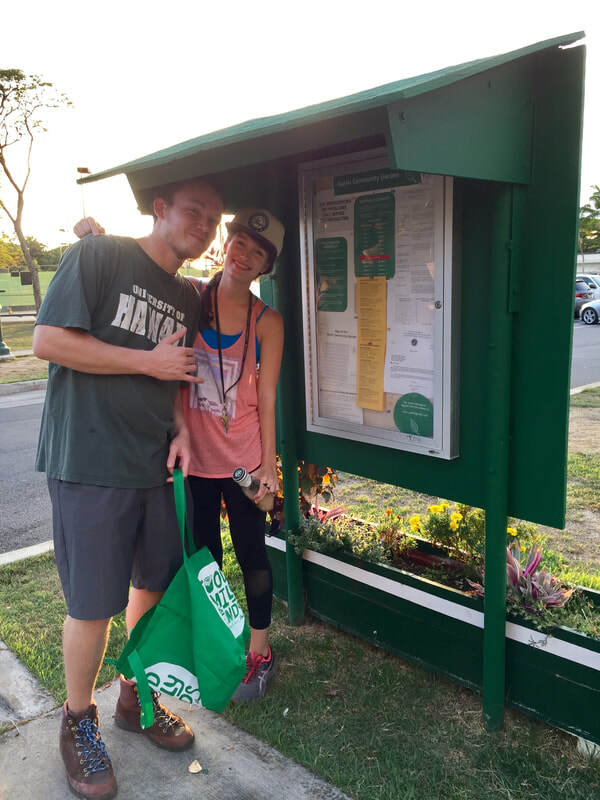 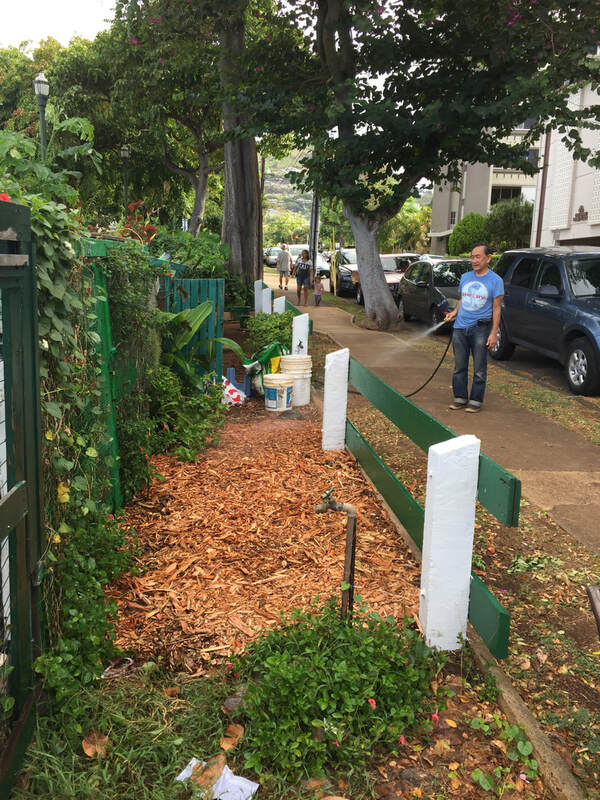 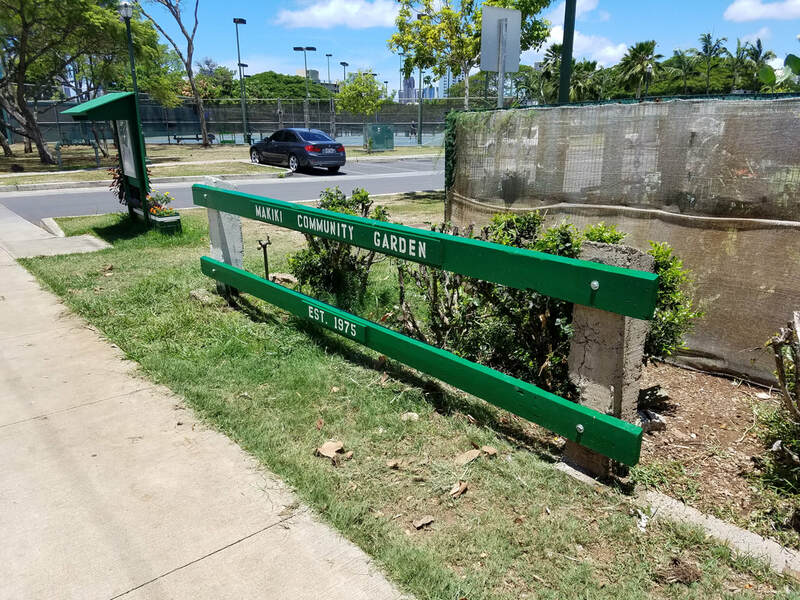 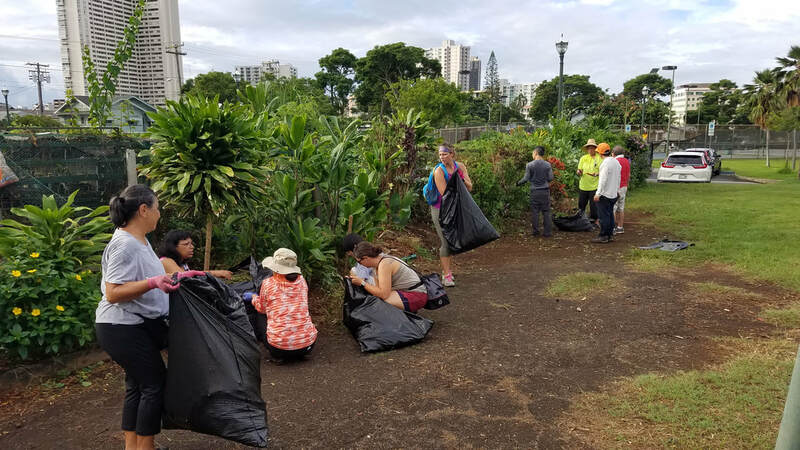 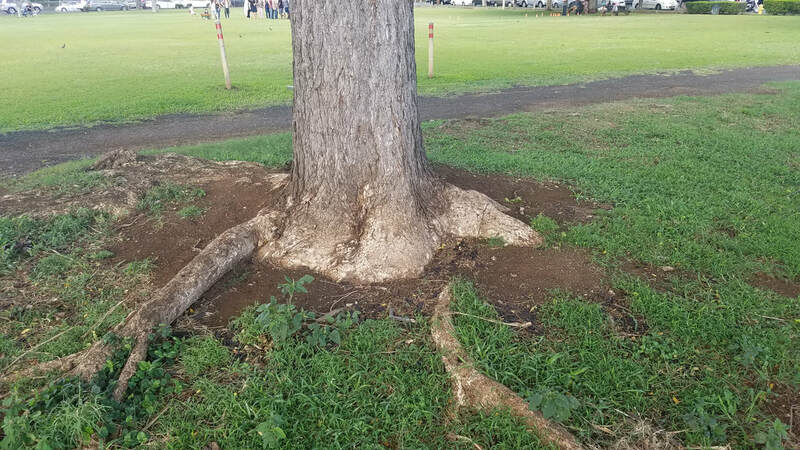 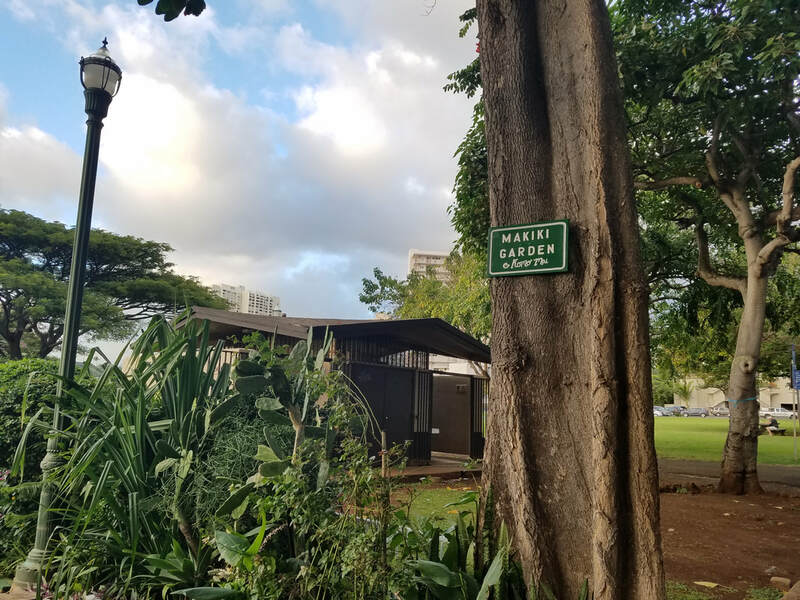 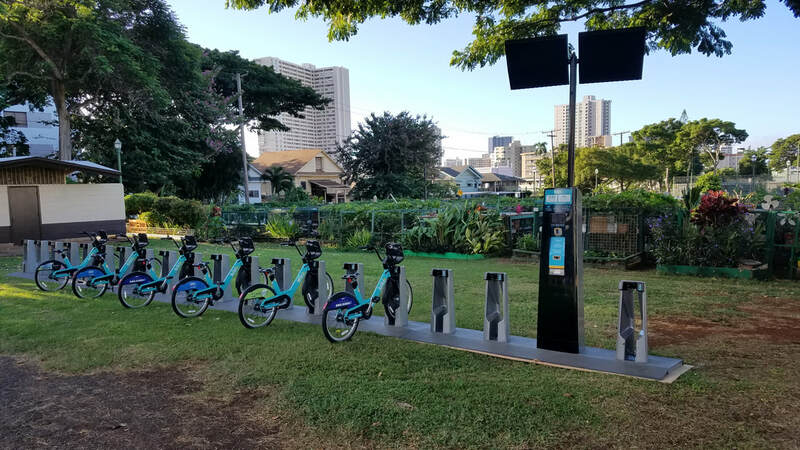 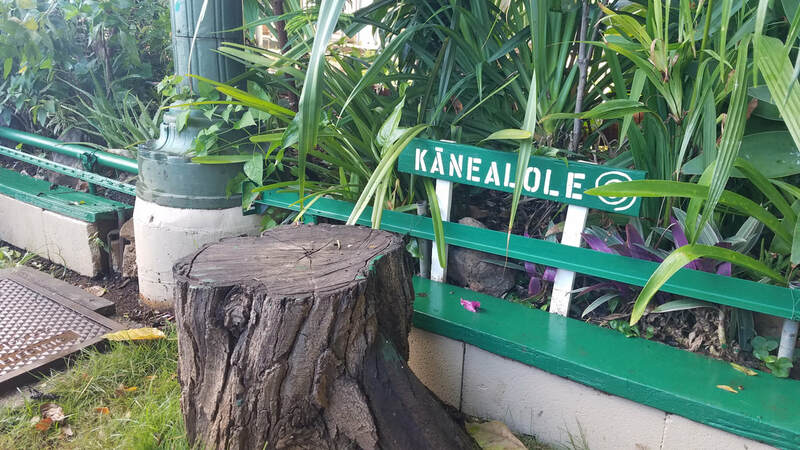 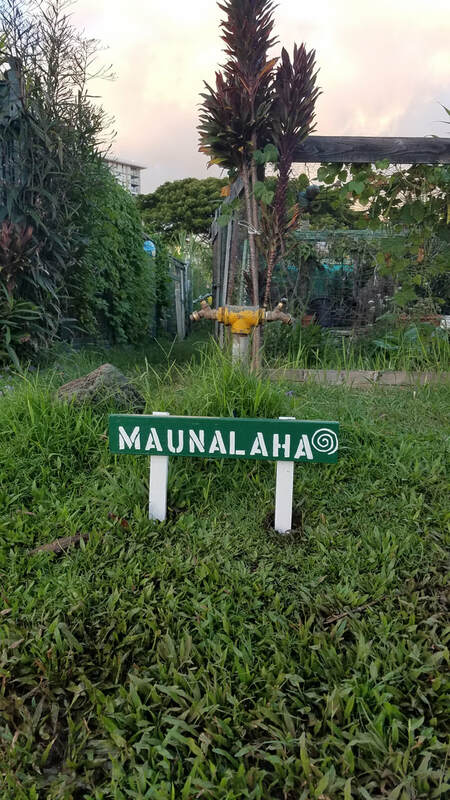 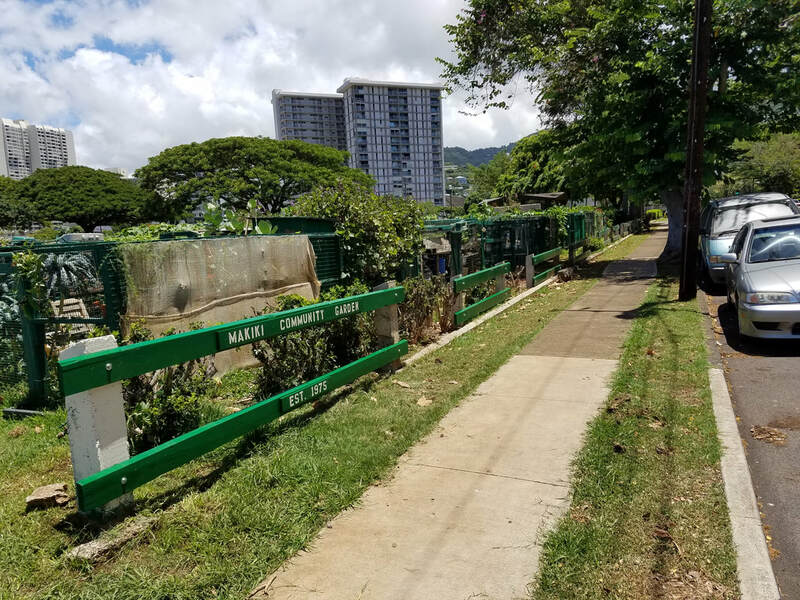 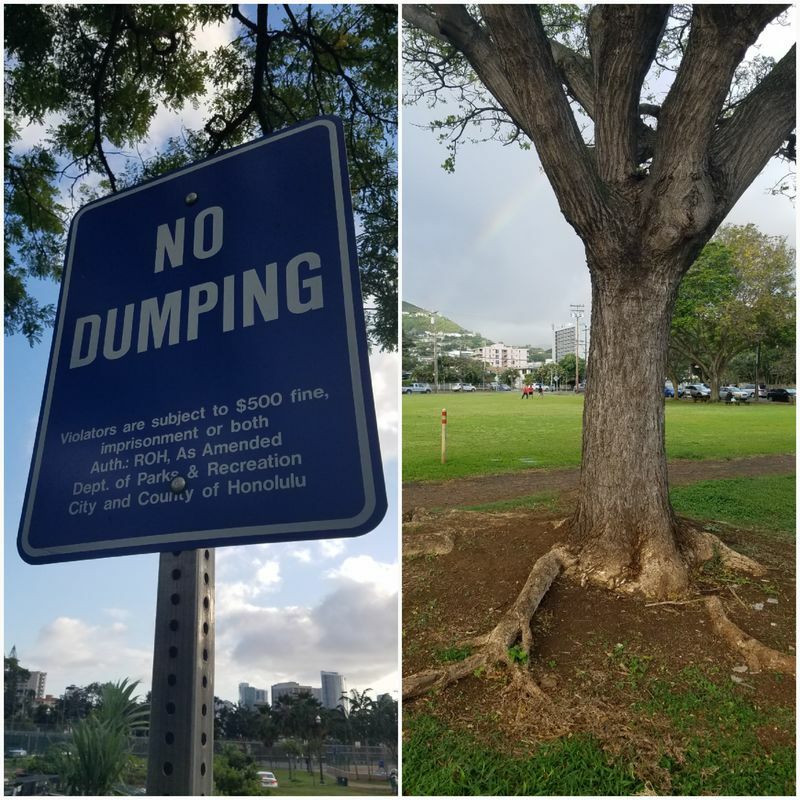 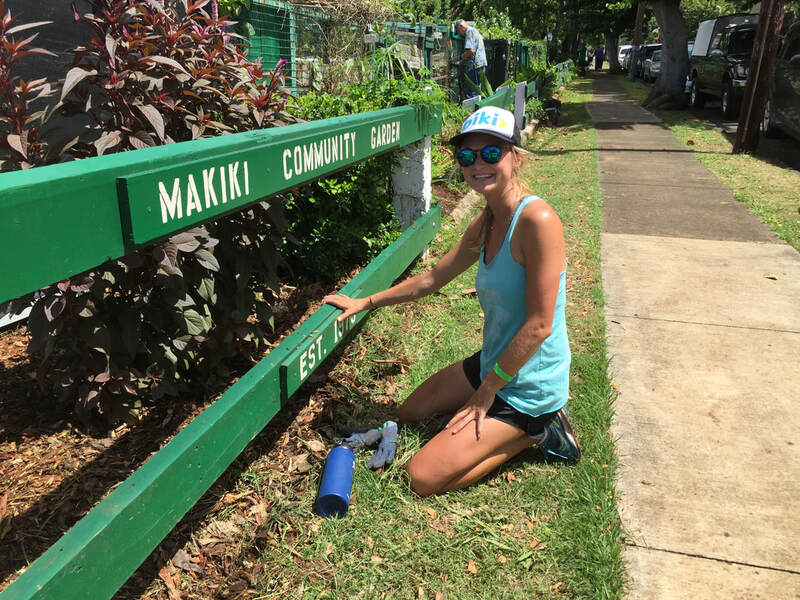 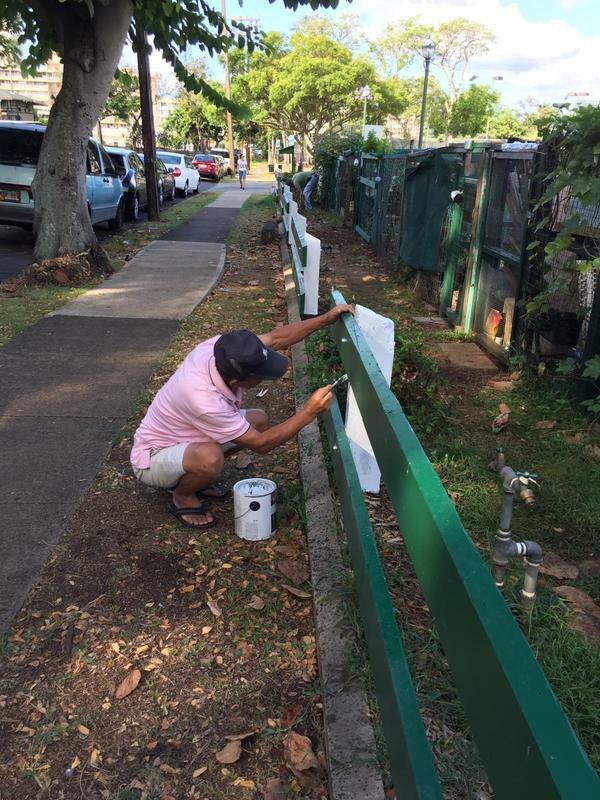 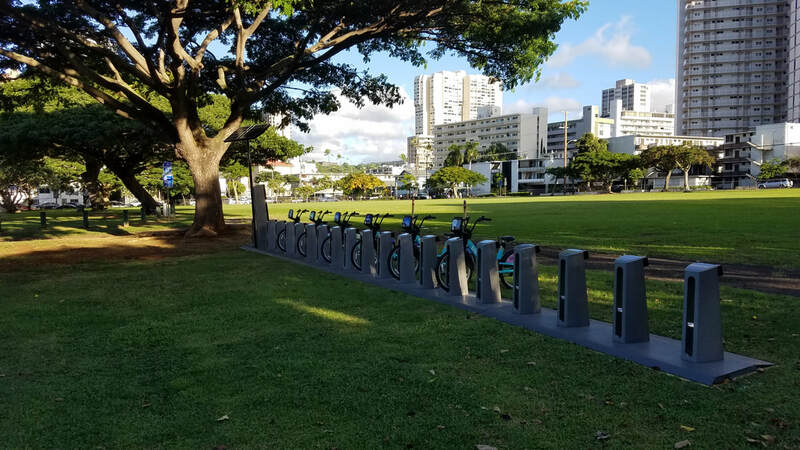 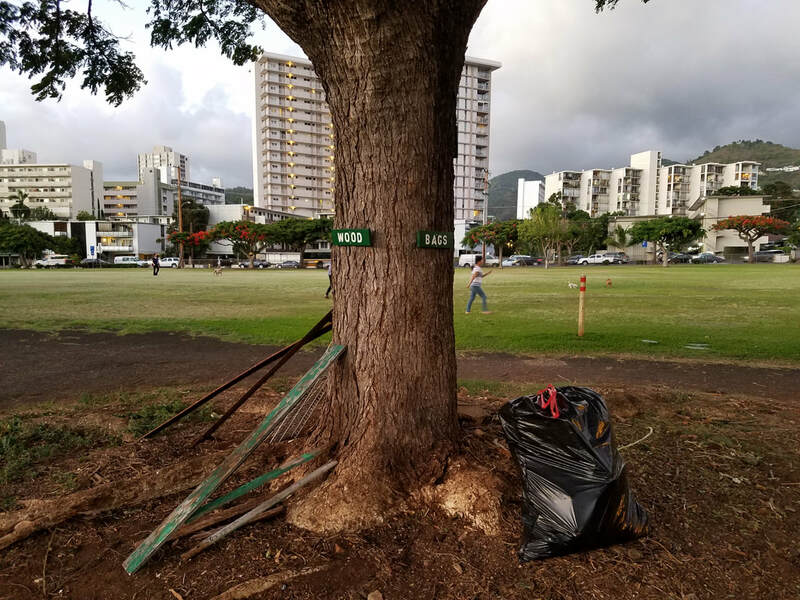 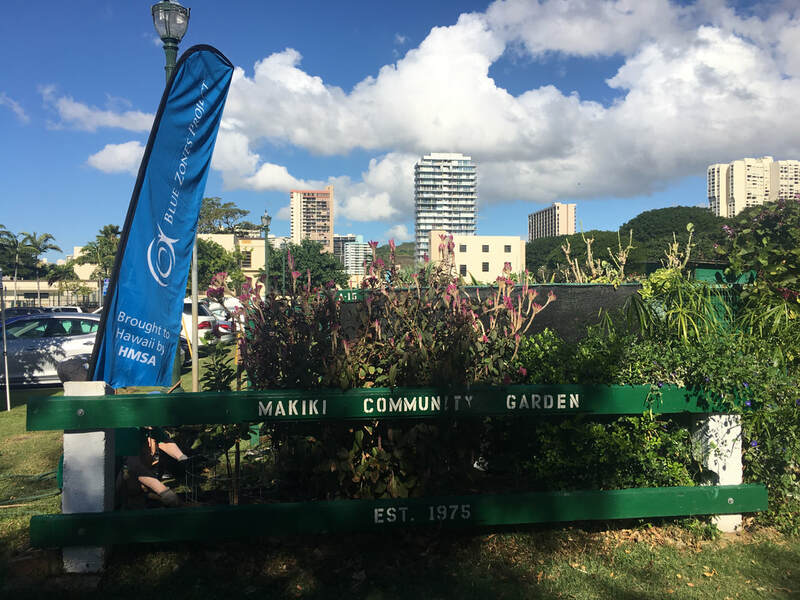 Despite being less than eight inches high, not attached to a tree, and designed to protect the water hose bibs from vehicles in the parking lot, the Makiki District Park has requested that our newly installed ʻŌlelo Hawaiʻi place name signs be removed. 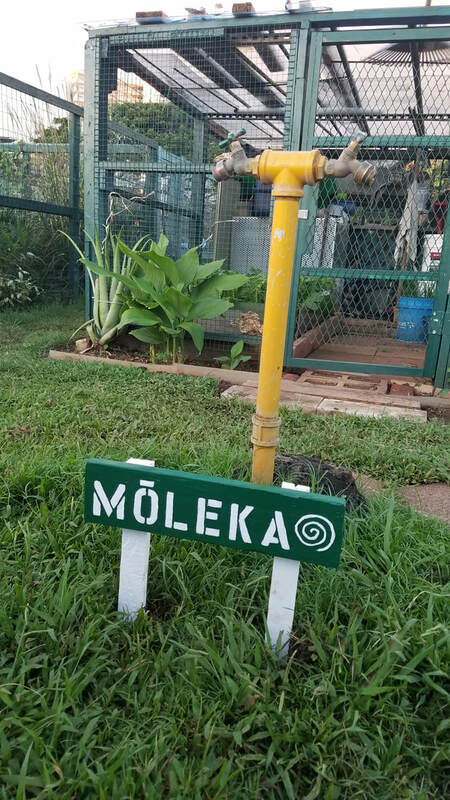 NOTE: These signs honor traditional ʻŌlelo Hawaiʻi place names and protect our water hose bibs from vehicles in the parking lot. 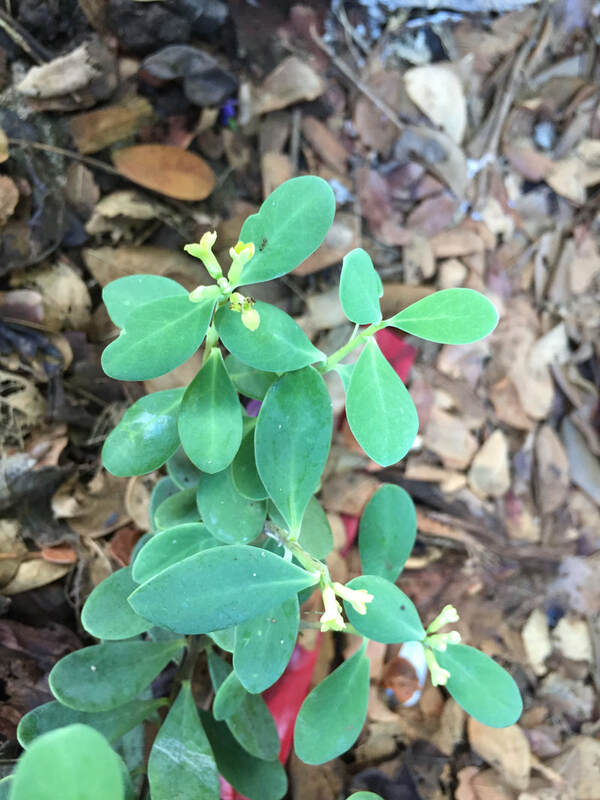 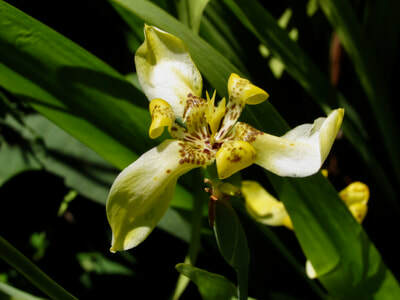 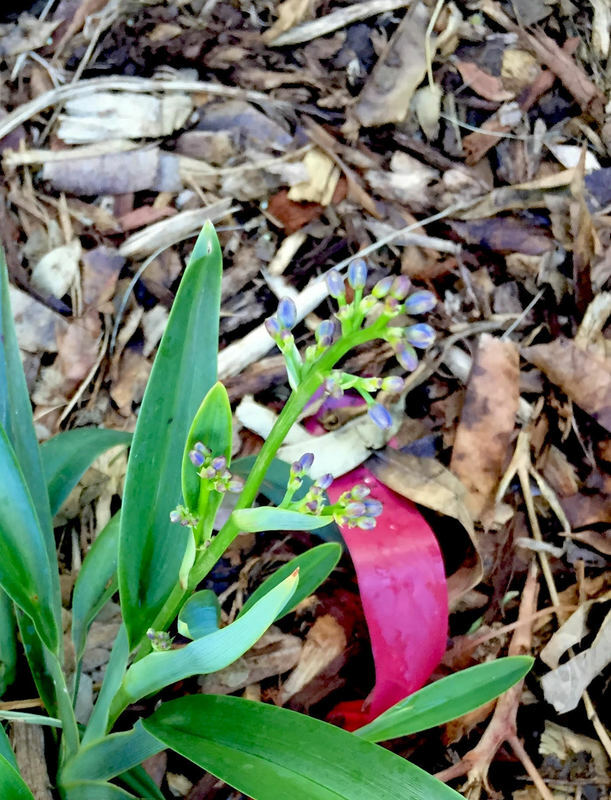 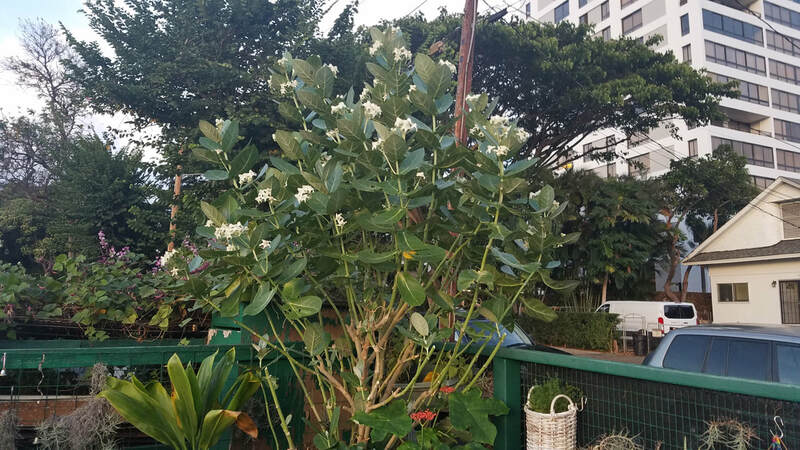 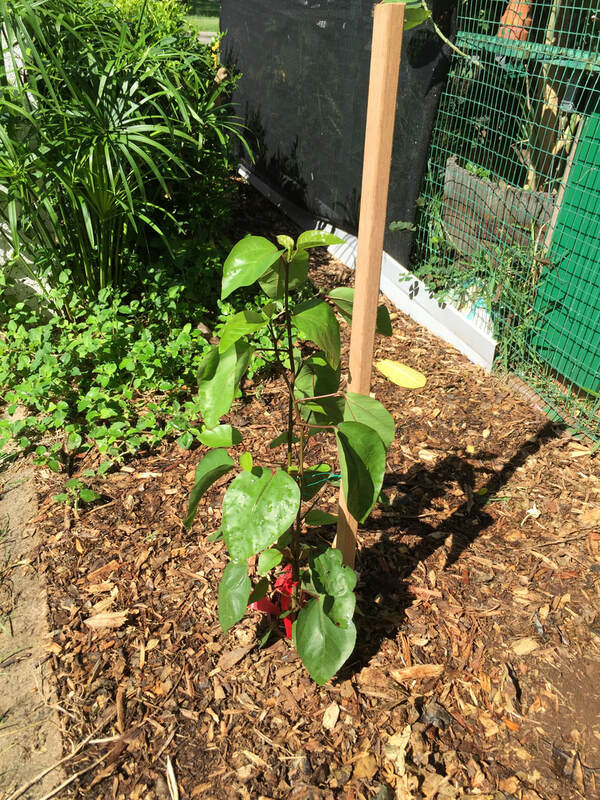 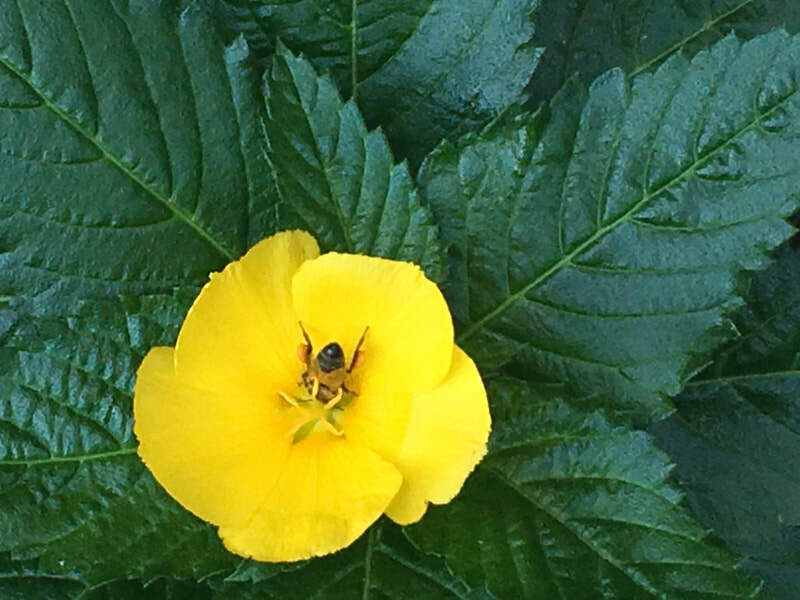 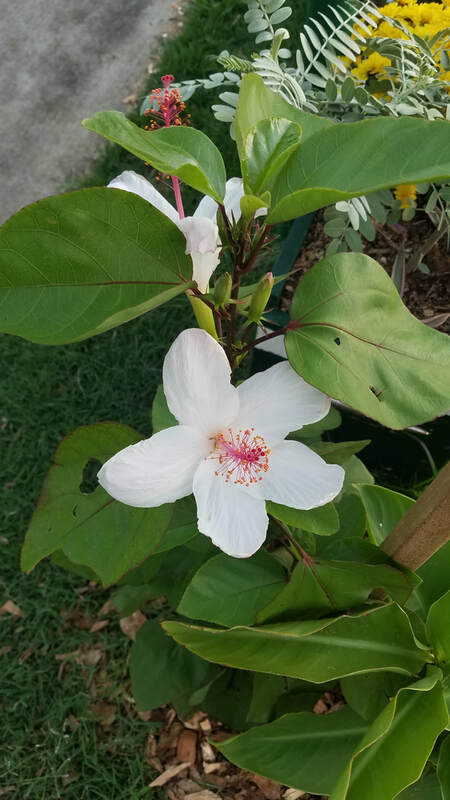 9/28/18 - Our first ʻĀkia plant has flowered too! 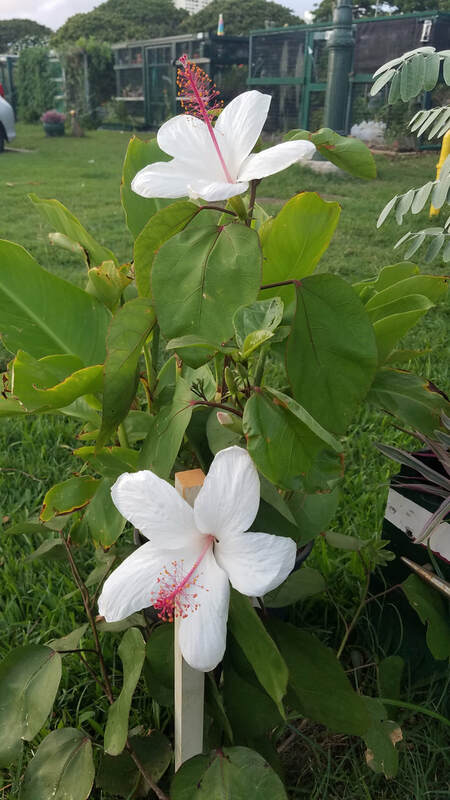 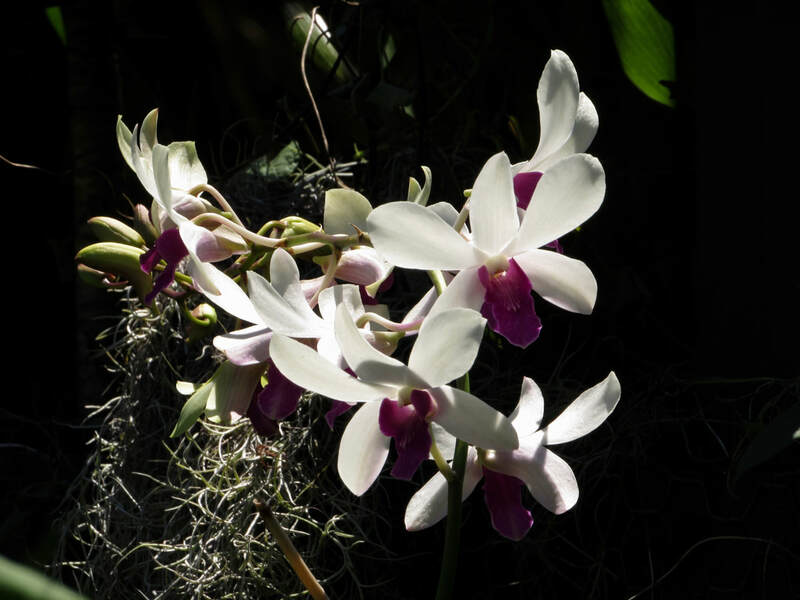 9/27/18 - The tiny flowers of the ʻukiʻuki are also in bloom! 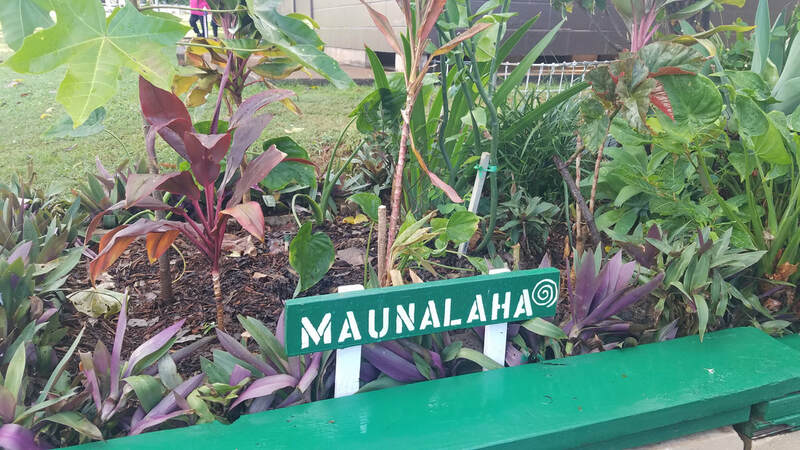 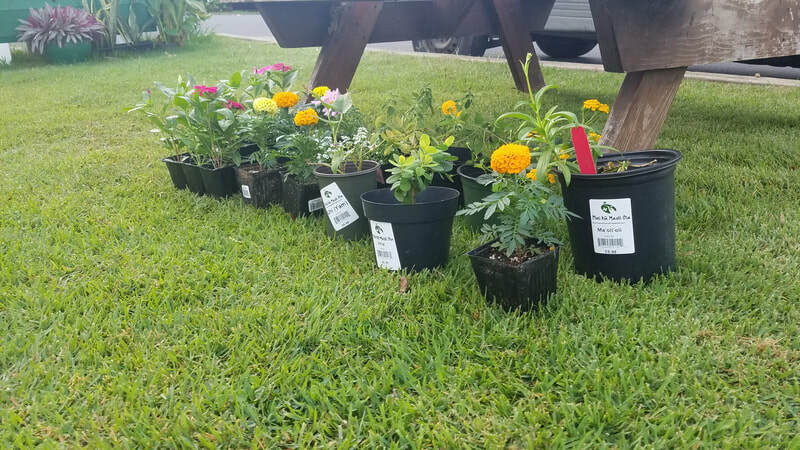 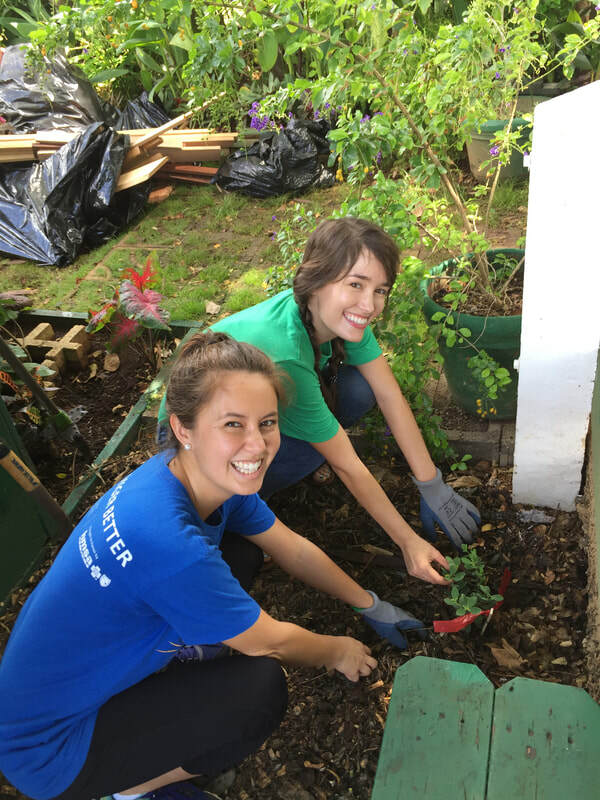 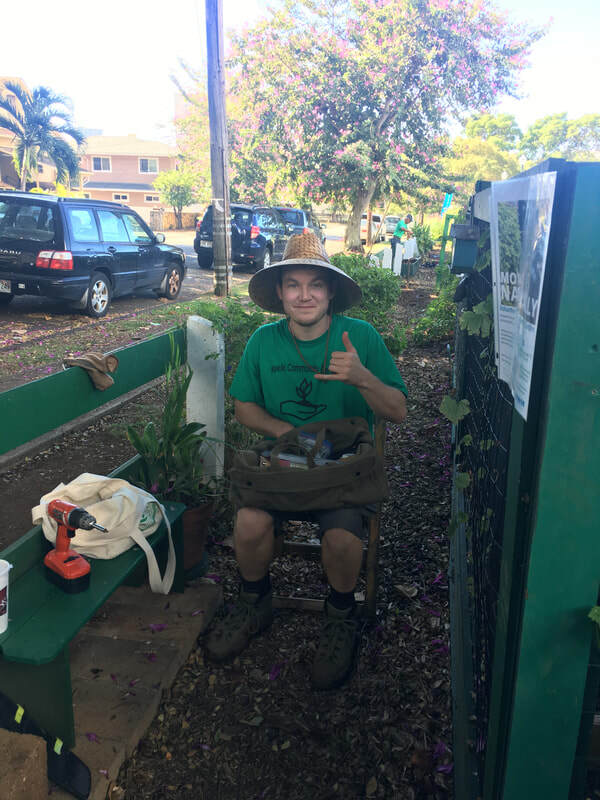 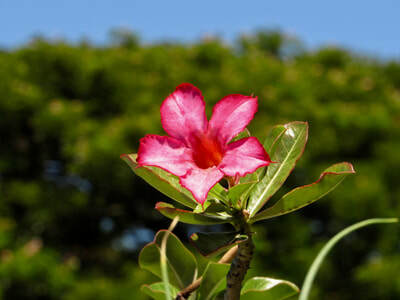 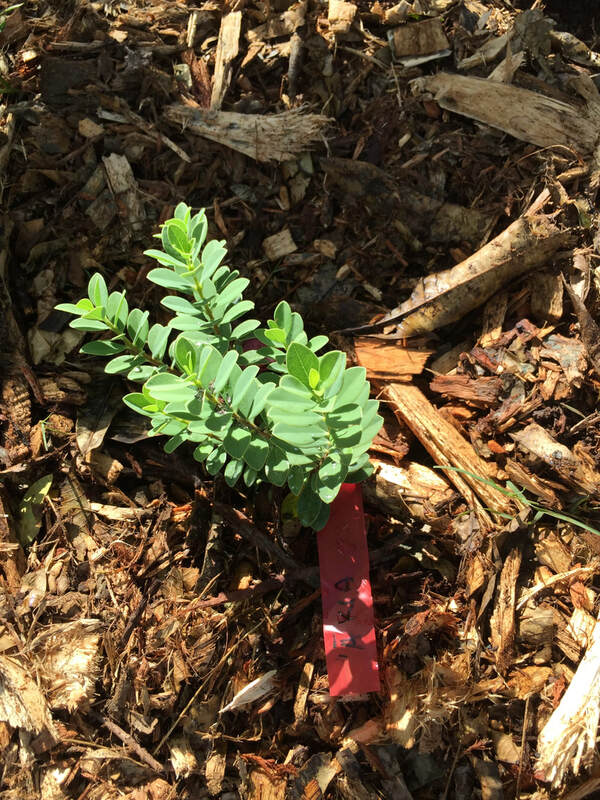 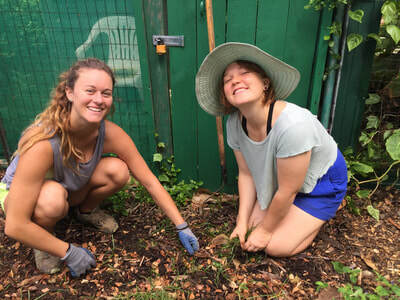 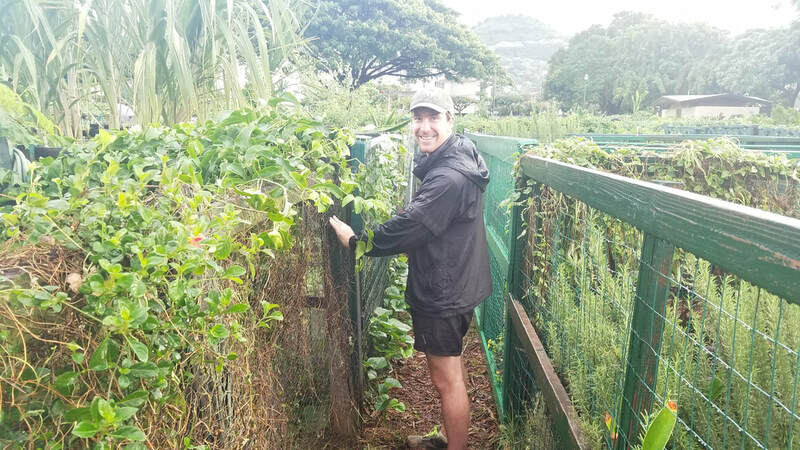 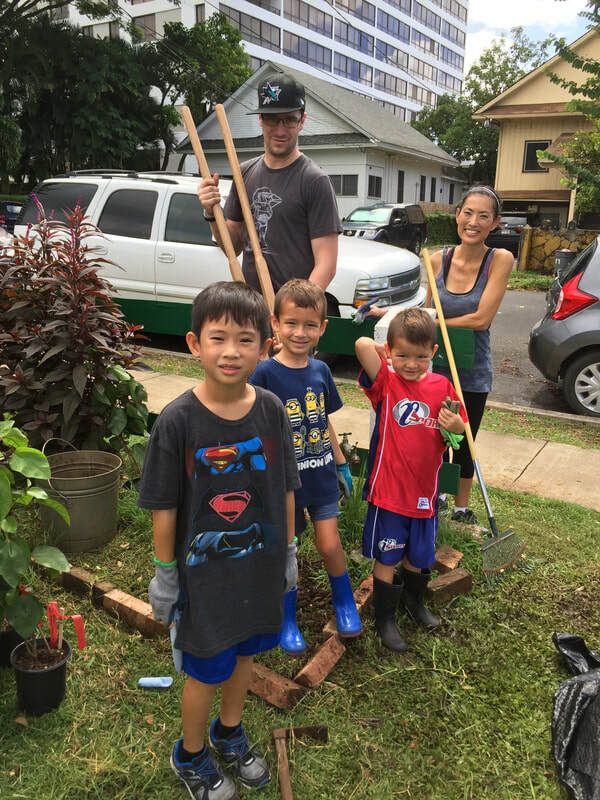 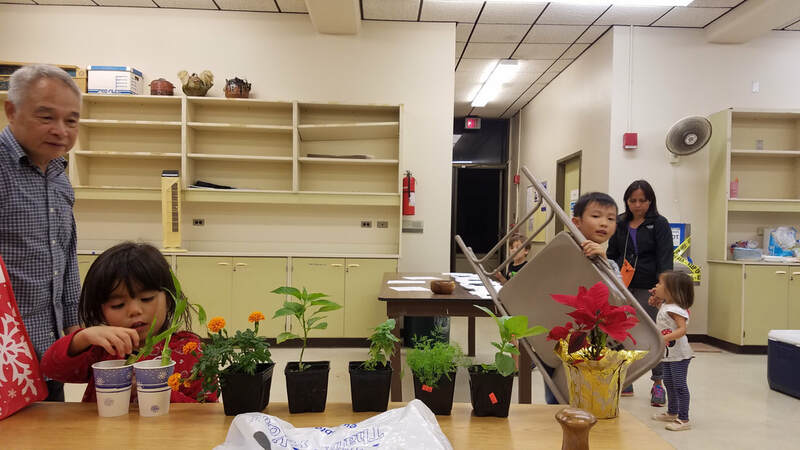 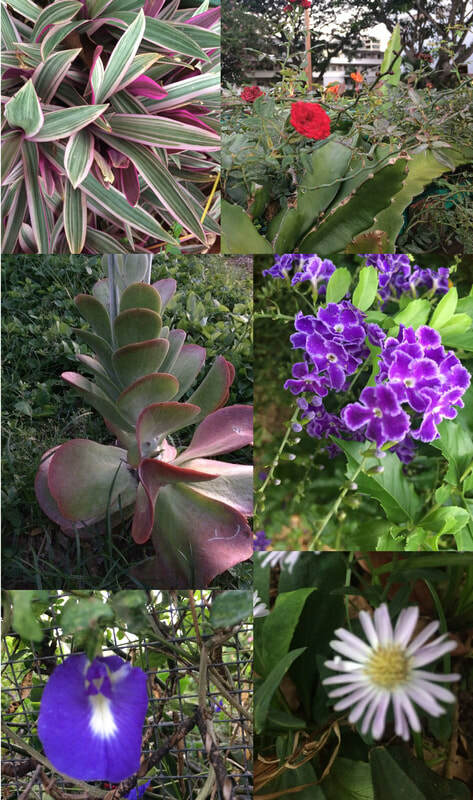 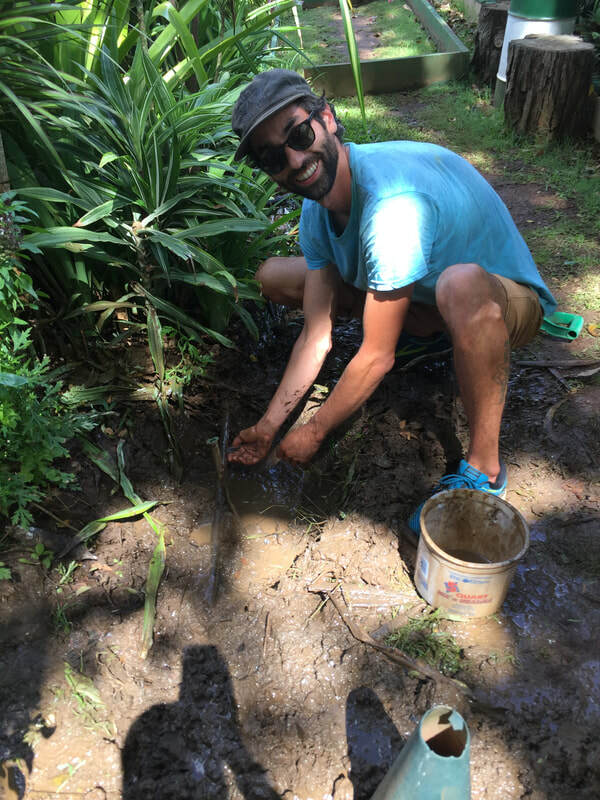 We are all excited for the excellent growth of the Native Hawaiian plants from Hui Kū Maoli Ola that were generously gifted by Blue Zones Project. 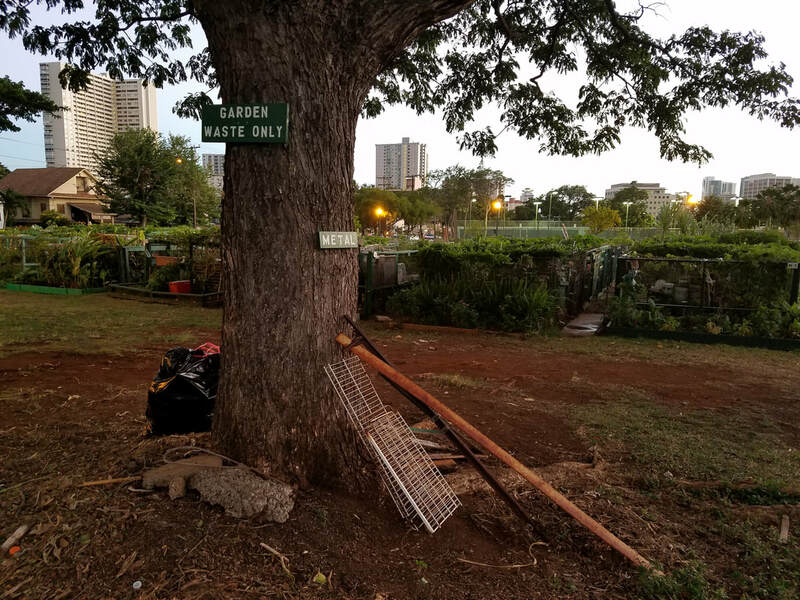 NOTE: More volunteers are needed to create additional multi-language signs. 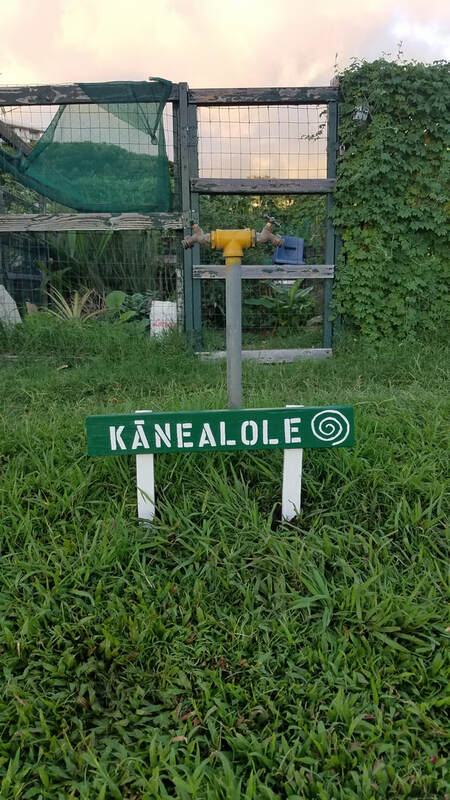 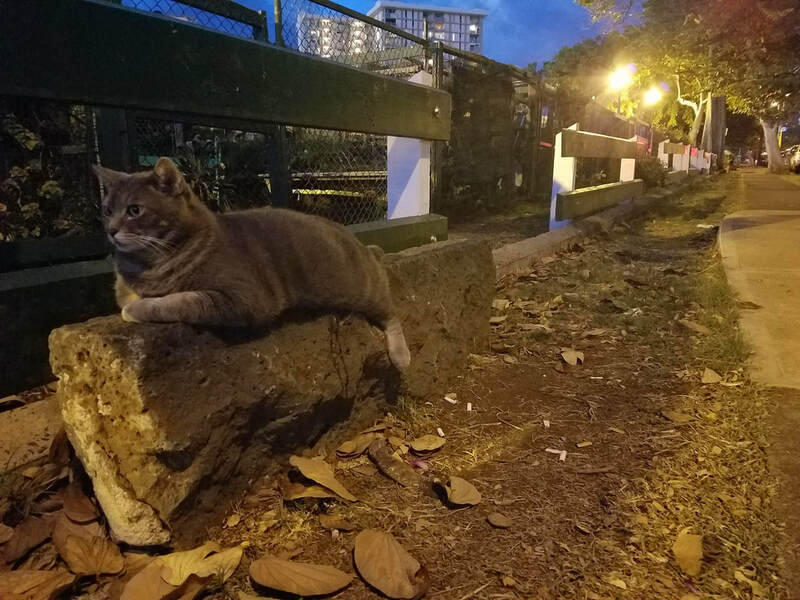 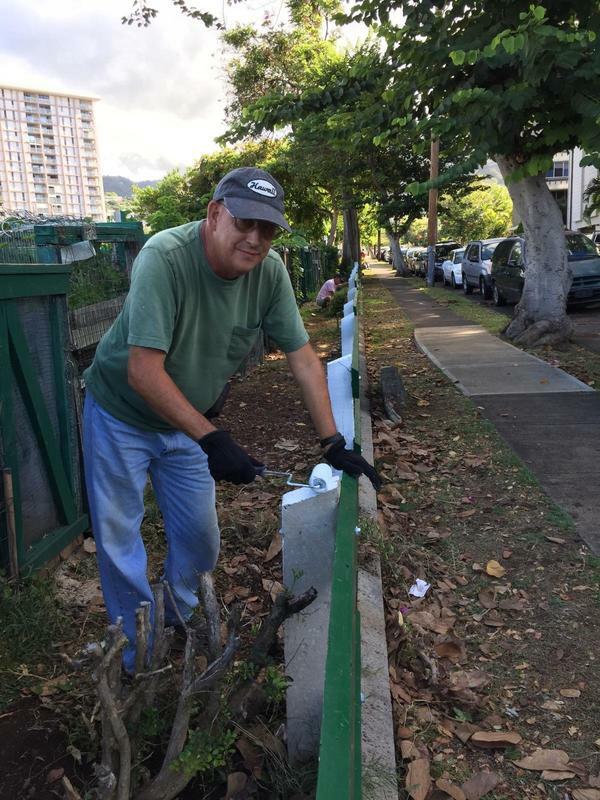 An 'Ōlelo No'eau was added to the Makiki St. guardrail. 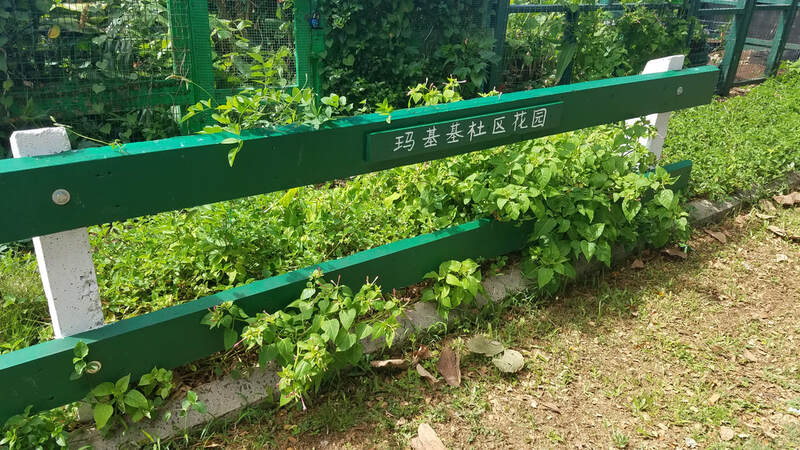 Translated it means "Beloved children are the plants" and it is said of farmers that their plants are like beloved children, receiving much attention and care. 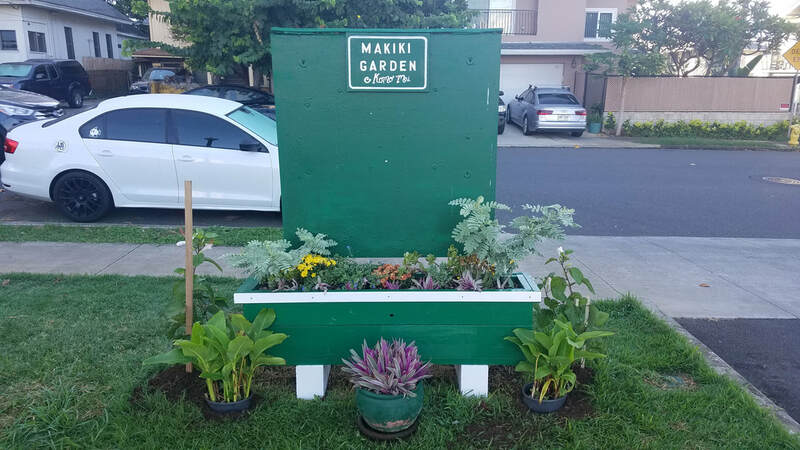 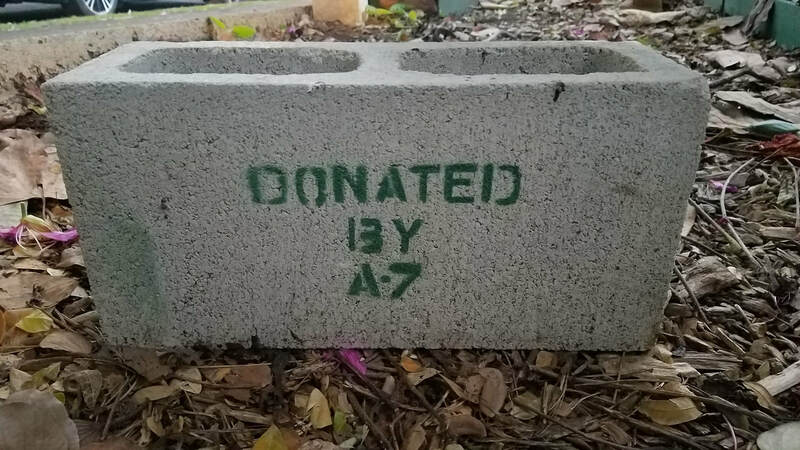 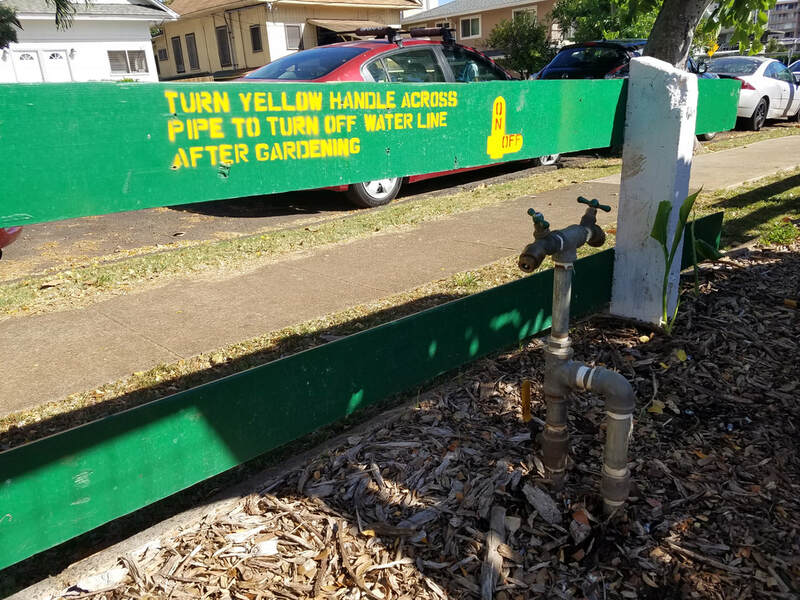 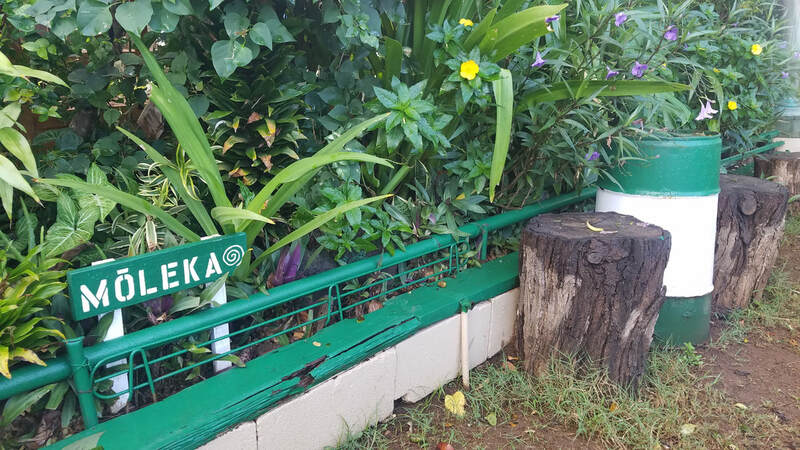 This sign was created by our very own Applications Officer and was added to the mauka side of the garden. 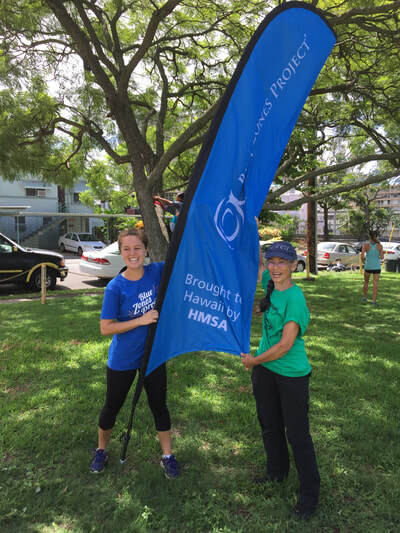 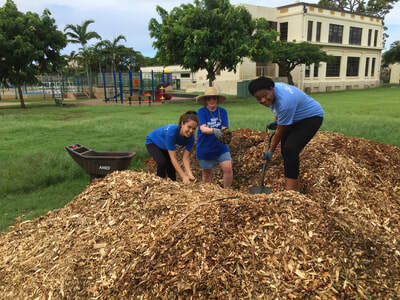 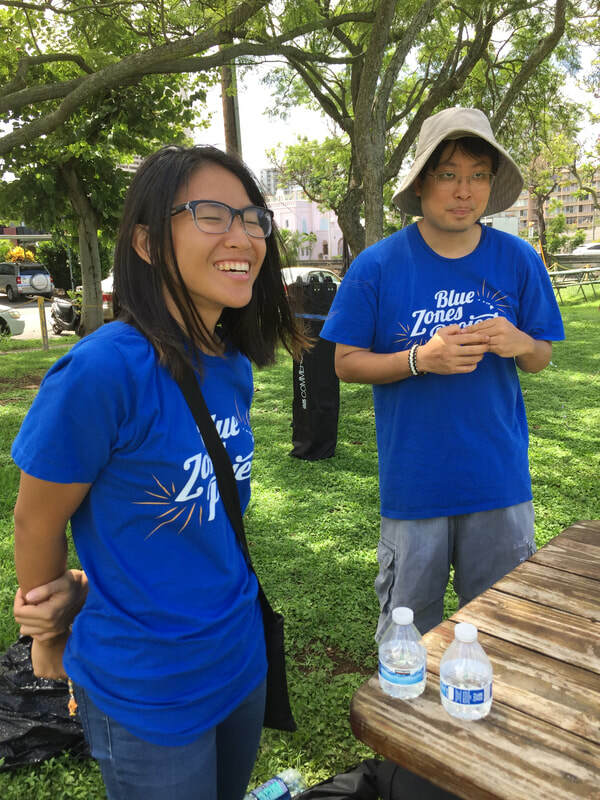 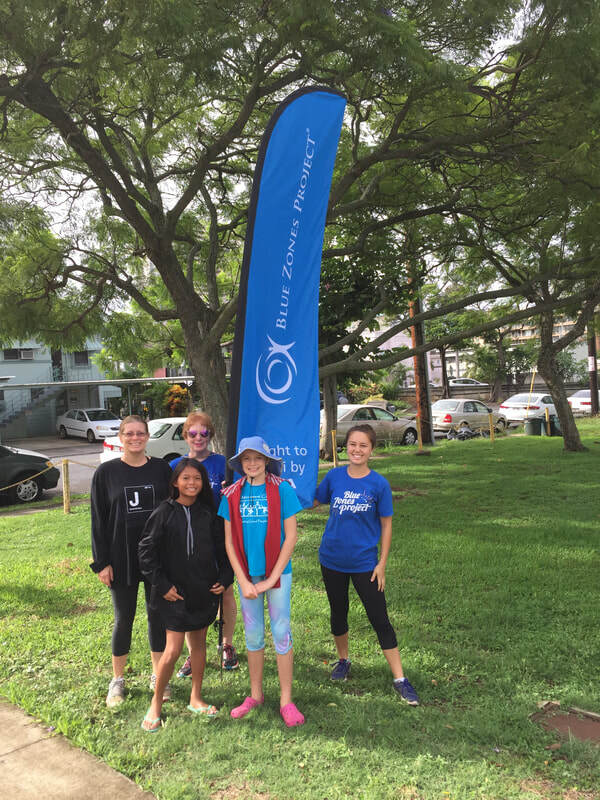 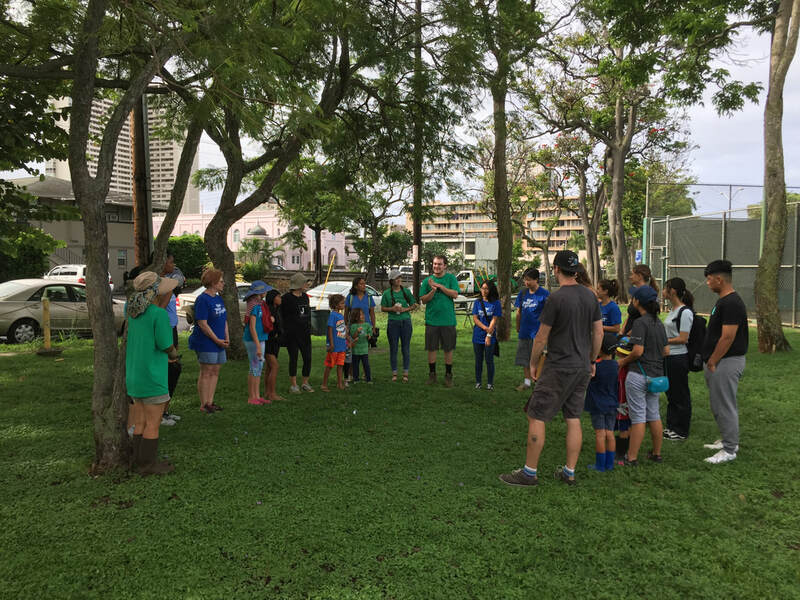 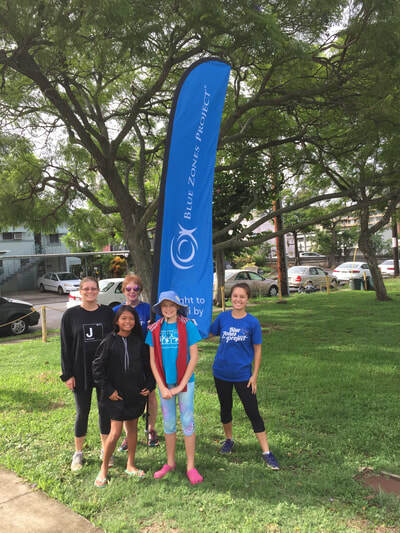 9/15/18 - Mahalo to Blue Zones Project Hawaiʻi for all their support today! 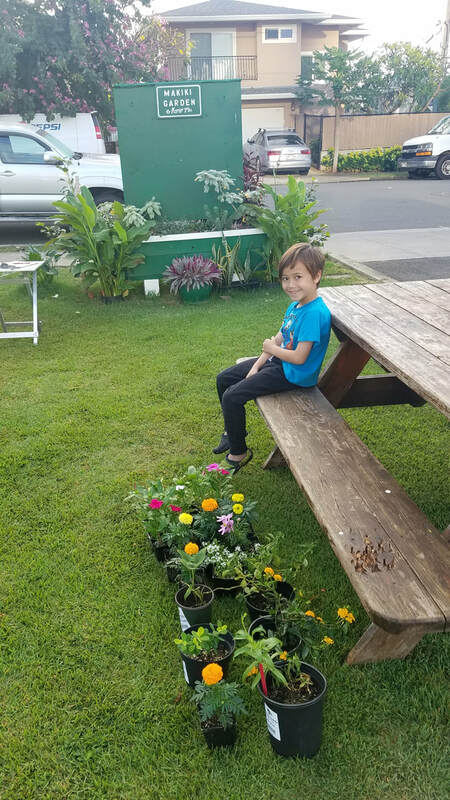 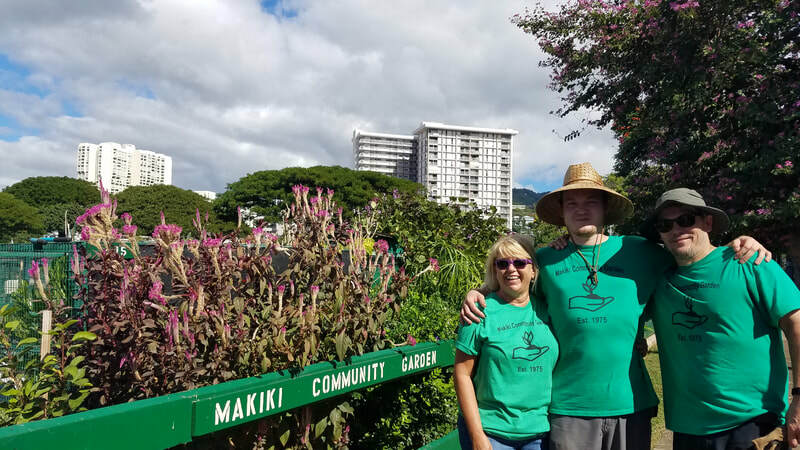 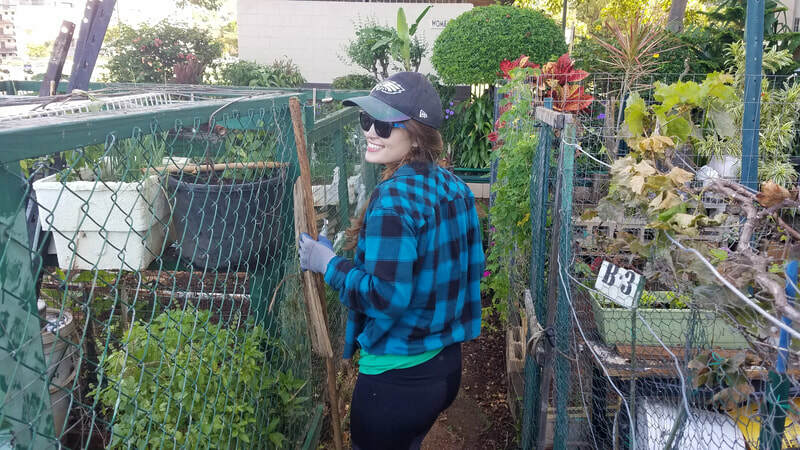 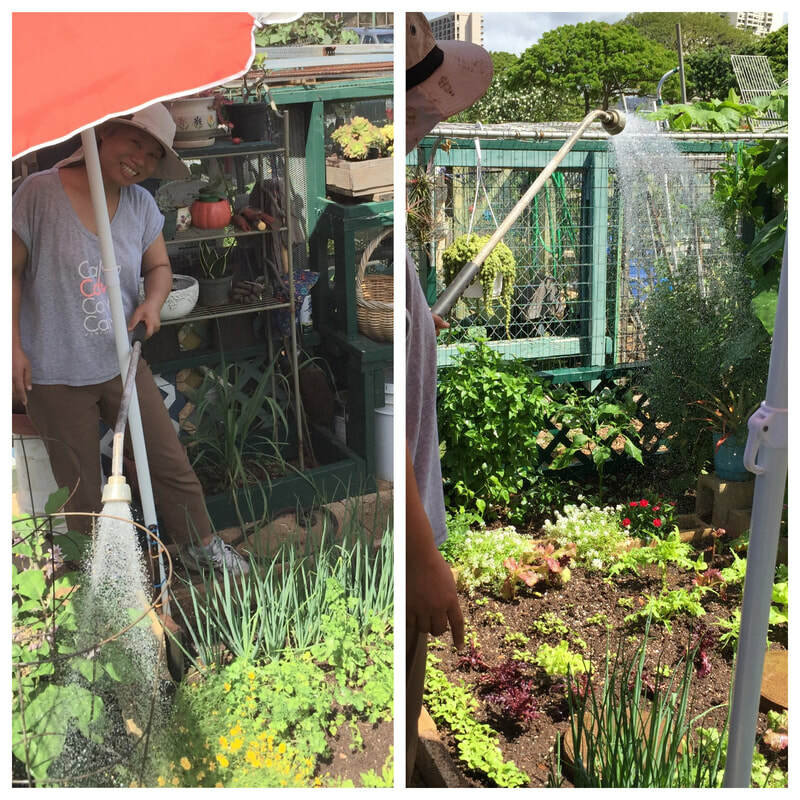 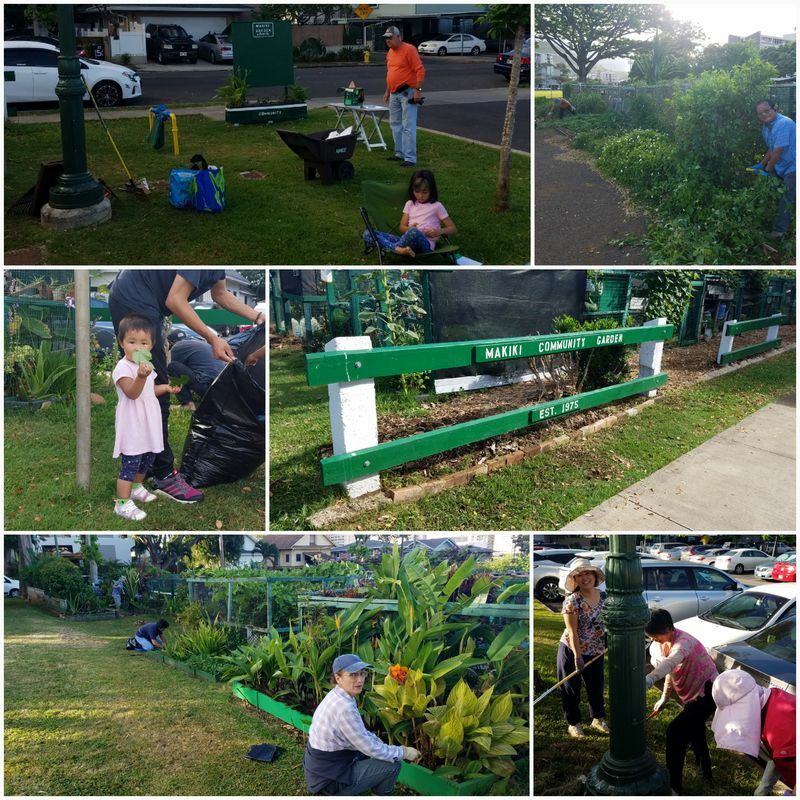 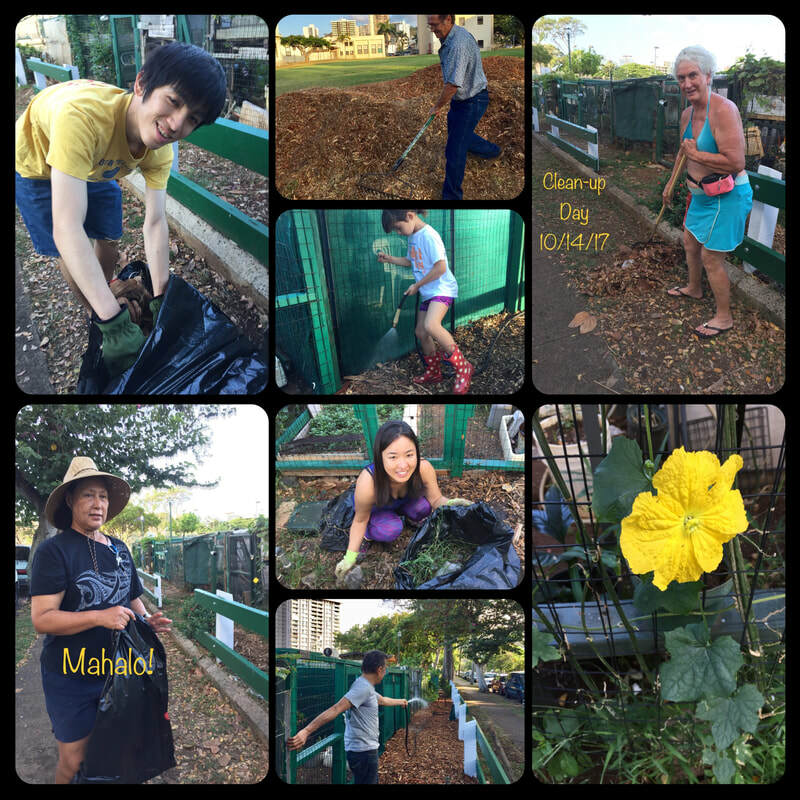 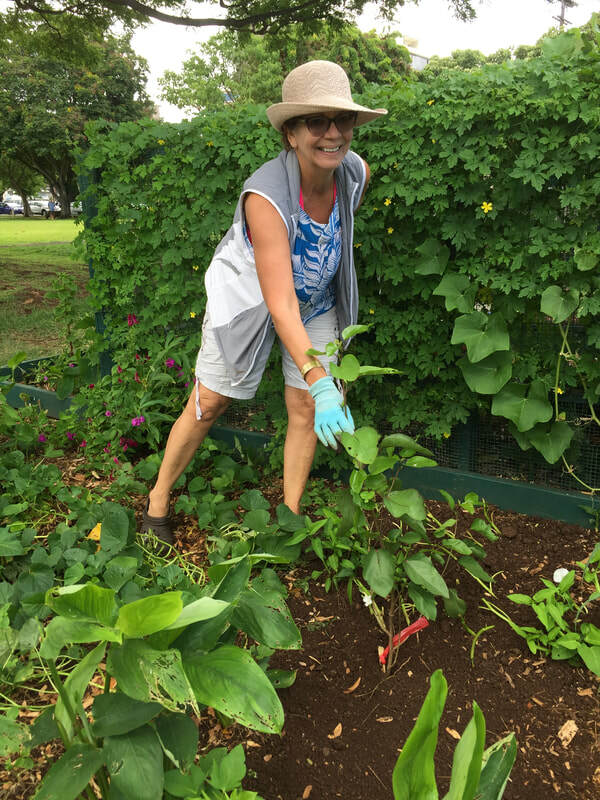 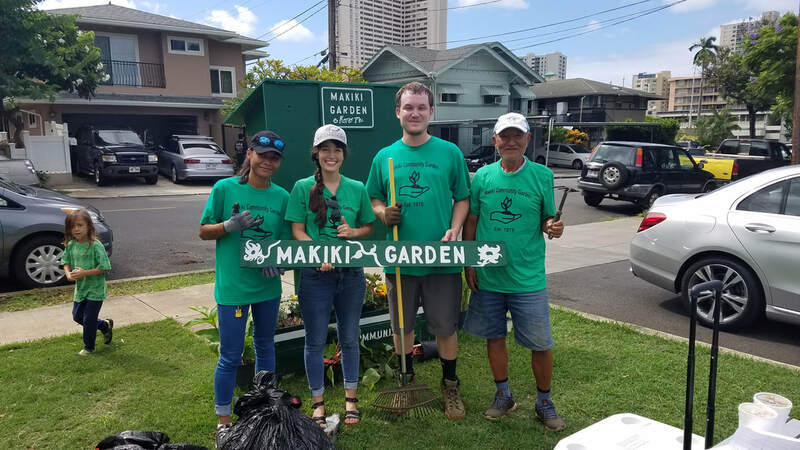 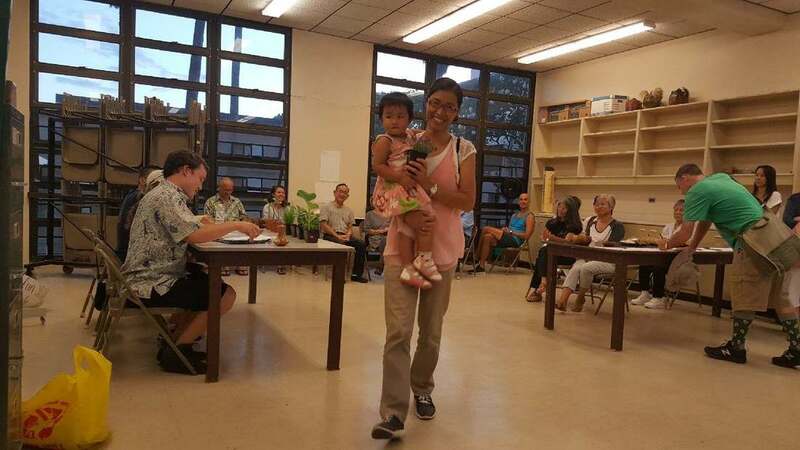 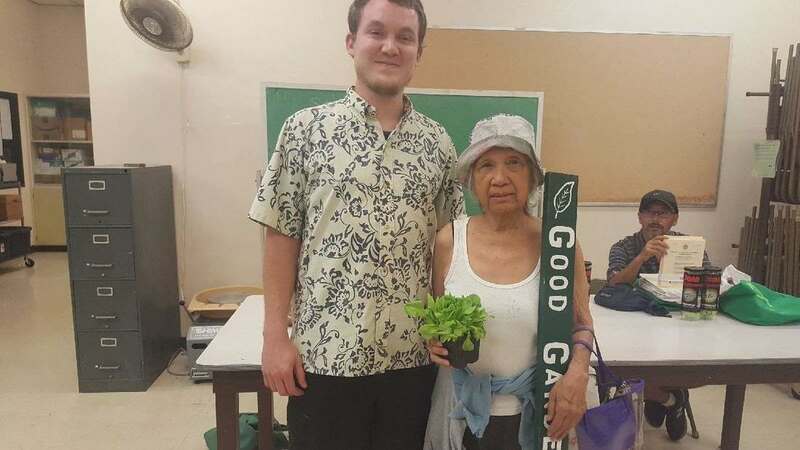 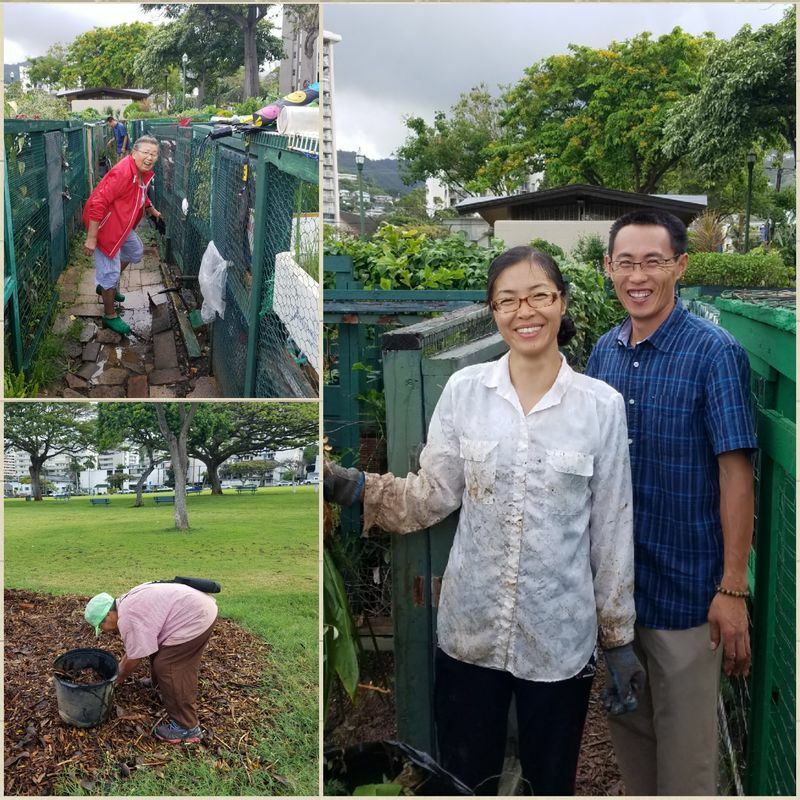 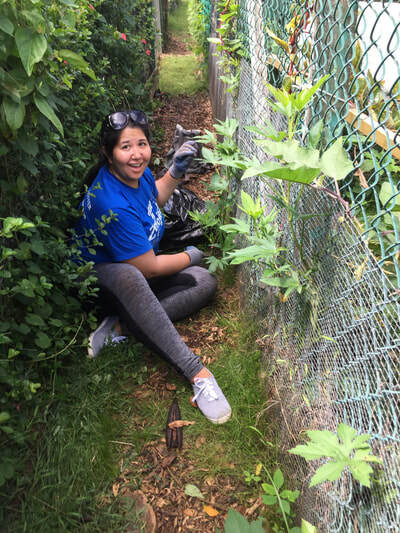 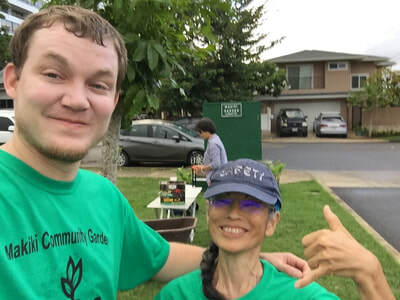 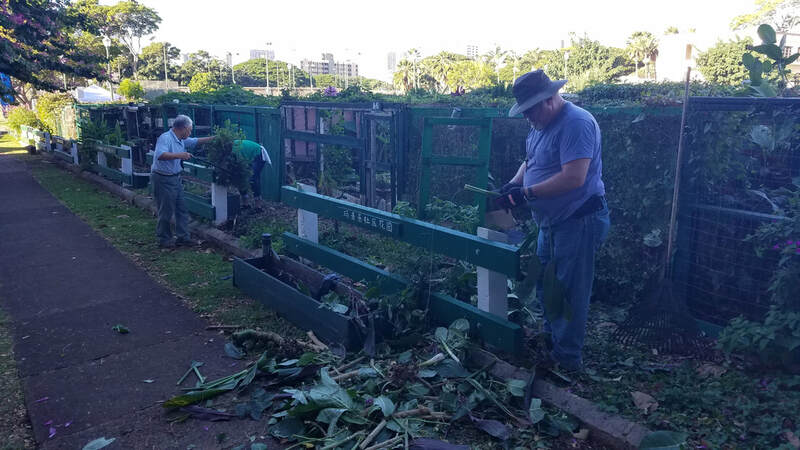 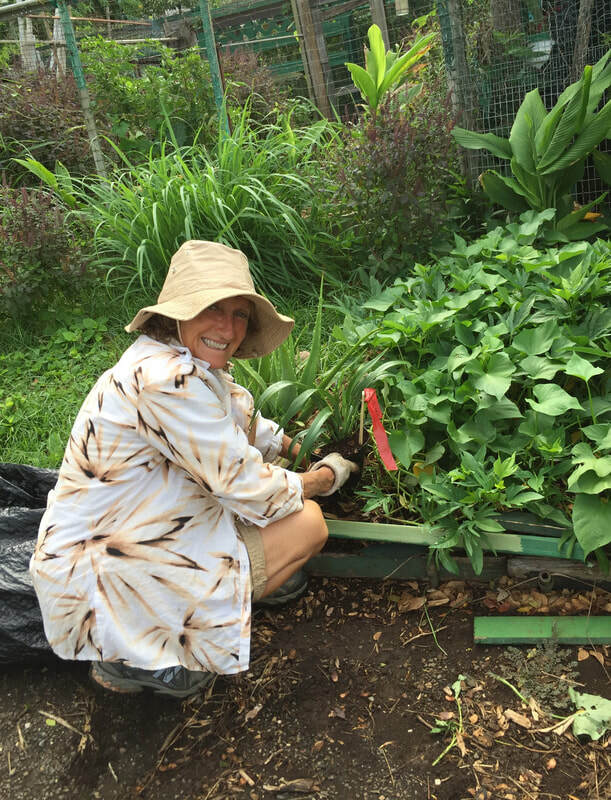 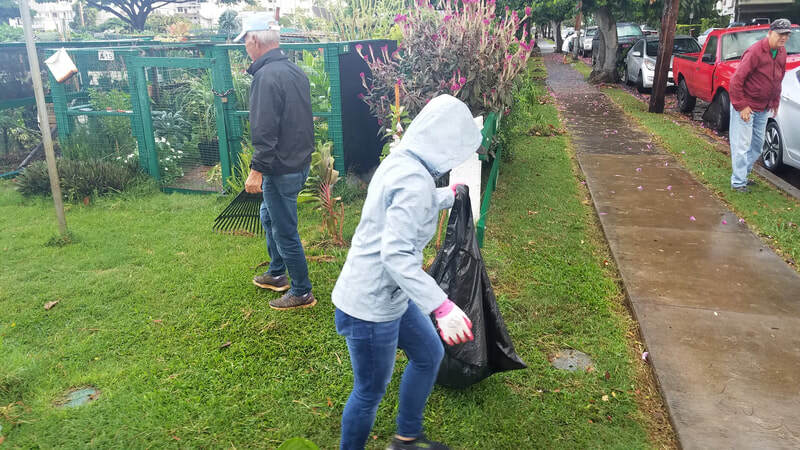 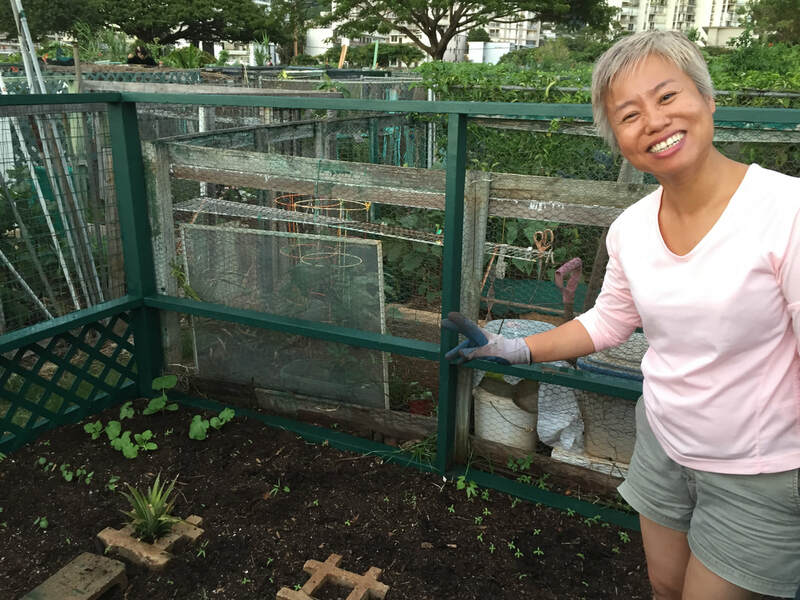 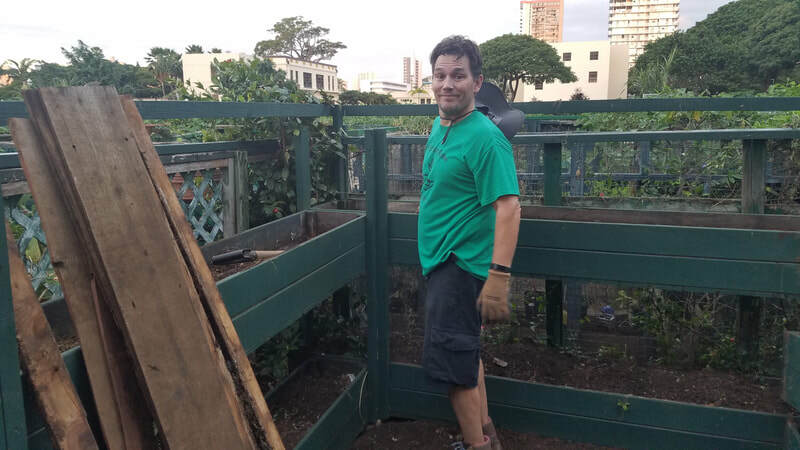 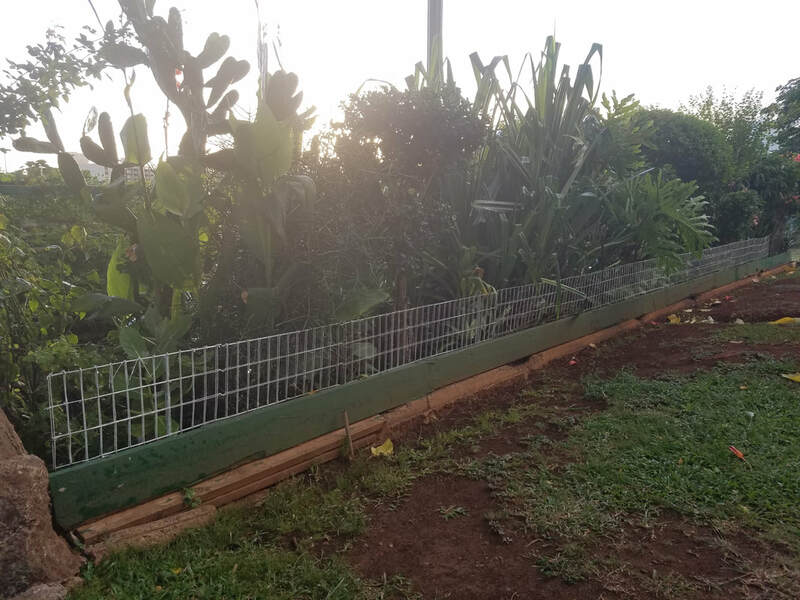 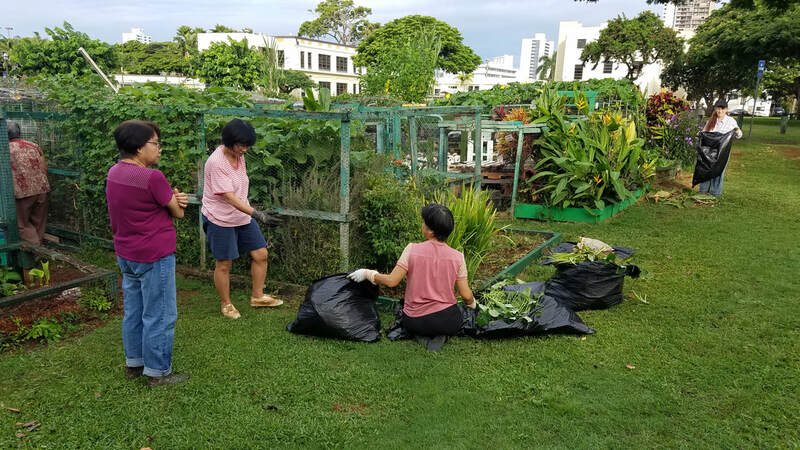 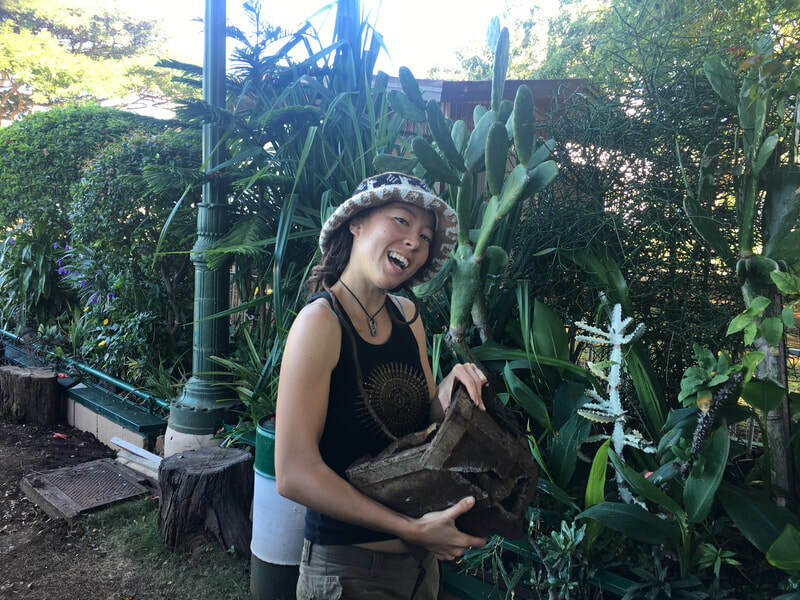 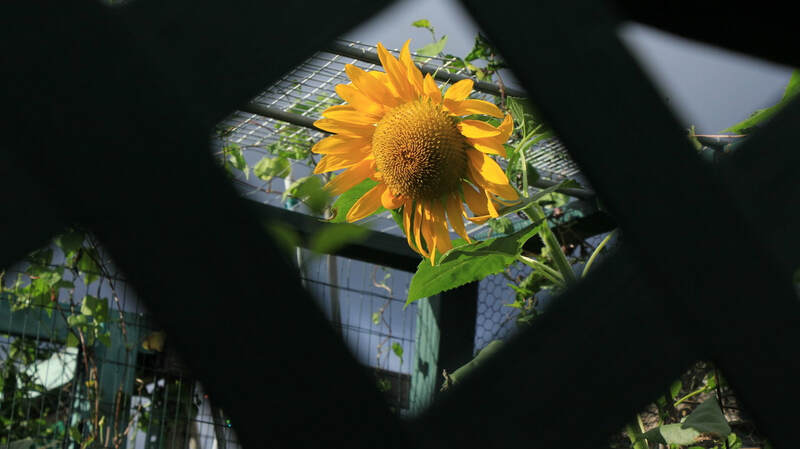 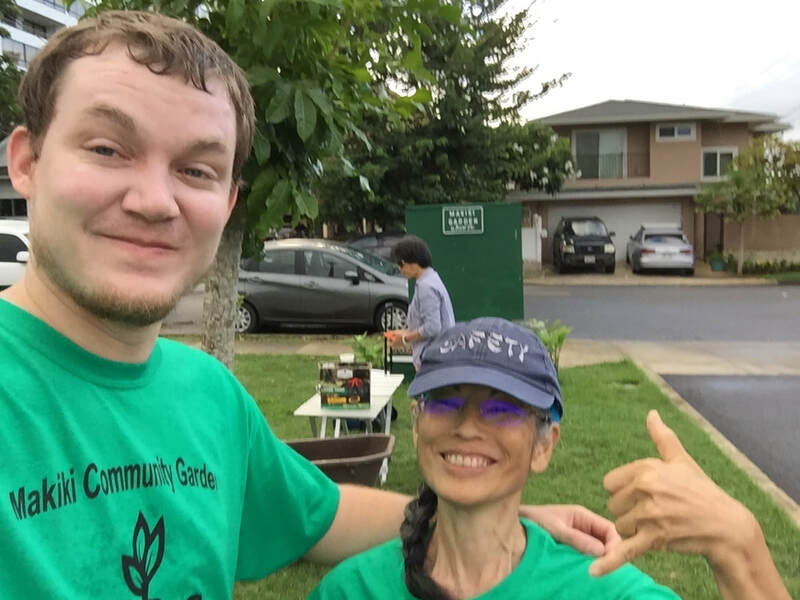 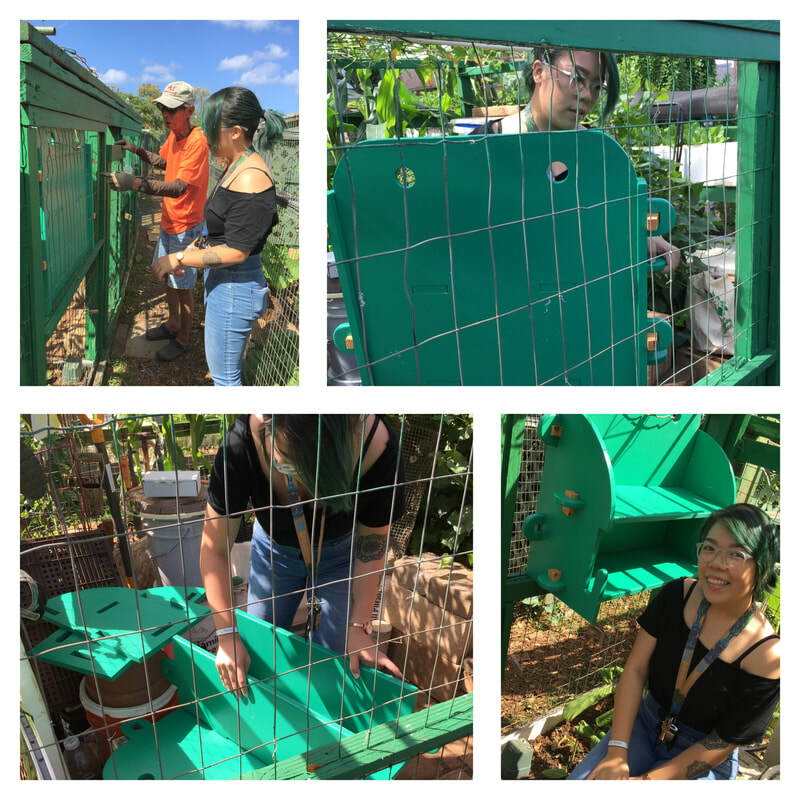 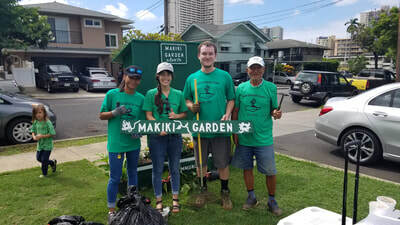 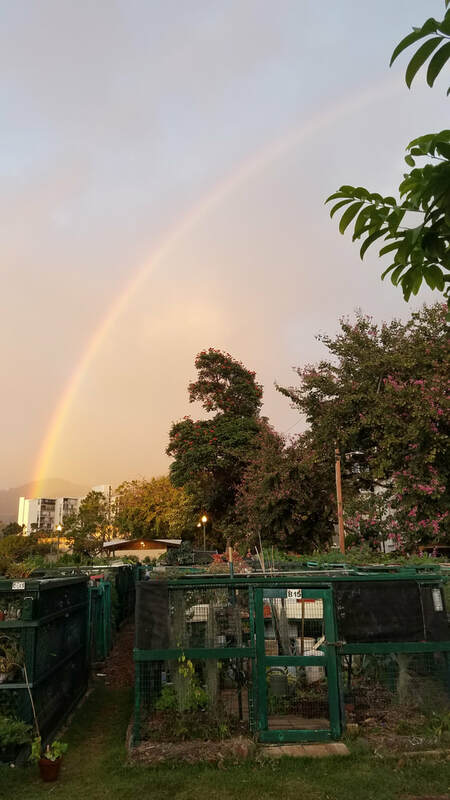 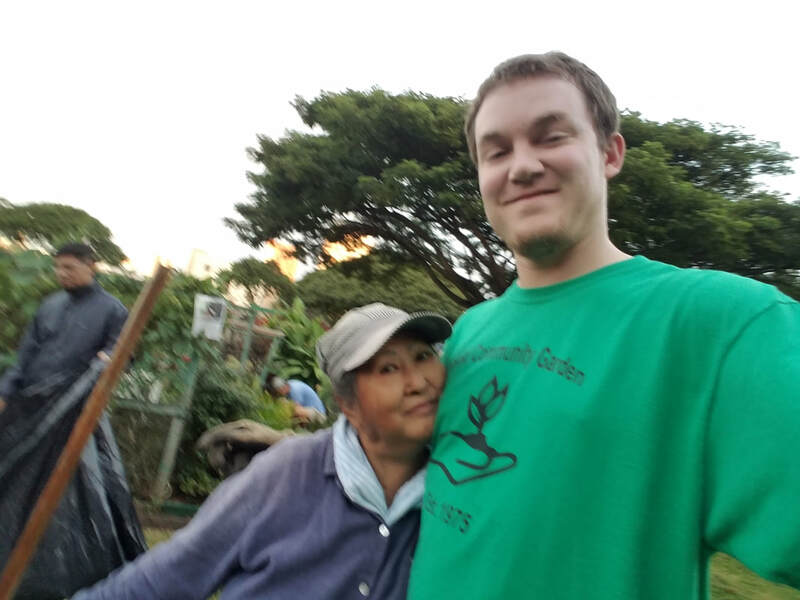 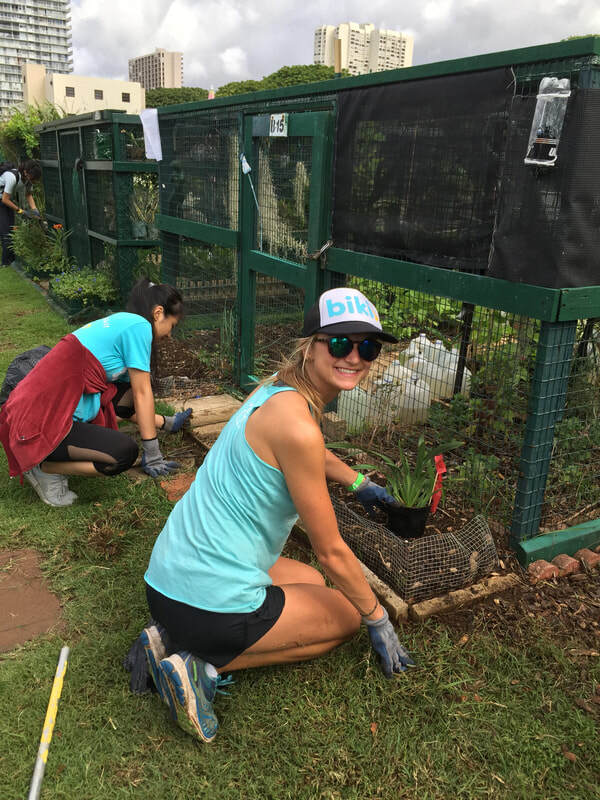 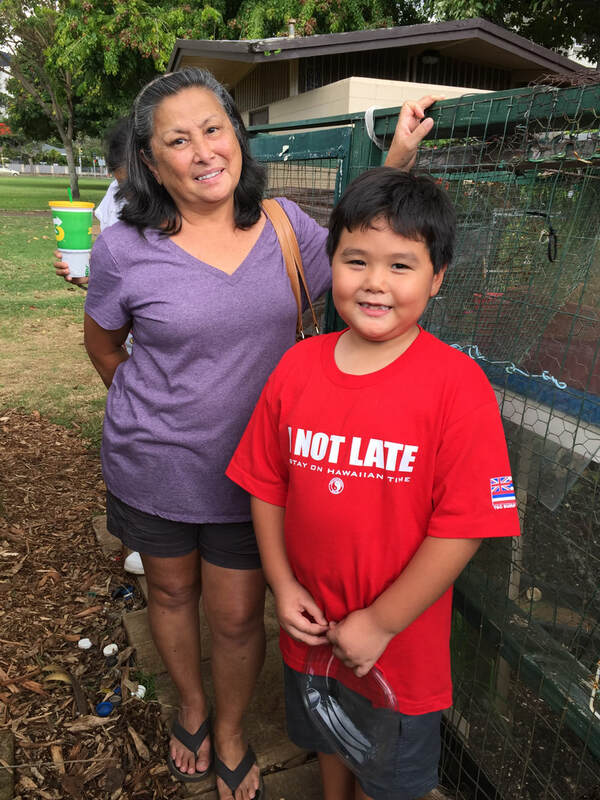 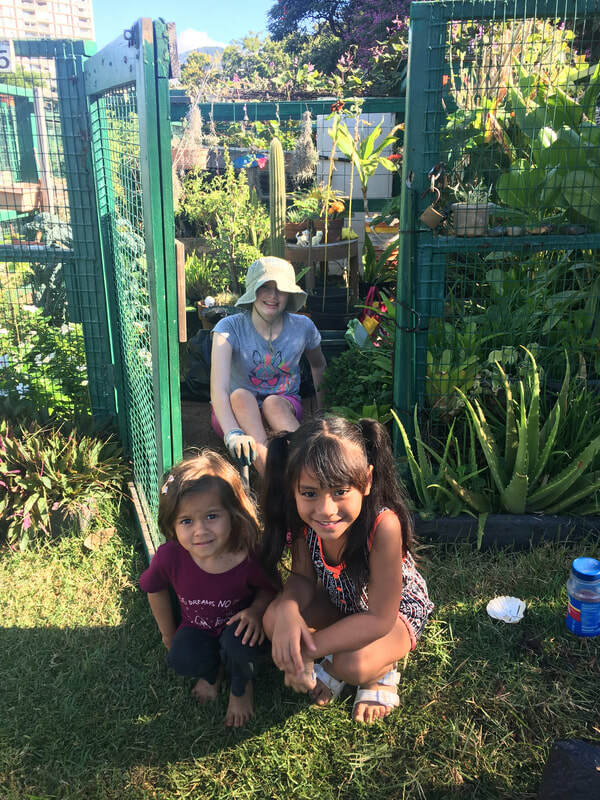 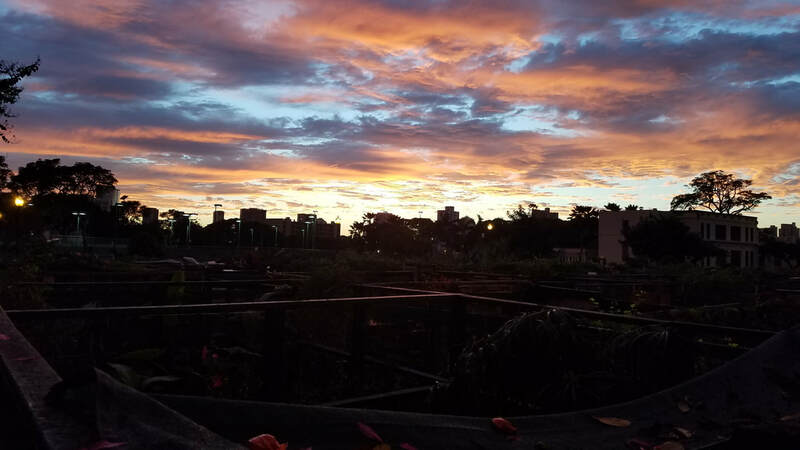 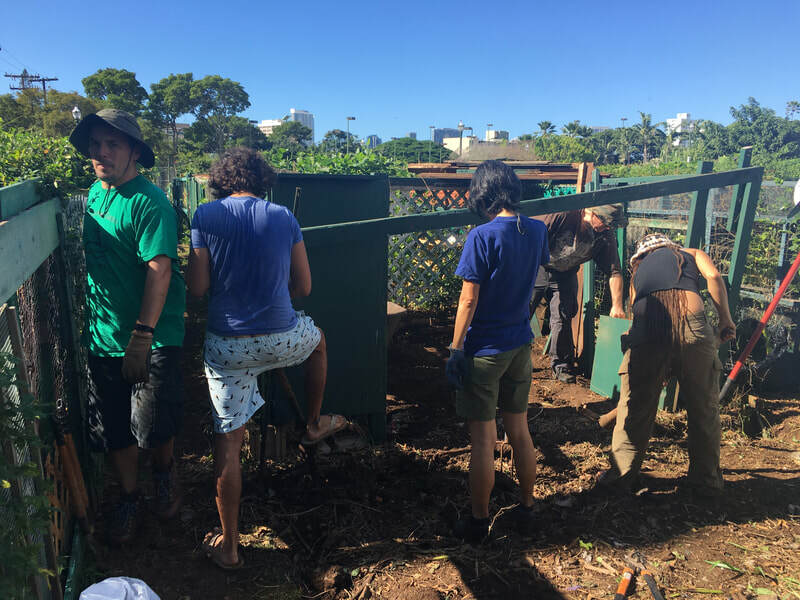 9/14/18 - Mahalo Pauline for representing our garden so well! 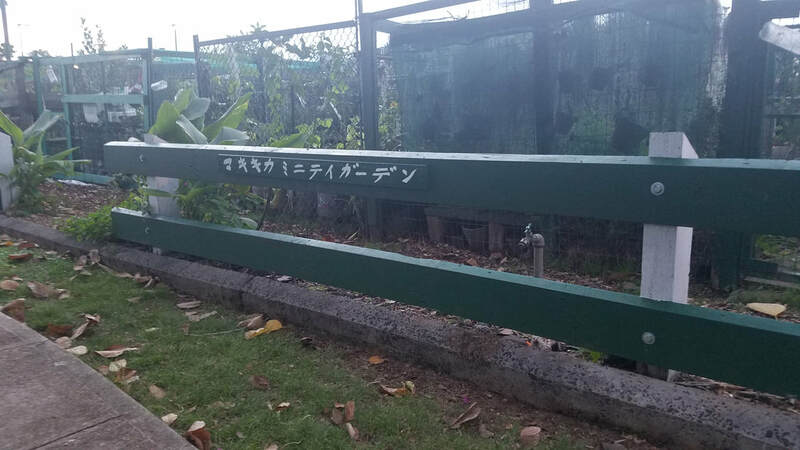 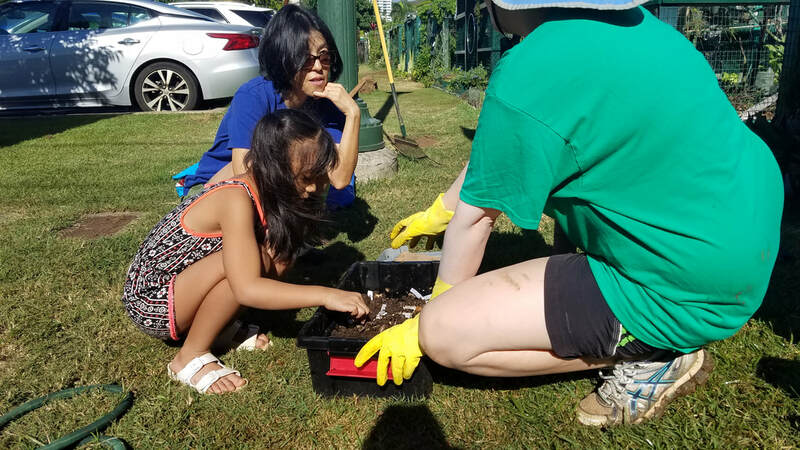 NOTE: One gardener is currently working on the Japanese sign, and volunteers are still needed for additional languages. 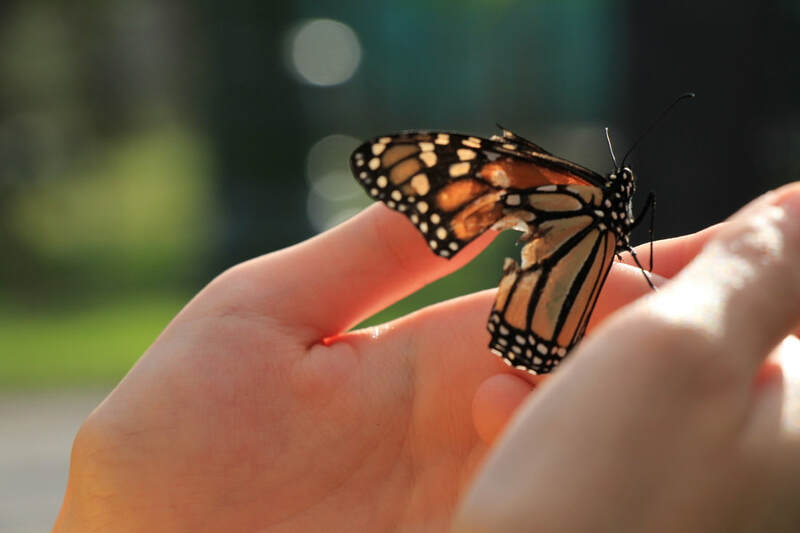 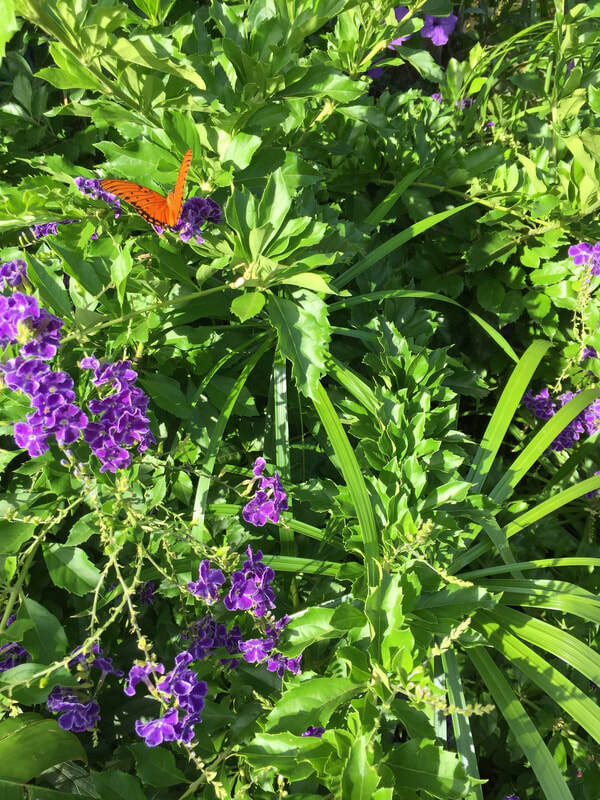 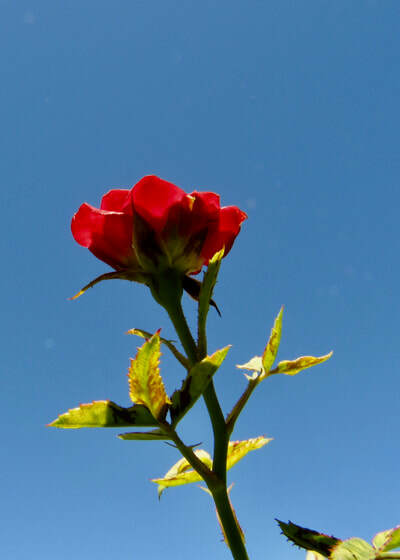 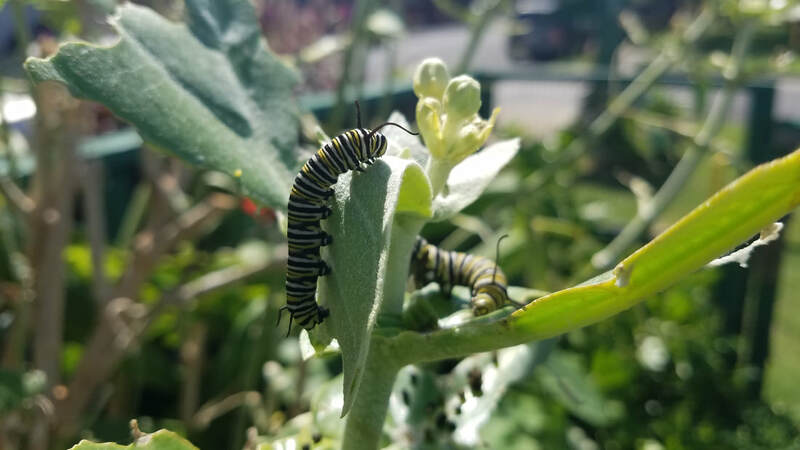 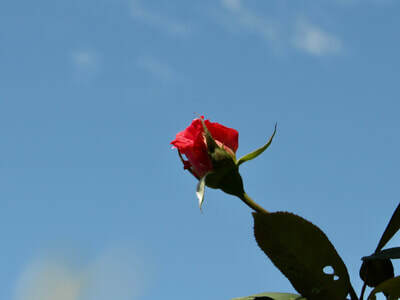 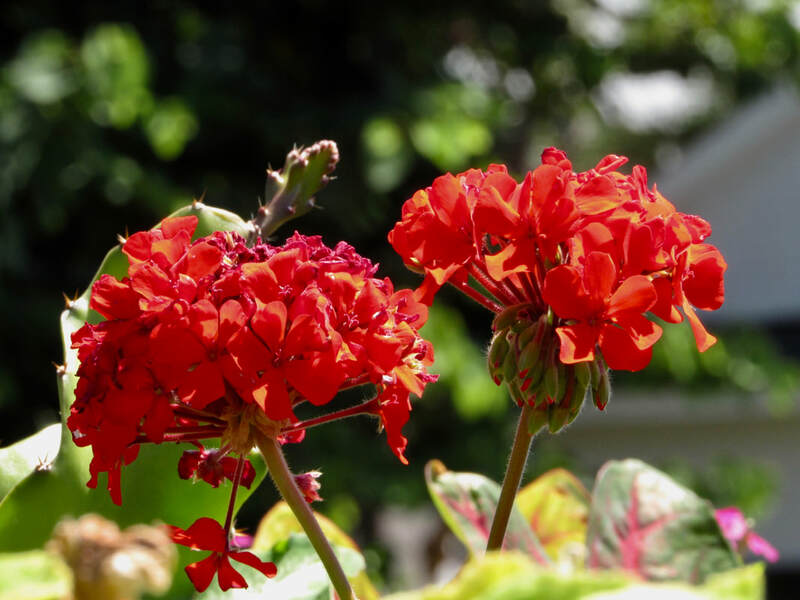 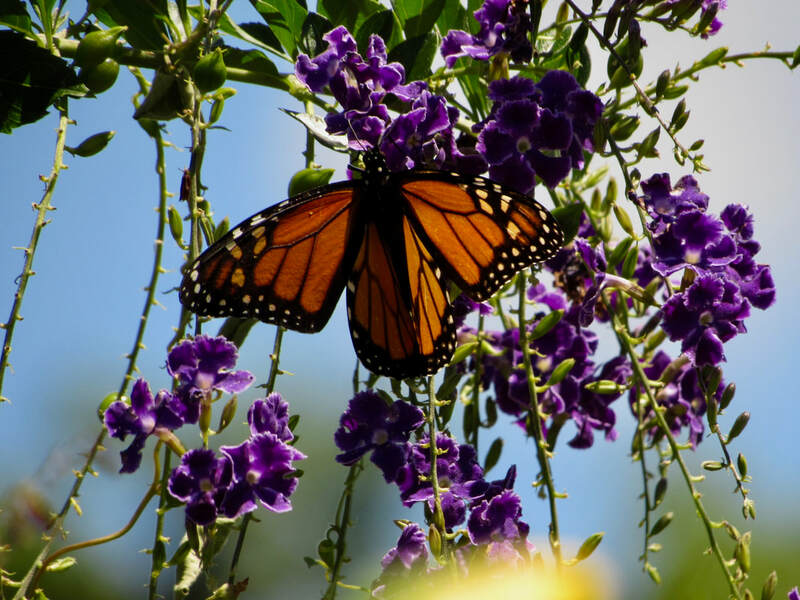 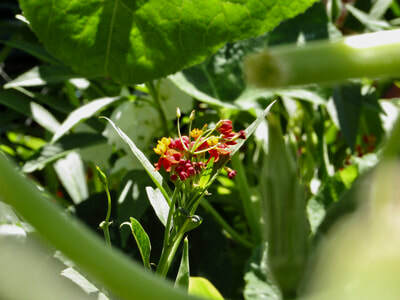 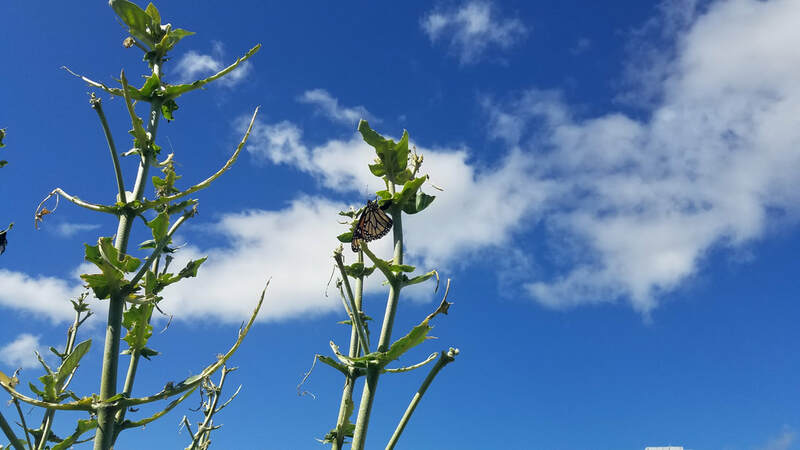 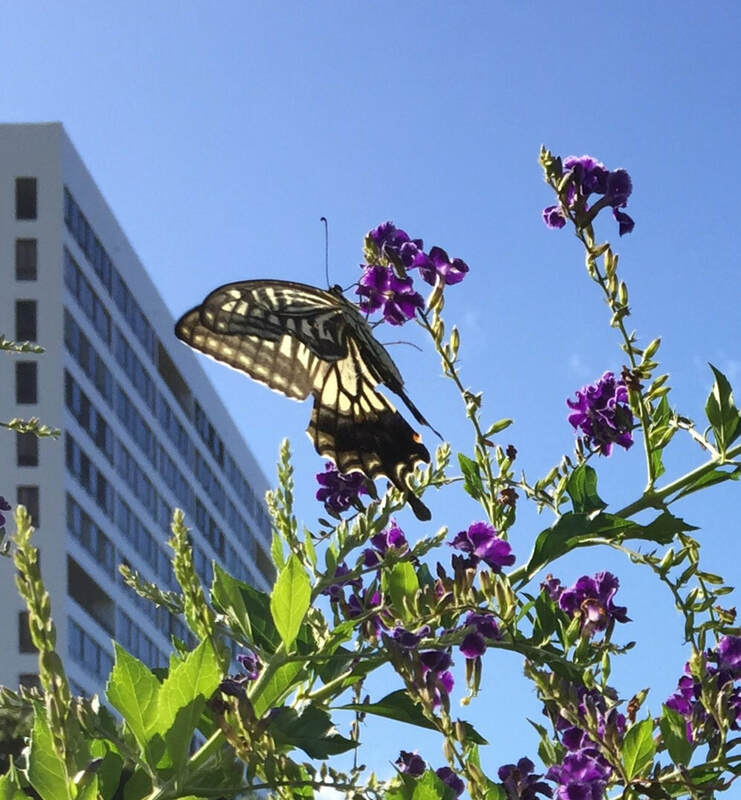 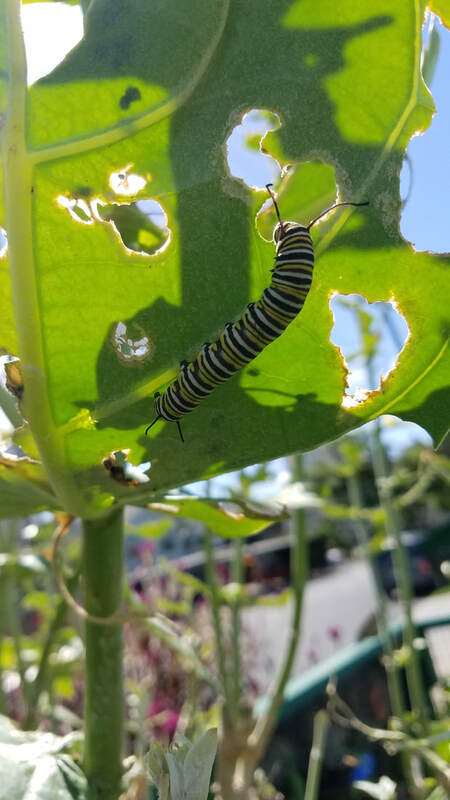 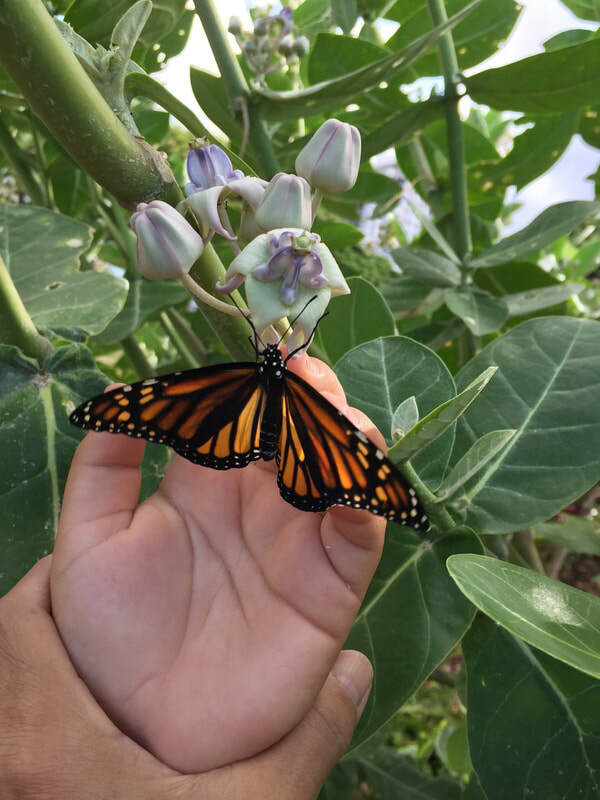 Crown Flower is known to attract a variety of butterflies and bees, so it is being permitted to exceed five-feet in height. 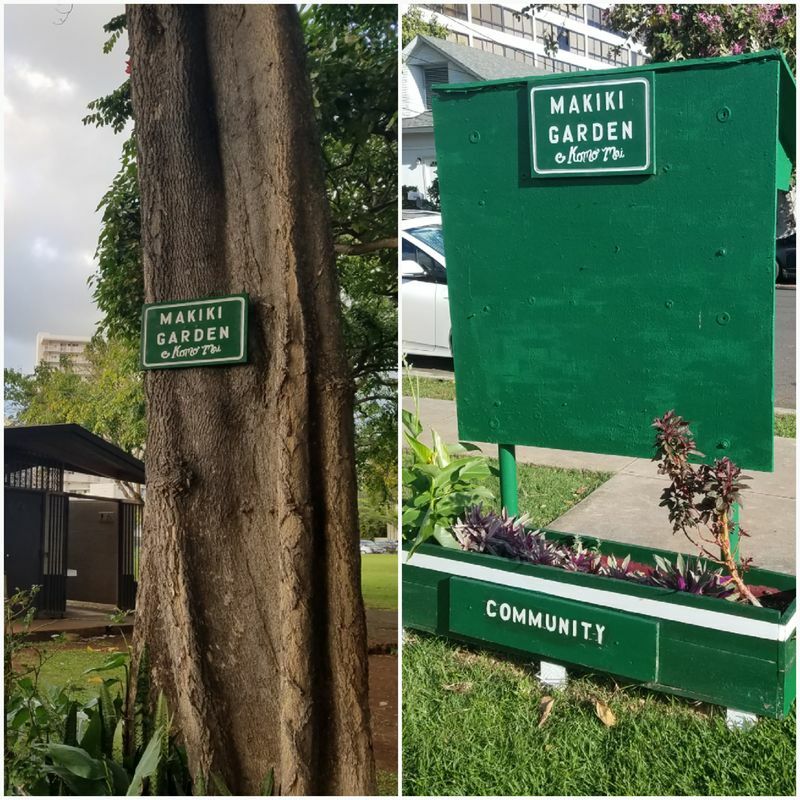 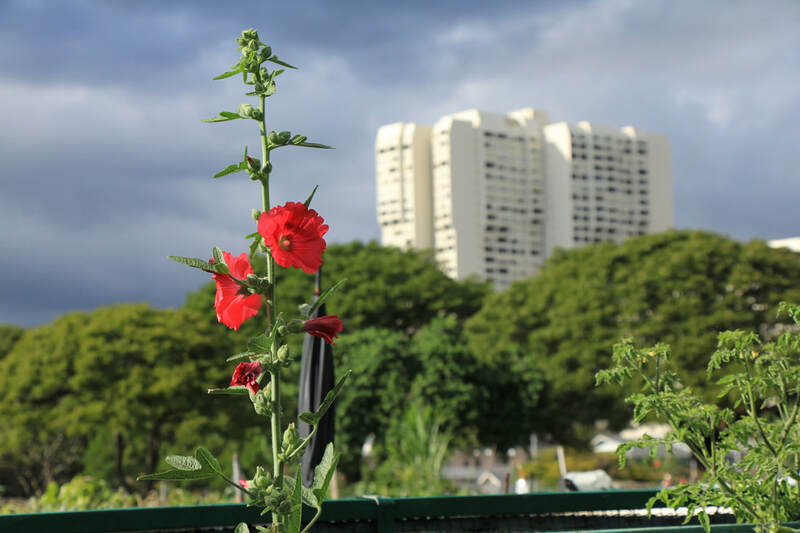 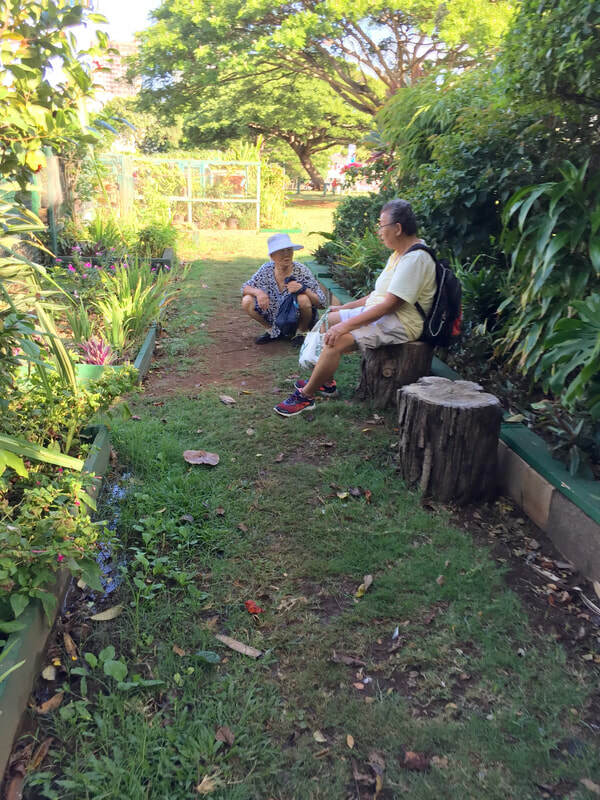 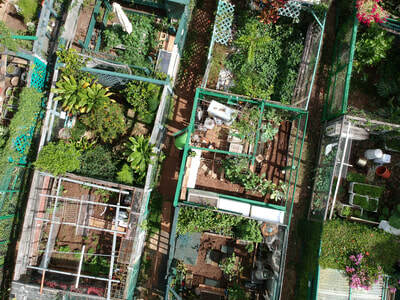 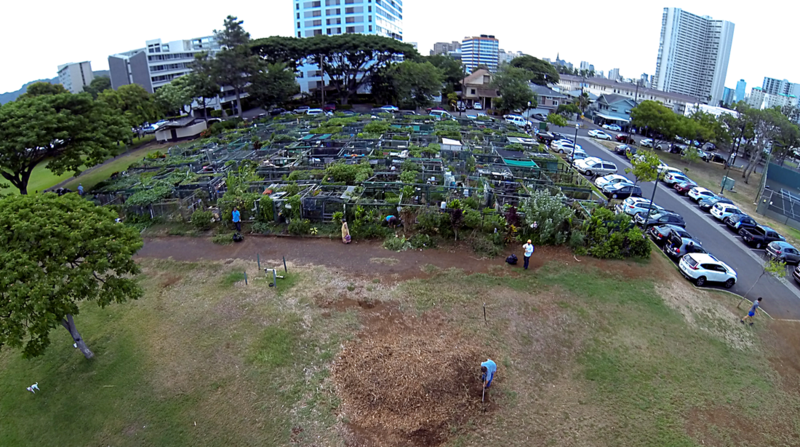 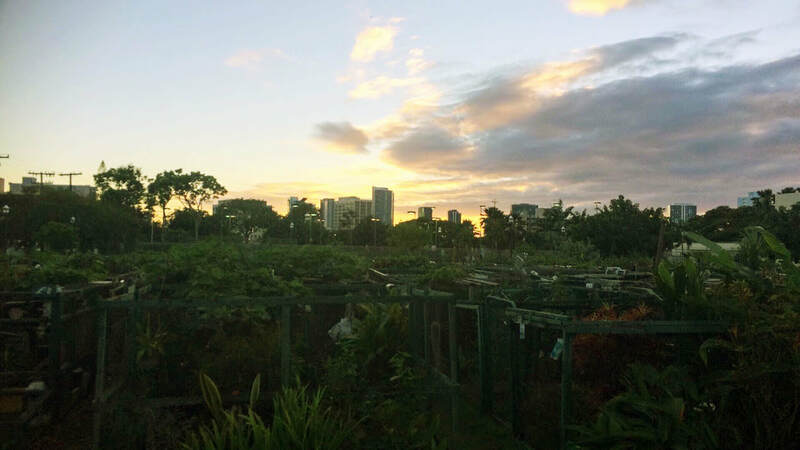 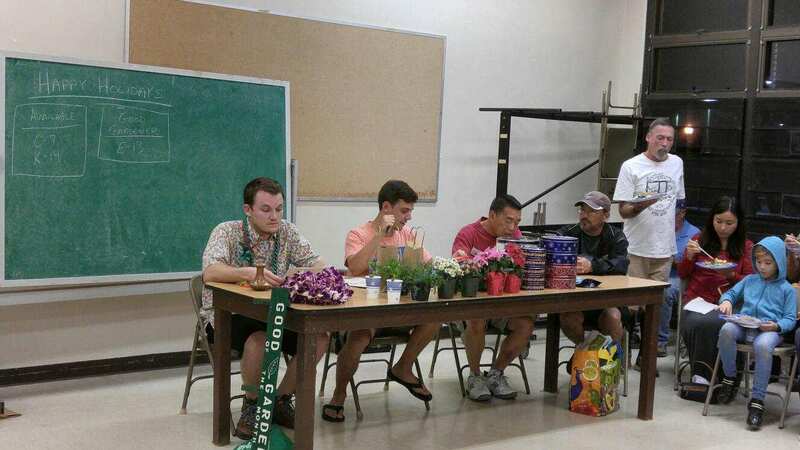 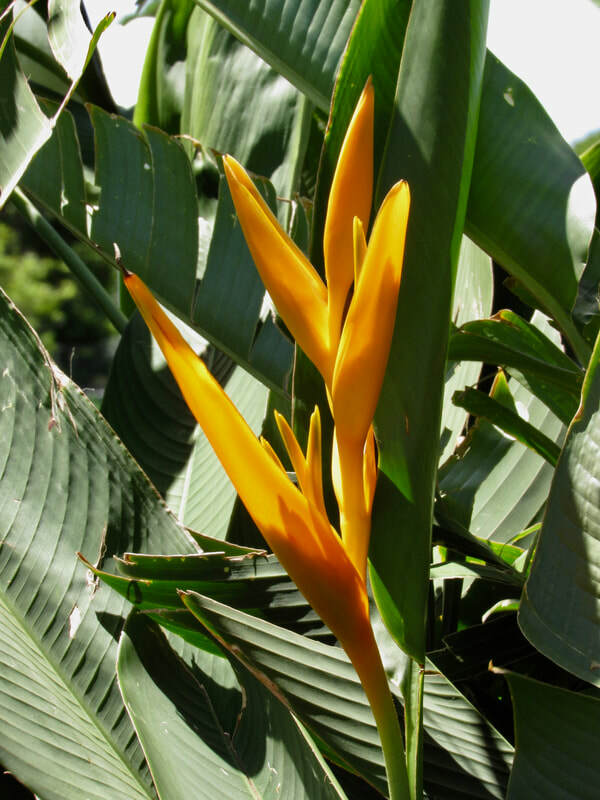 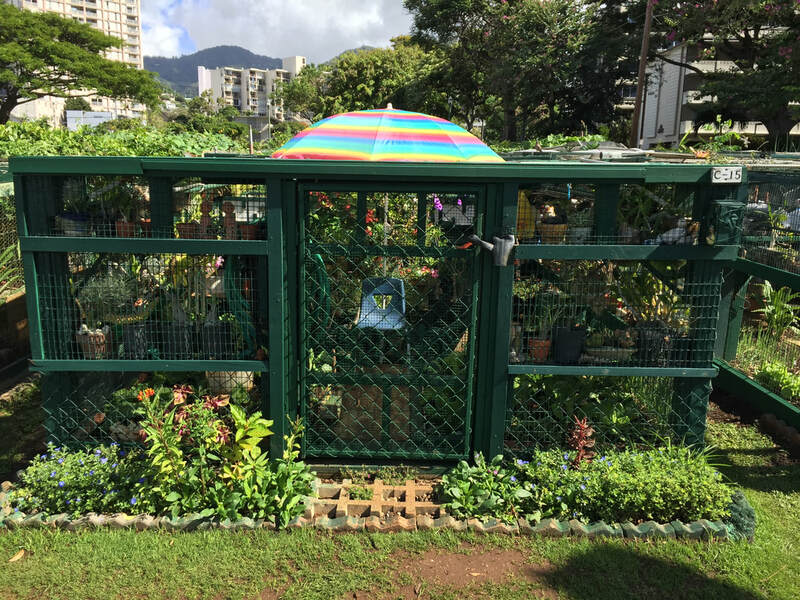 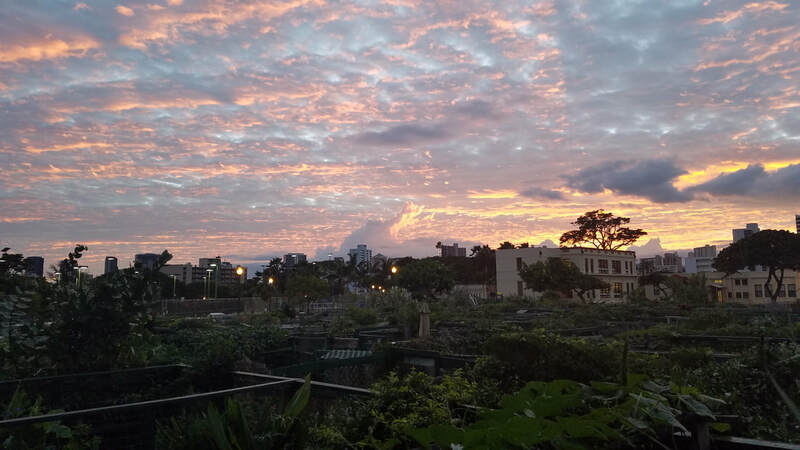 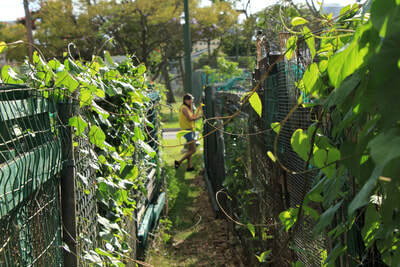 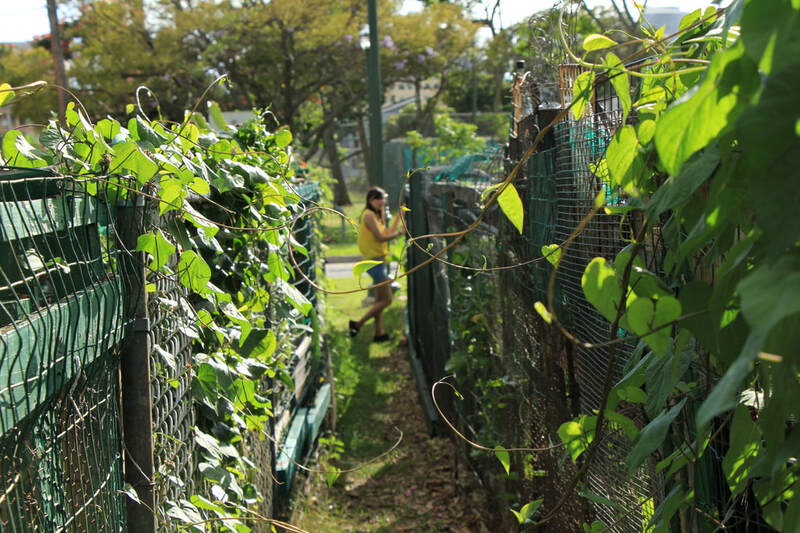 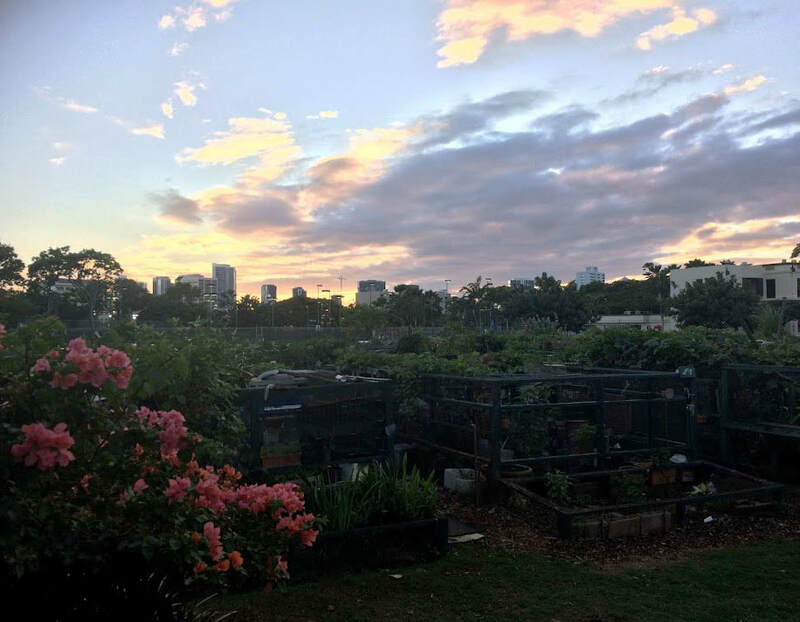 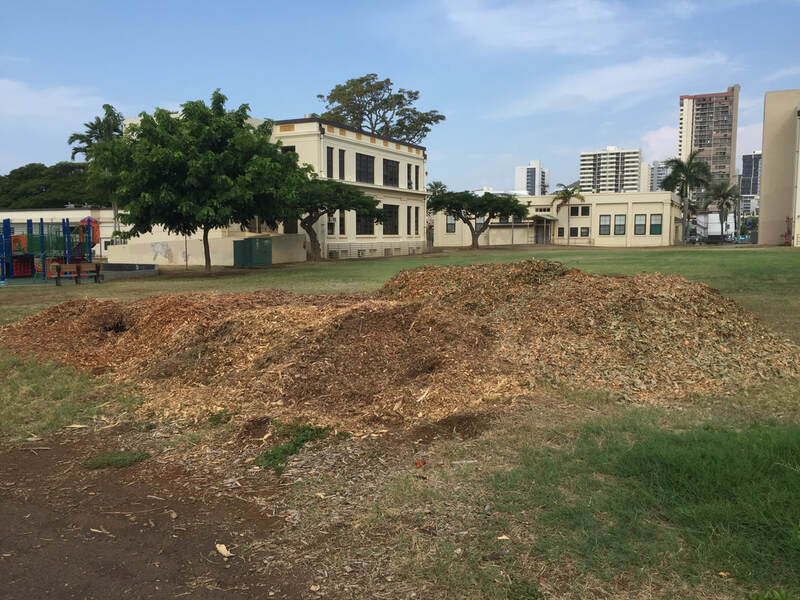 For over 60 years, Makiki District Park was the Experiment Station of the Hawaiian Sugar Planters' Association. 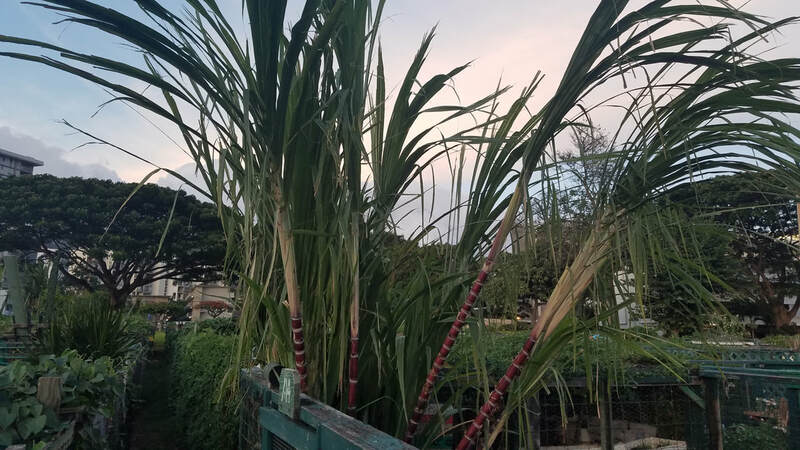 Because of this storied history, sugar cane is being considered a temporary plant and may exceed five-feet as part of its normal growing cycle. 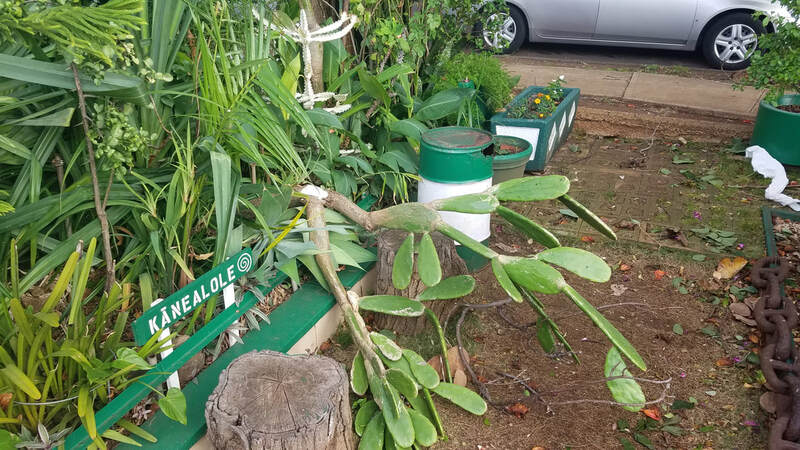 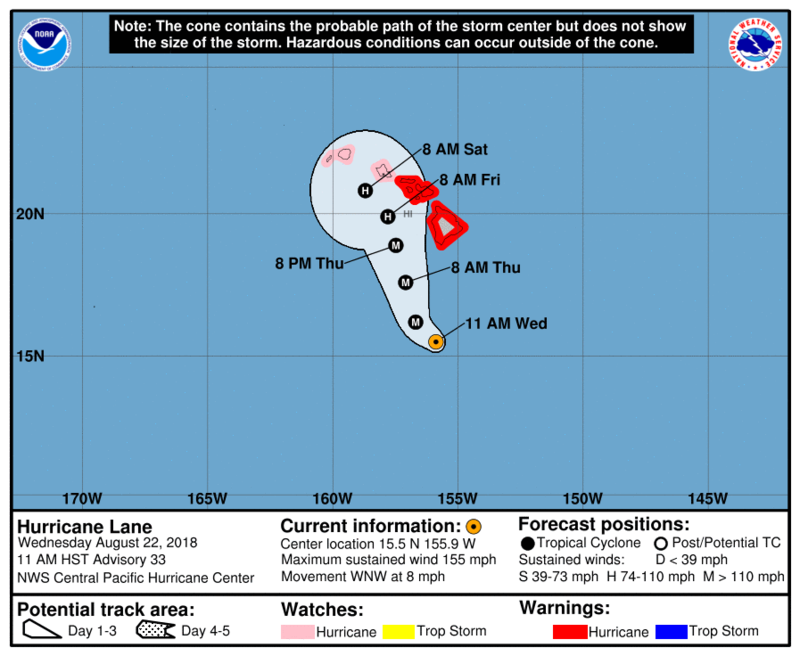 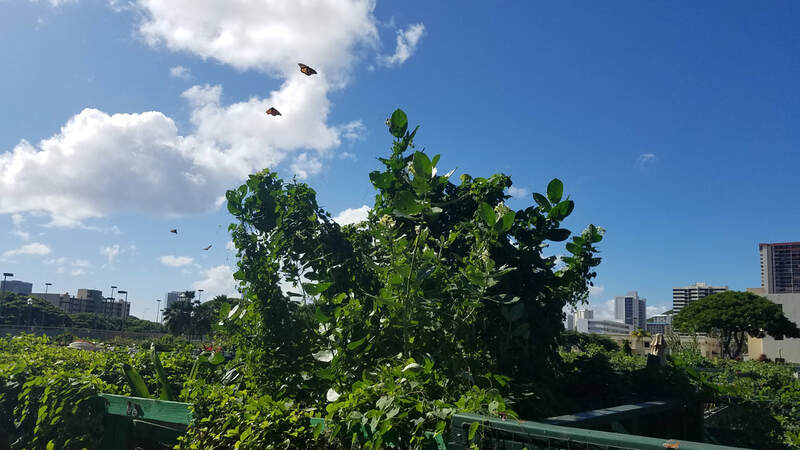 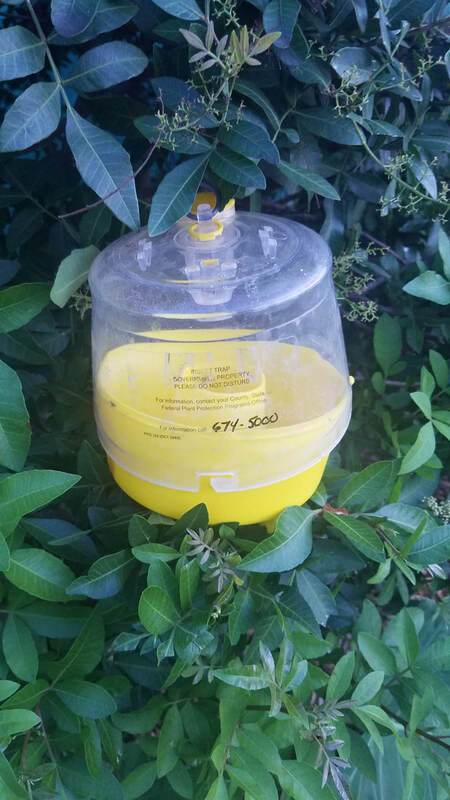 8/22/18 - Please prepare your garden for the incoming hurricane. 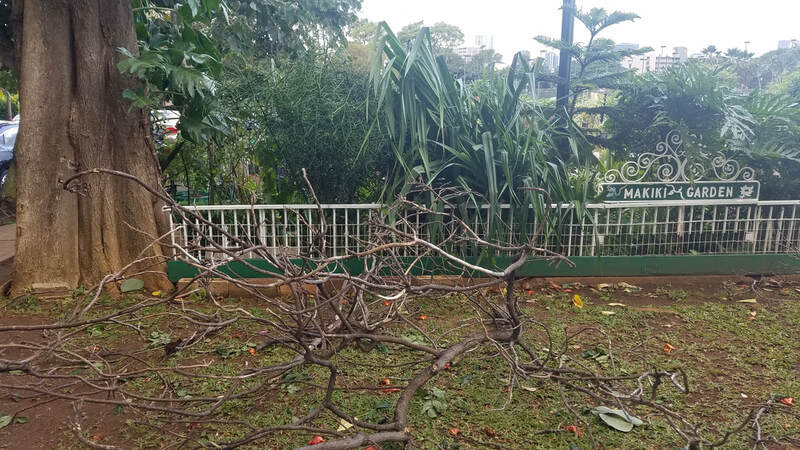 Make sure to secure personal items and anything susceptible to strong winds and heavy rains. 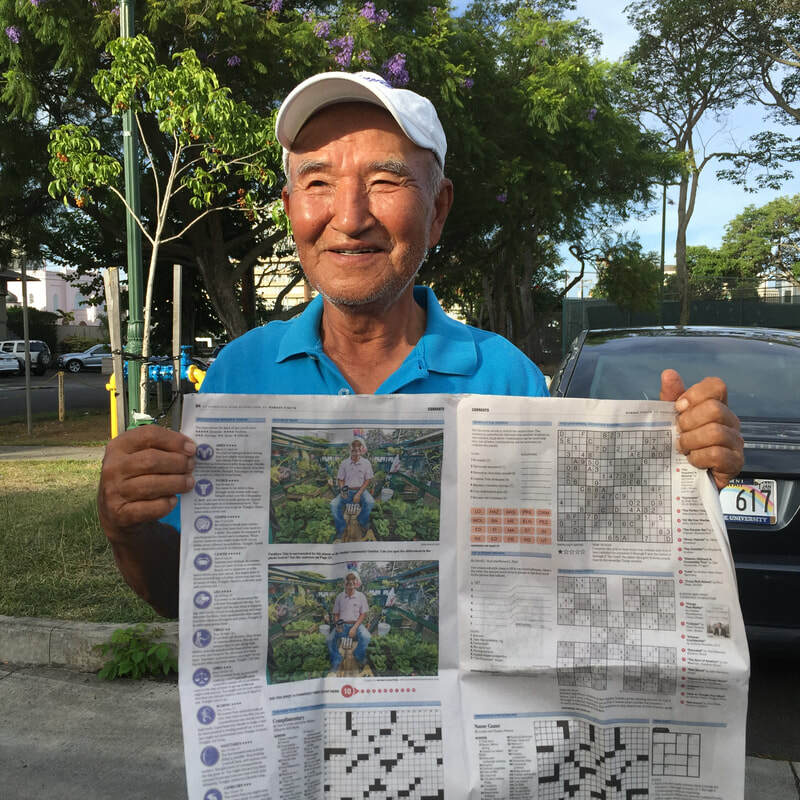 7/22/18 - Look who made the Honolulu Star-Advertiser! 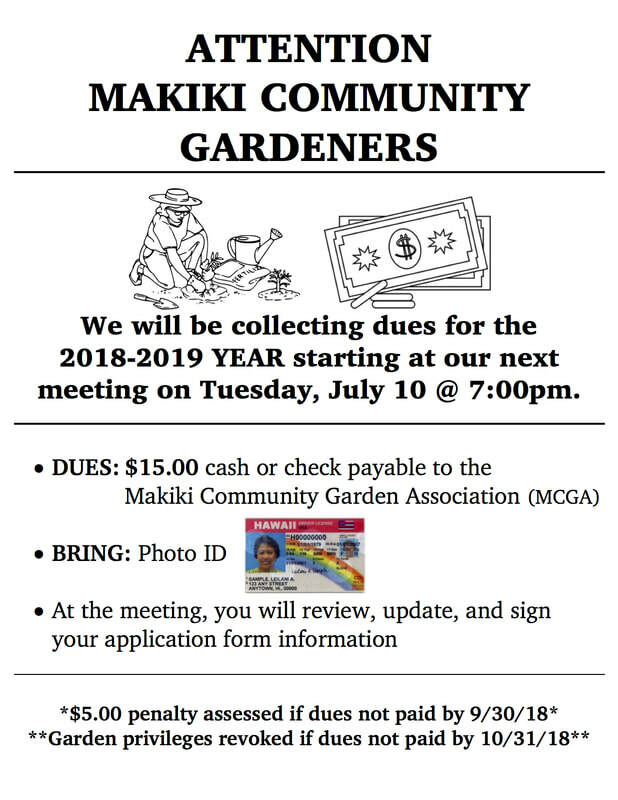 Voting on rule change will take place at our June 2018 meeting. 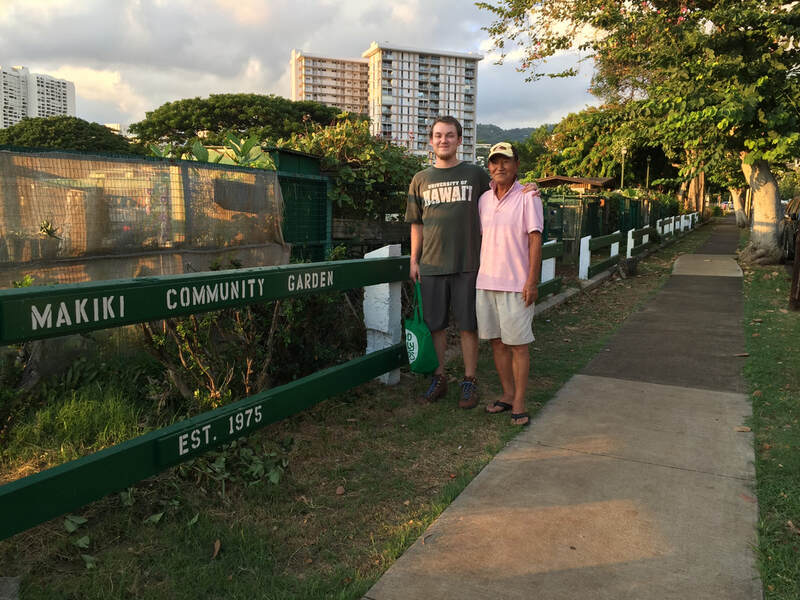 Carl is a drone hobbyist who will soon have FAA Part 107 certification and be available for commercial operations. 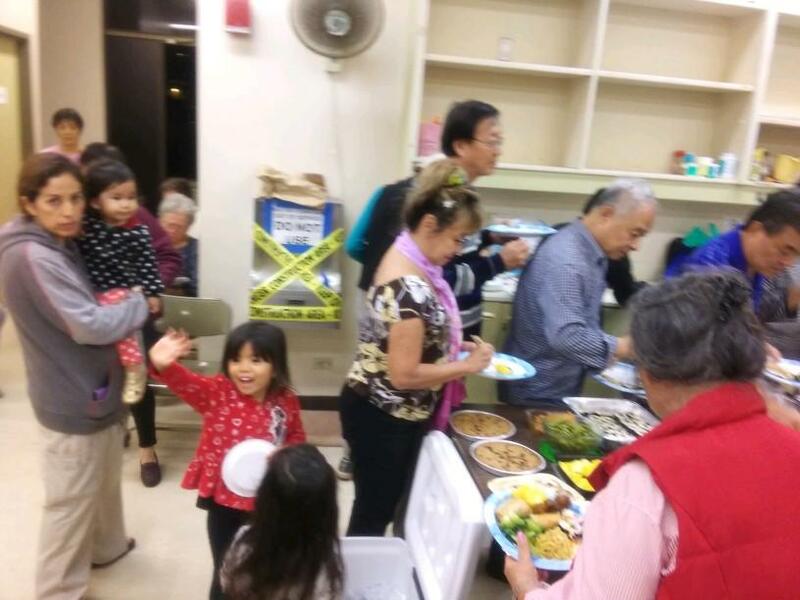 12/12/17 - Our December Holiday potluck party was a great time! 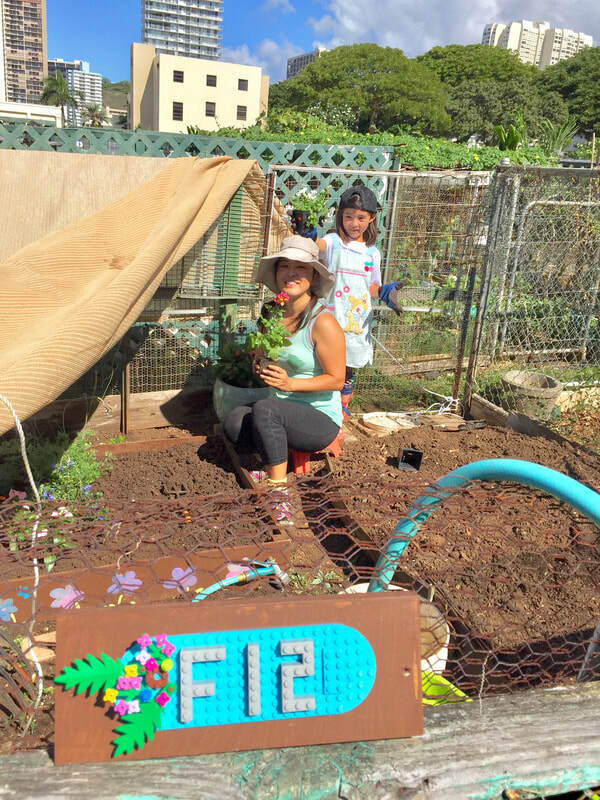 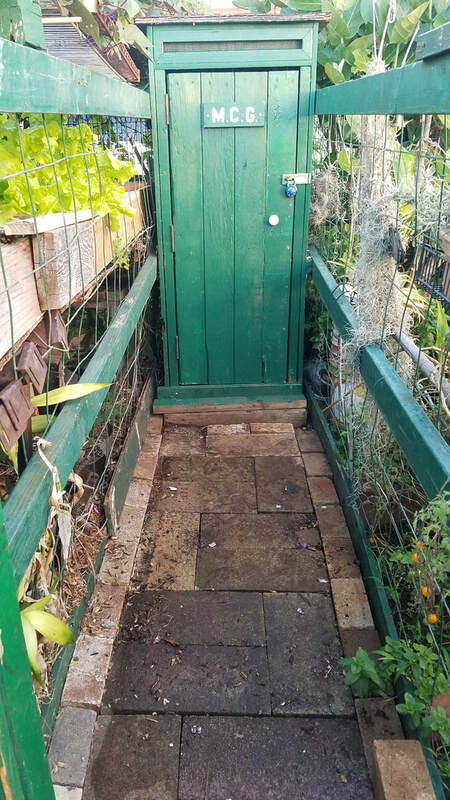 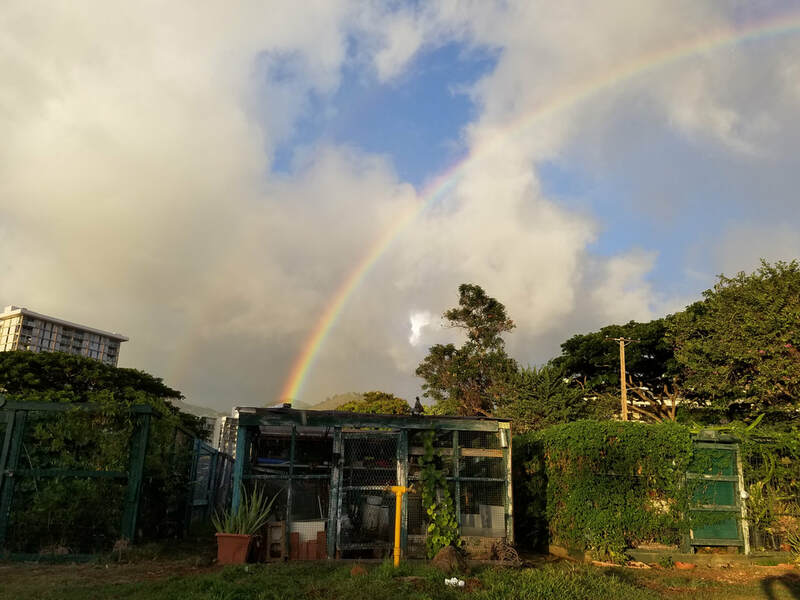 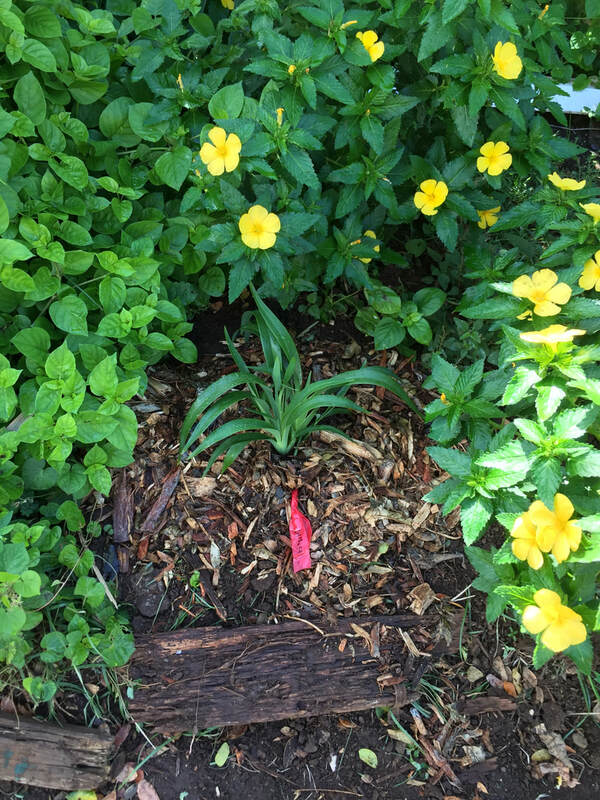 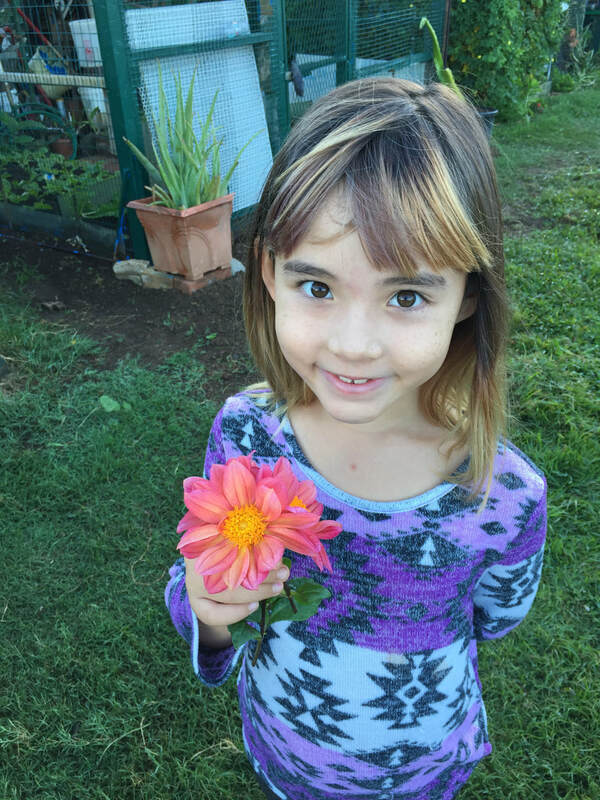 11/18/17 - Chelsea’s flowers she grew herself in her Makiki Garden plot! 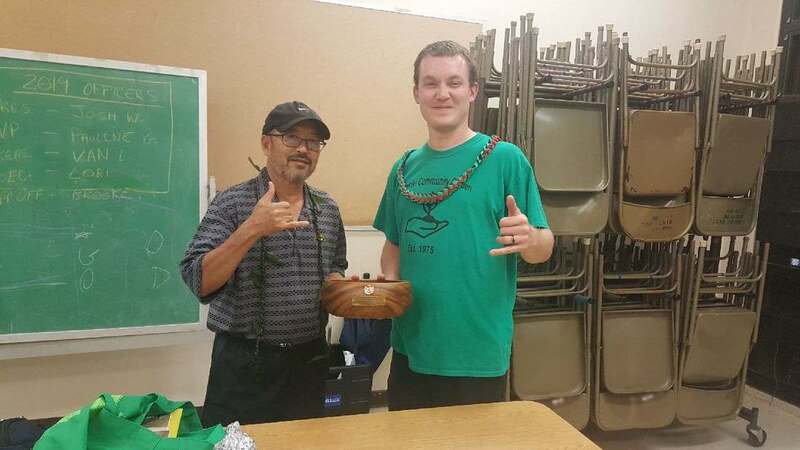 10/10/17 - This evening's October meeting door prize winner! 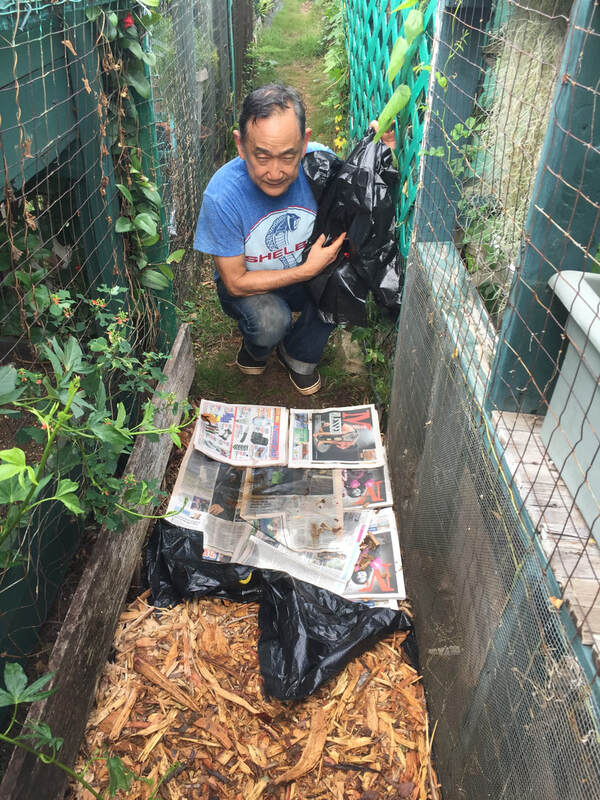 Layer recycled newspaper or cardboard, plastic, newspaper again, then wood chip mulch. 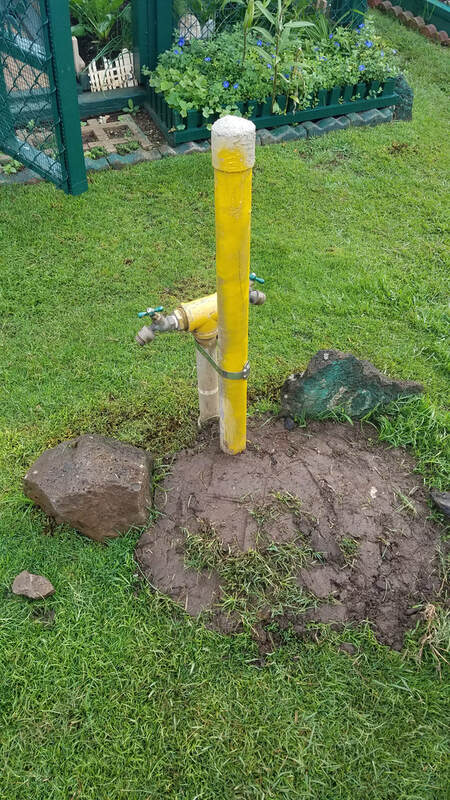 Water thoroughly and stomp on it to compact it down. 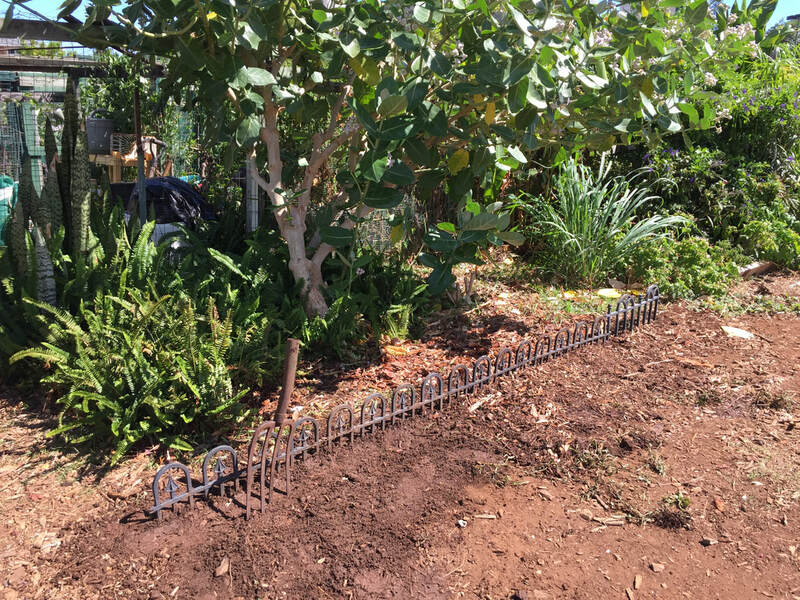 It is easy to do and requires very little maintenance to pick out the occasional weed and grass growth. 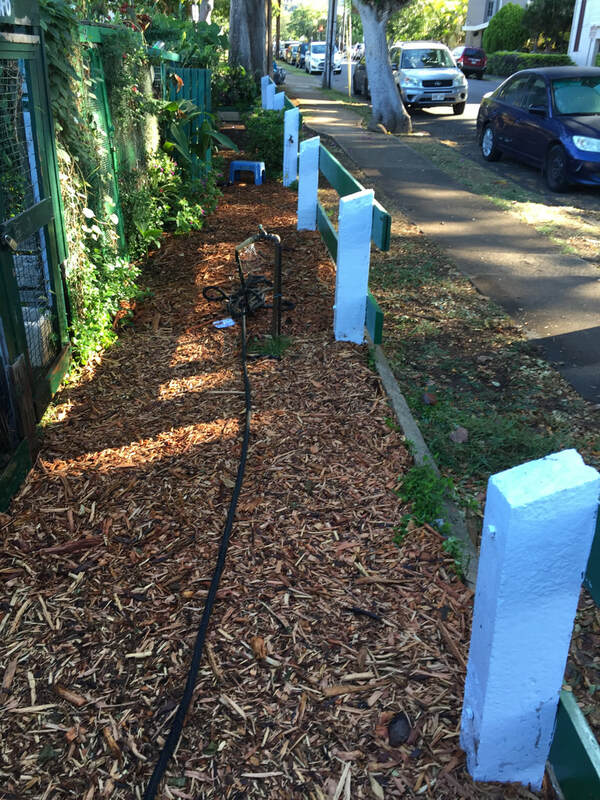 This sustainable pathway solution will last for years! There is even a community wheelbarrow to haul the occasional replenishment of mulch covering which is readily available to our gardens! 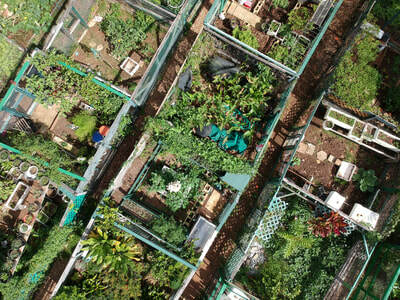 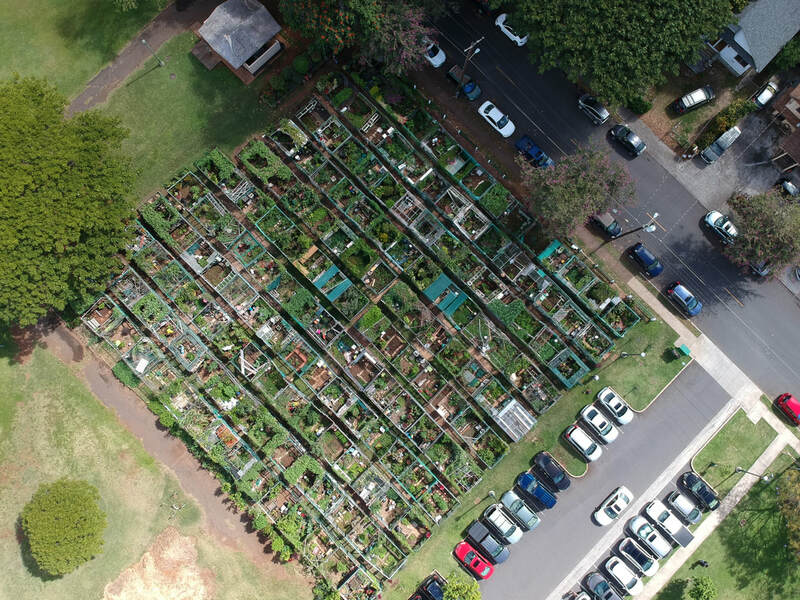 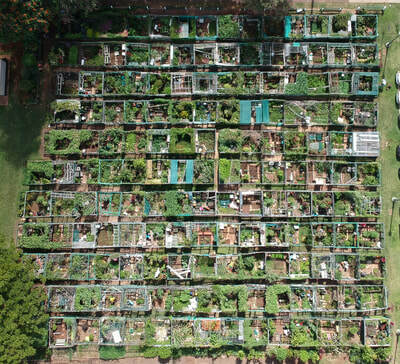 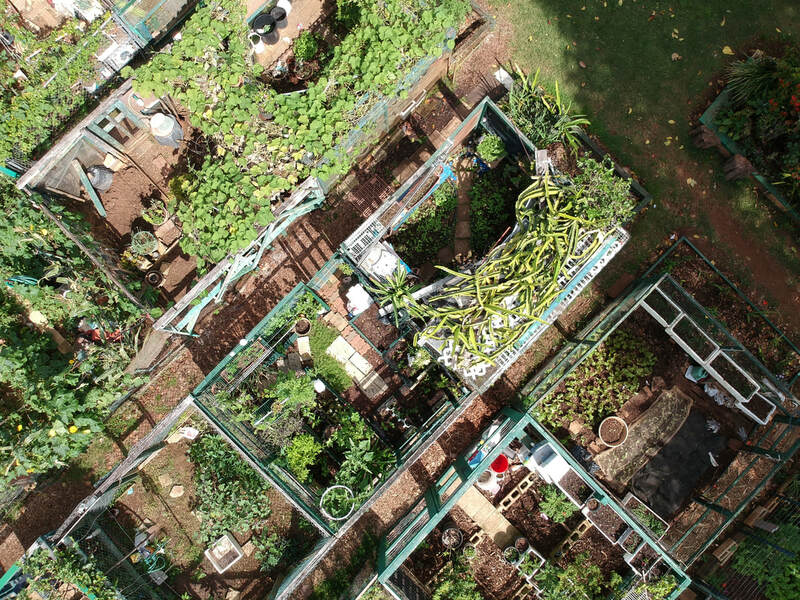 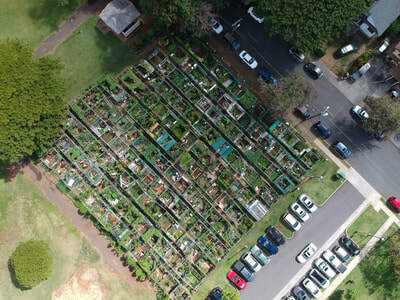 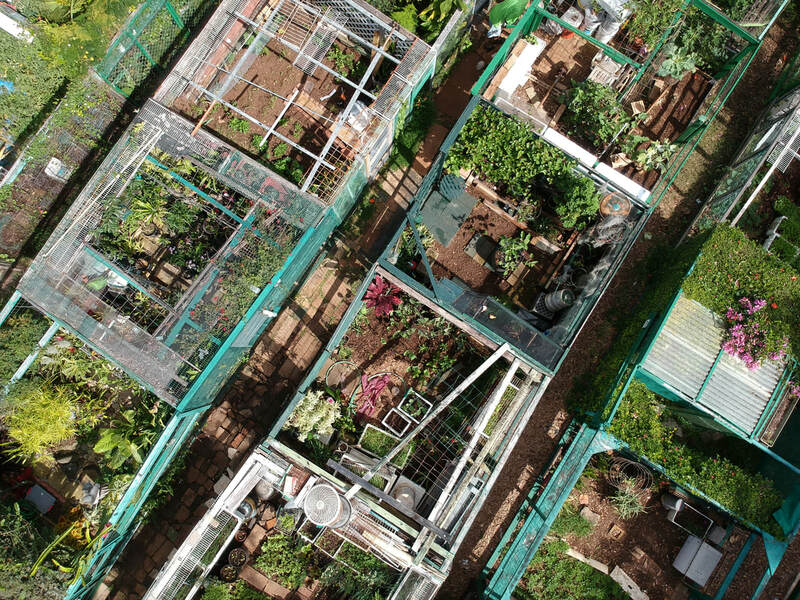 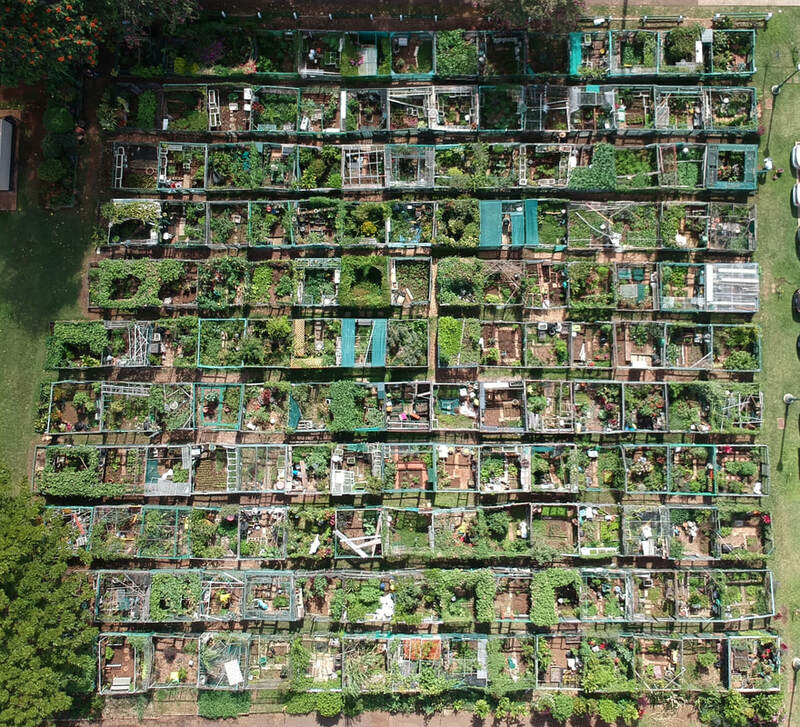 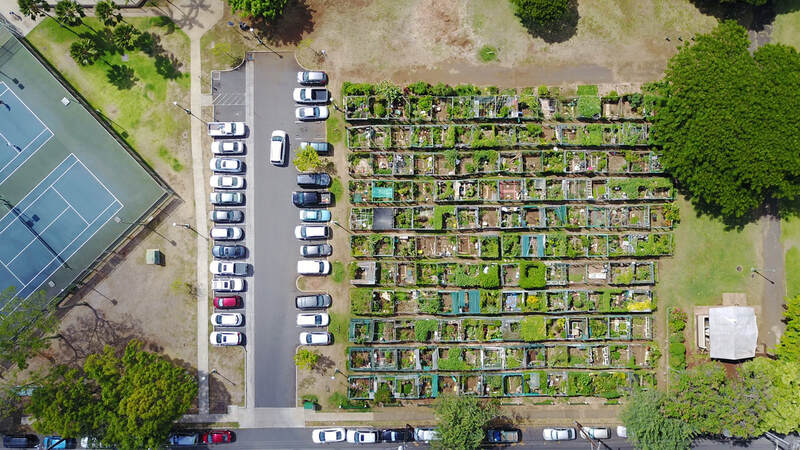 These amazing drone shots were provided by our fellow gardener in A-15. 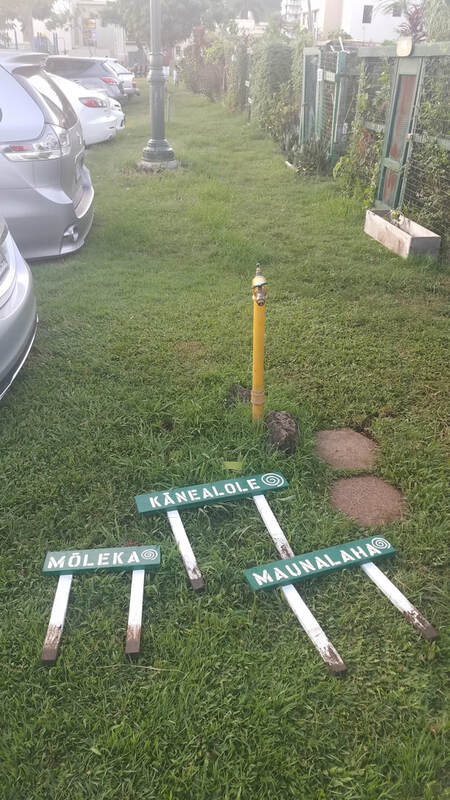 Local photographer Clark Little emailed this photo to us. 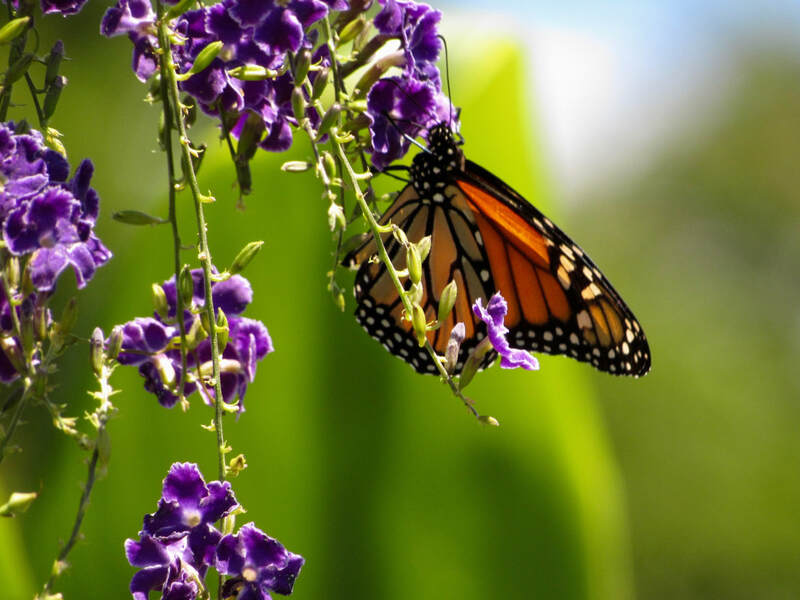 Check out his website at www.clarklittlephotography.com.